Please take a moment to read BOOK CONDITION RATINGS which I have started using to better describe the condition of the books in my library. LEGEND: NA - Not Available, $NFS - Not For Sale. Listed by AUTHOR, then Alphabetically. Also included is a group of woodblock printed books that give us some history of our studies but not the true information that we need to study sword fittings. 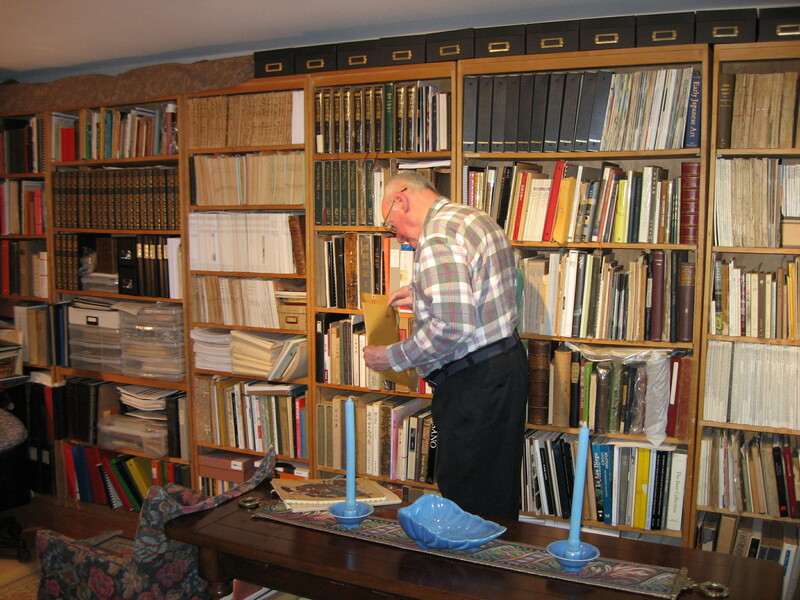 Over the years, hundreds, if not thousands, of pieces have passed through Robert Haynes' hands, however for various reasons he has kept only 189 objects for his own personal collection. 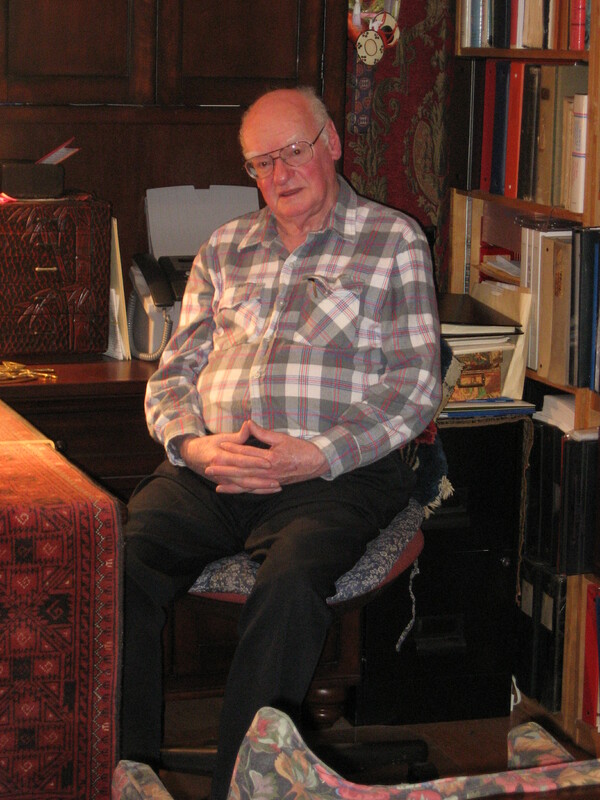 In his own words, these are not considered merely as "important" or as "masterpieces" but as 'study' pieces that have added to the knowledge of the author over his collecting years. Of course coming from such an esteemed expert on fittings, they are indeed important works, especially when put into context with an explanation, and catagorized chronologically. This is exactly what this book sets out to do. ROBERT HAYNES AUCTION CATALOG's by Robert Haynes, LTD.
E-MAIL ( elliott@shibuiswords.com ) for PRICES. Vols. 1 - 10 of the Robert Haynes auction catalogs. Softbound, 1 & 2 are 11" x 9" and the rest are 8" x 10", more than 2000 pages total. What the Compton auction catalogs are for swords, Haynes' catalogs spanning 1981-84 are for the field of tosogu...arguably more so. Robert Haynes is one of the most knowledgeable kodogu people on earth and he used these catalogs as a teaching tool. There are thousands of fittings lots arranged by school, and swords, armor, and woodblock prints and assorted fine art, and these lots are given a much more thorough description than you usually find in auction catalogs. The art being auctioned runs the spectrum from entry level to the very best, including some important collections. All pieces are illustrated, the descriptions are thorough, and prices realized for 7 of the catalogs are included. 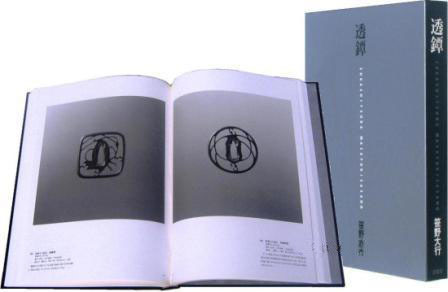 An added value to the series was the translation of Dr. Torigoye's 'Tsuba Geijutso-Ko' (1960), discussing in detail the work of various artists and schools of tsuba art. In the later issues at the back there are lessons on woodblock print appreciation. CLICK THE LINK ABOVE OR IMAGE TO SEE COMPLETE LISTING OF HAYNES AUCTION CATALOGS AVAILABLE AND THE COST OF EACH. 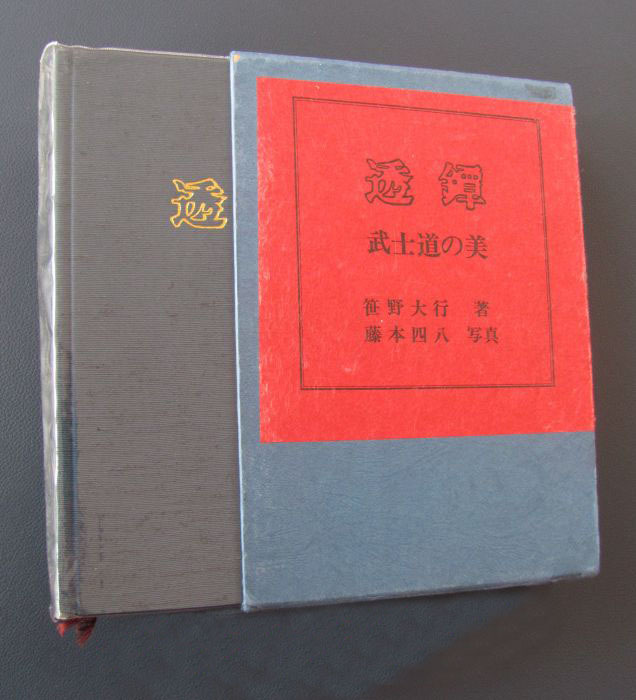 With 12,560 entries, Haynes' compilation of documented tosogu artisans is the most comprehensive in any language. This index, the result of five decades of study, presents readily accessible information for each entry. 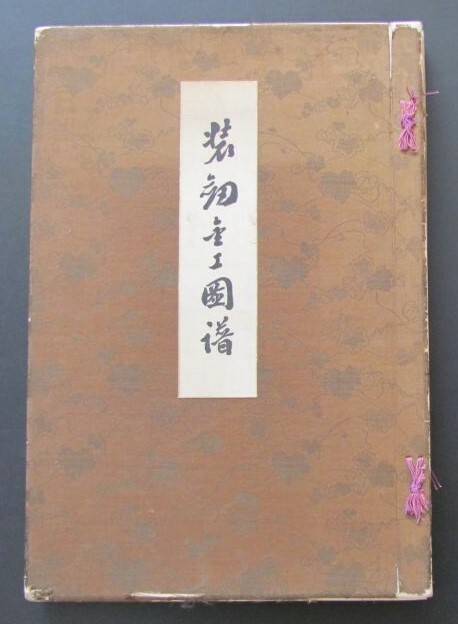 Biographical information includes: name(s) alphabetized by its romanji transliteration accompanied by the kanji, kakihan if used, period and location active, account of associations family/school, and a listing of sources of authentic signatures for each entry. In addition, places of residence, vital statistics, notes of pertinent interest, reference to other publications, listing of source data, cross-referencing to alternate readings, etc. 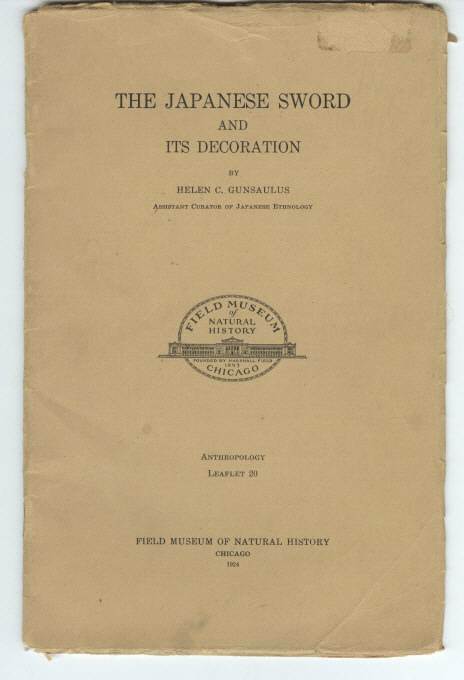 The physical configuration of this publication is impressive as much thought went into its layout with appreciation for the needs of the collector and student. The primary reference being Wakayama's Toso Kodogu Meiji Taikei. 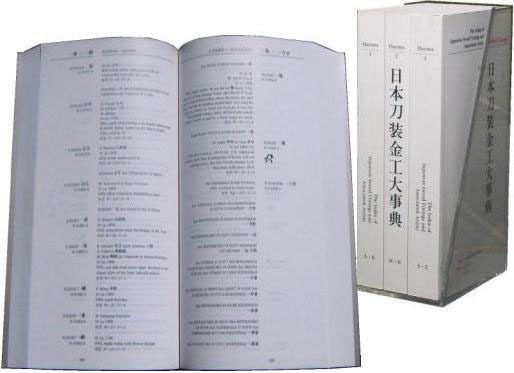 The index is followed by a listing of kanji presented by stroke count, and a bibliography of western and Japanese texts cited. The three volume set is made a ready reference in its custom book stand. Index in new condition, Index with 2460 total pages in three volumes, each volume measures 5 3/4" X 11 1/2". "In the introduction to the Index of artist's names I wrote that the work was a current reference and that new information would be added. Well, after ten years, the 1st Addendum contains these additional names. Even now new material will be forthcoming from students and friends as I continue my effort at collecting all the material I can assemble. I hope that the addition of these 320+ artists names will add to the research of all. "First I must say that I have achieved the goal that I wanted to meet, and have mentioned so often, of reaching 13,000 names in total for my INDEX. Well, with this addenda I will have a total of 13,284 names. Thus we have added 723 names in the last 15 years. purchase together for the cost of $230.00 plus postage. This is an English translation and expansion of Dr. Torigoye's Tsuba Geijutsu-Ko. It covers the history and characteristics of the major tsuba groups. There are not many illustrations, but the text is very valuable. Portions of this work first appeared in the Haynes Auction catalog series in the 1980's. It was then published in the NCJSC newsletter from 1994-1997 and then as a photocopied, bound edition in March 2000. 8 1/2" x 11" softcover. Two noted authorities present an exhibition of tsuba assembled from important European collections. Includes high quality color and b&w photographs of iron and soft metal works. The forward addresses both the history of the collections and fittings scholarship. Text in English, French, and German. 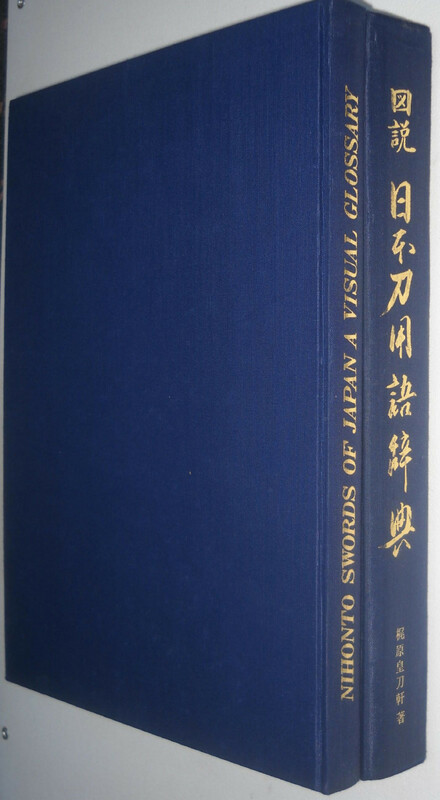 No.146 of 300 special, numbered editions to include the author's 7-page bibliography of nearly 400 tosogu titles. 64 pages, 8 1/2" x 12" hardcover. This text includes 36 color and 117 b&w photographed examples. All tsuba shown actual size, while several include enlarged signature detail. All text in both French and English. 156 pages, 8 7/8" x 7 7/8" soft cover in 'As New' condition. 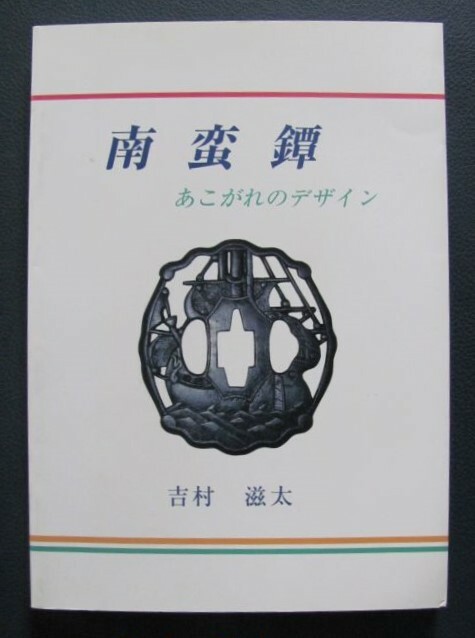 Origin of Akasaka tsuba, genealogy of Akasaka tsuba craftsman, style of Akasaka craftsman from generation to generation, various problems of Akasaka tsuba research, the appreciation by Akiyama Kyusaku, appreciation of Akasaka tsuba. EARLY JAPANESE SWORD GUARDS: Sukashi Tsuba by Sasano Masayuki, 1974 FINE $260.00. 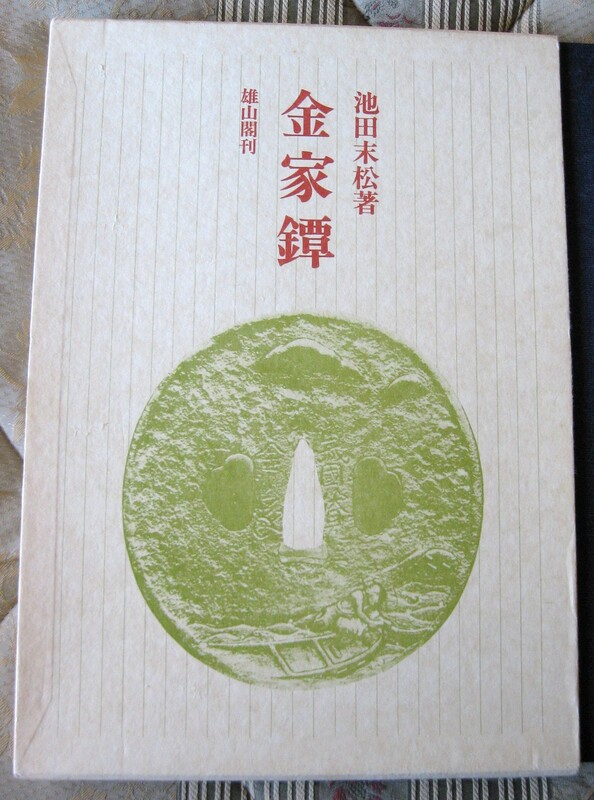 A landmark text by a noted Japanese authority on tsuba. 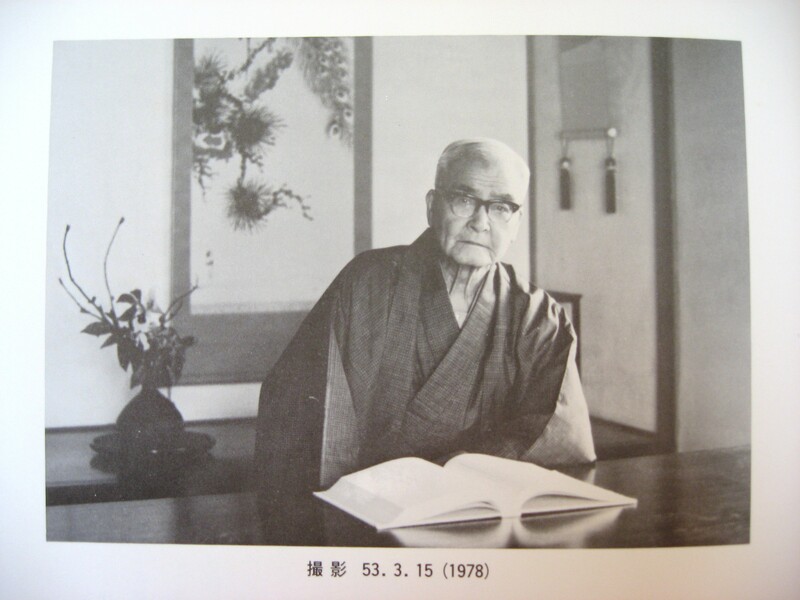 Starting with 26 pages considering the historical development of tsuba and the major schools, Sasano presents a solid foundation for the selected examples that follow. 216 Examples are shown; one example per page supported by assessments which include the author's insight on aesthetic qualities - an important consideration for understanding artistic works. Care and preservation are also addressed. Full size b&w photos; glossary. First edition with 284 pages, 7 1/2" x 10 1/2" hardcover. Extensive descriptions and details, a unique work by an equally unique and progressive scholar. 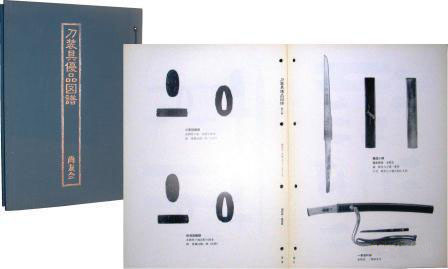 Published in 1979, this text focuses on the changing form of Uchigatana Tsuba, Kozuka, and Kogai while demonstrating that the earliest forms can be traced back far earlier than previously held. 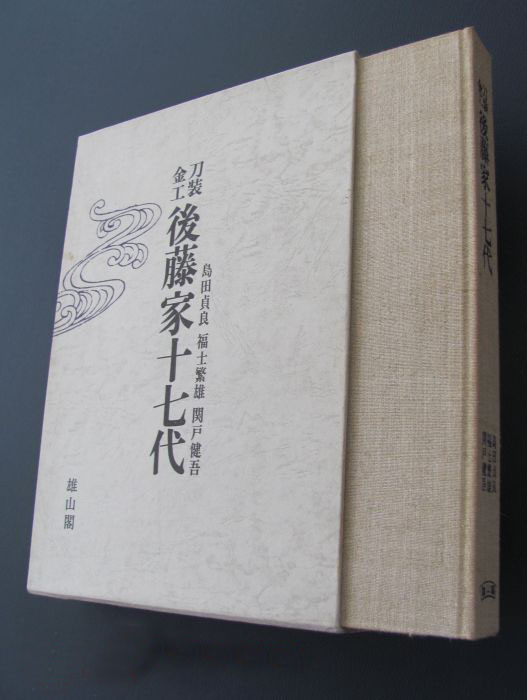 White Cloth, Paper Labels Front Cover and Spine, Plastic slipcover and original cloth covered board case. Text in Japanese, Many illustrations of Tsuba, Swords, Kogai and Kozuka, all picture captions are translated into English. Limited to 2000 copies, of which this is # 1606. First edition with 257 pages, 10.5" x 7.5" hardcover with slipcase. Near Fine. 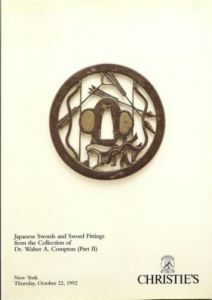 One tsuba per page with facing Japanese caption. 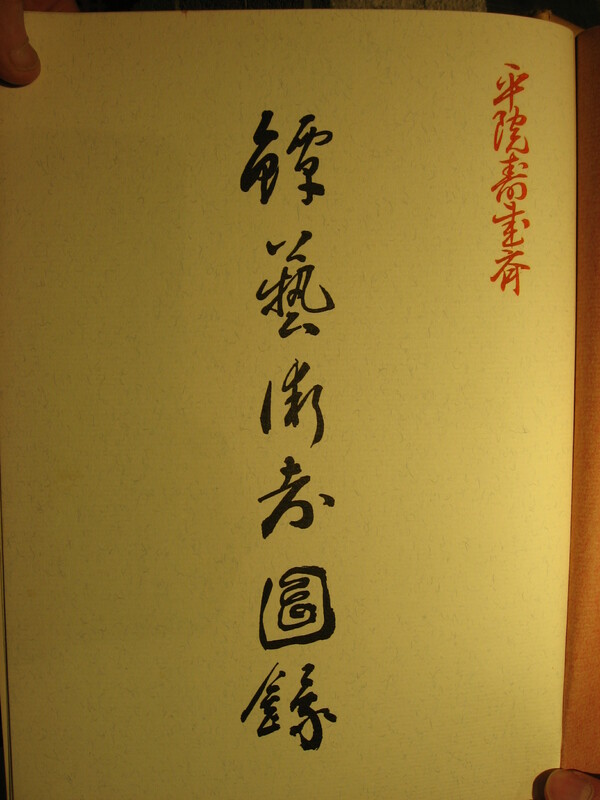 Inscription in kanji in front cover - Signed Sasano book, it is his name and signature. 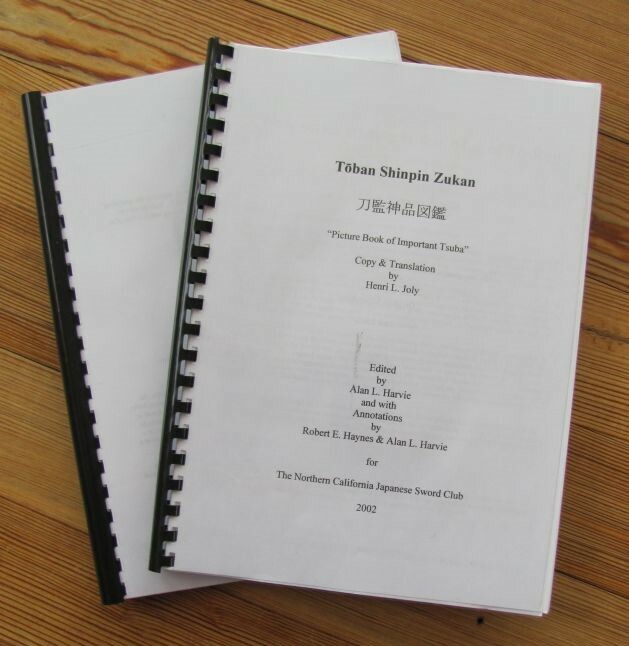 Separate 10 page translation of the introductory material and captions for each of the 22 tsuba. 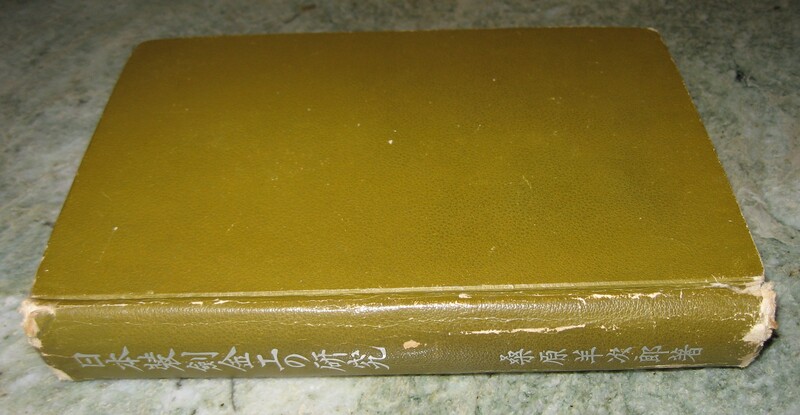 First edition with 48 pages, about 7" square, green hardcover. The quality of the photos are outstanding. The book is printed on heavy glossy stock. Most major schools and artists are represented. Ko-Tosho, Ko-Katchushi, Kyo Sukashi, Ko Shoami, Kanayama, Owari, Yagyu, Akasaka, Higo, Kagami-shi, Nobuiye, Kaneiye, Umetada, Hirata, Jingo, Ko-kinko, Goto, Ko-Mino, Kaga-Goto, Yokoya, Nara, Tsuchiya, Omori, etc... Tsuba as well as kozuka, kogai, fuchi kashira and menuki are illustrated. The photos of iron tsuba are particularly exceptional because the aesthetic characteristics such as tekkotsu and surface texture can be clearly seen. The examples shown are all of the highest quality and strongly representative of each school. A valuable tool for Western students is the presence of English text directly below the Japanese text. Out of Print and very hard to find. First edition with 82 pages, 8 1/2" x 12" hardcover. 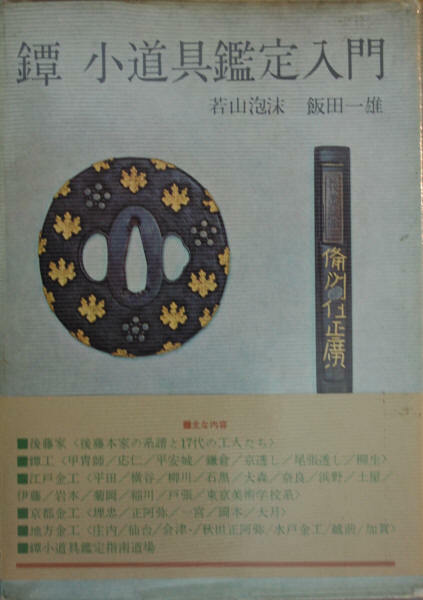 One tsuba per page with facing Japanese caption. 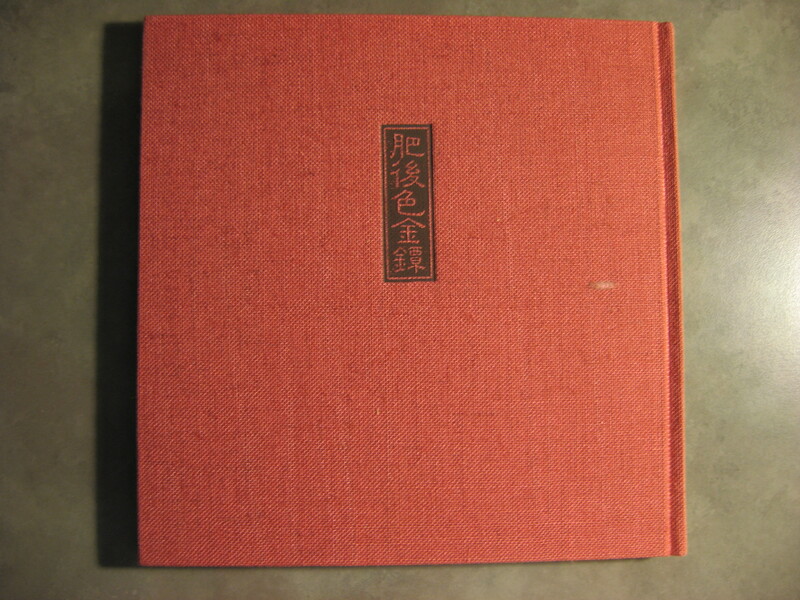 First edition with 48 pages, about 7" square, red cloth hardcover. 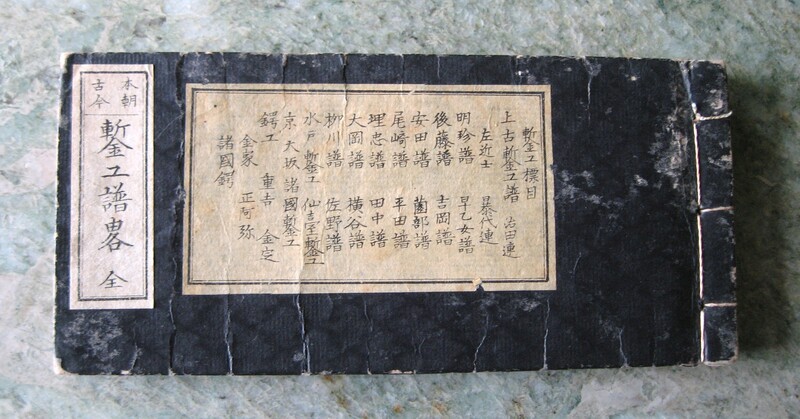 One tsuba per page shown with facing Koshirae and Japanese caption. First edition with 44 pages, about 7" square, blue cloth hardcover. 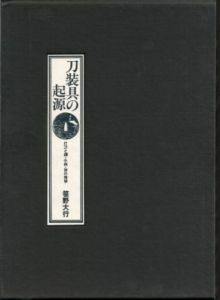 In Japanese Language only, this edition published prior to the release of its English version below. 297 outstanding examples of sukashi tsuba are presented here in the final volume to come from Masayuki Sasano. This volume is set up in gallery format - one tsuba per page plus commentary. A historical preface is supported by a unique demonstration in chart form which uses classic examples to assist the reader in placing tsuba to a given period. A very fine 'gift' volume with 341 pages, 8 1/2" x 12" hardcover w/ slipcase. Sasano's last book, like his important 1972 reference (above), this volume is set up in gallery format - one tsuba per page plus commentary. A historical preface is supported by a unique demonstration in chart form which uses classic examples to assist the reader in placing tsuba to a given period. 297 Outstanding examples of sukashi tsuba are presented here in the final volume to come from noted expert Masayuki Sasano. 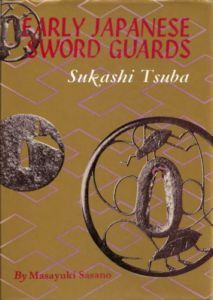 An essential text for students of iron sukashi tsuba. 334 pages, 8 1/2" x 12" hardcover. TOSOGU YUHIN ZUFU by Shoyukai & Sasano Masayuki. Between 1985 and 1995 Sasano's study group, Shoyukai, produced eighteen issues, each presenting masterpieces of their subject. Issue 1 through 15 are loose sheets in a soft cover, the last 3 issues are softbound, all in Japanese. With great effort near complete sets of these limited issue publications have been assembled. Very rare. Contains over 280 pages of photographed examples including: tsuba, kozuka, kogai, fuchi/kashira, menuki, and umabari. Notes regarding the artists and their relationships to the main teachers of each school are included as are many brief explanations of legends and the historical episodes depicted in the example pieces. A life's work and the final volume by noted tosogu scholar Dr. Torigoye. Text in both English and Japanese. Includes two pull-out charts. Numbered limited edition. 308 pages, hardcover with slipcase, 8 1/4" X 12" inches. TSUBA GEIJUTSU-KO by Kazutaro Torigoye, VERY GOOD NFS. 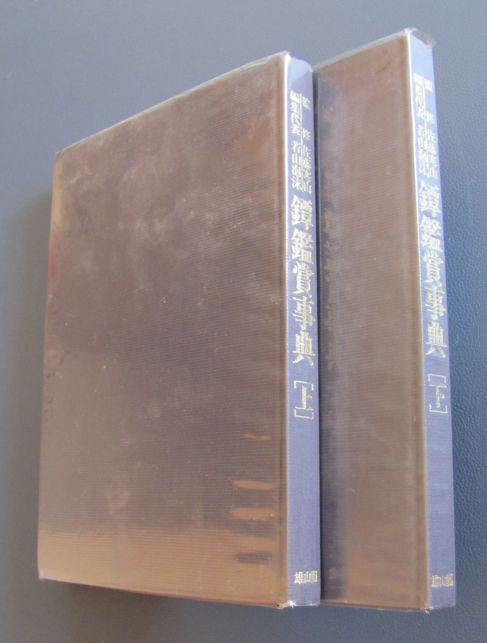 The rare two book set which is translated into the very popular 'Tsuba, an Aesthetic Study' by Robert Haynes. 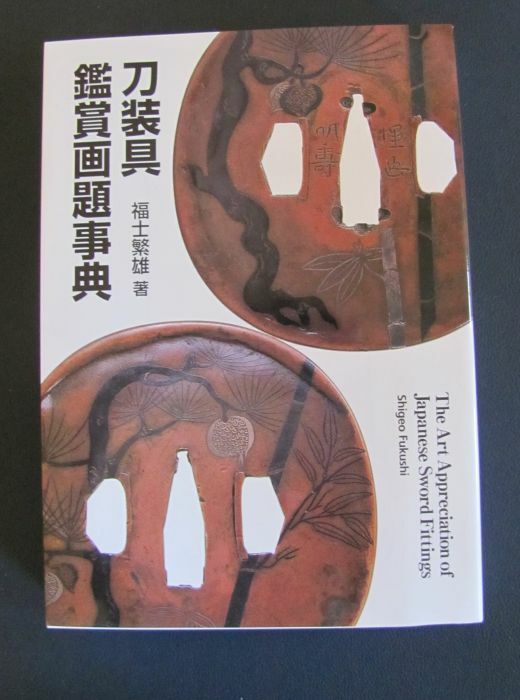 This is a great addition to students of this book if for nothing other than seeing the tsuba images in finer detail. Book one is mostly pictures all in black and white. Book two is nearly all text with a few illustrations. These are rare and interesting books that will make a great addition to any library. 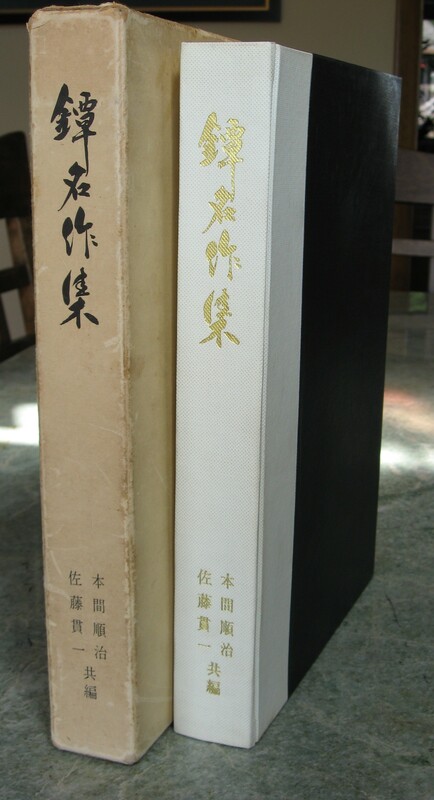 Both hardbound with slipcase, text in Japanese. 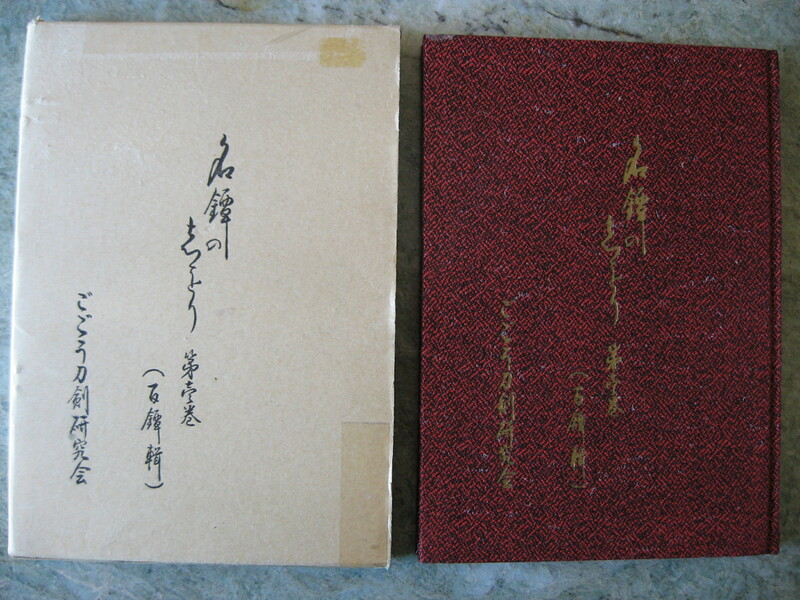 NOTE: The 2nd right image below shows the presentation and signature with Kao of Dr. Torigoye of this 2 volume set given to Robert E. Haynes in 1969. In May, 2015 Robert E. Haynes presented this same 2 volume set to Elliott D. Long. 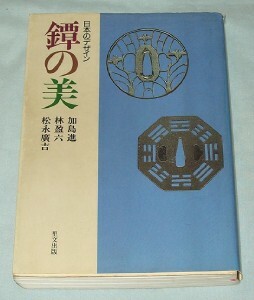 This is the original edition of Dr. Torigoye's 1975 publication of the same title (shown below). This book covers all schools and periods with excellent examples, some which are not included in the 1975 edition. It is the authors intent to demonstrate the "intrinsic value(s) of (the) Japanese sword guard". 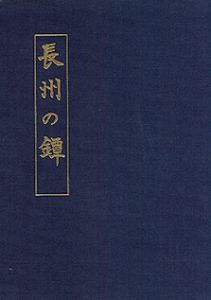 First proposing the fundamental importance of the iron plate, this text focuses on the masterworks of tsubako while a limited number of kinko examples are included. 362 pages 21.4cm x 31cm Hardcover with slipcase. Japanese language. 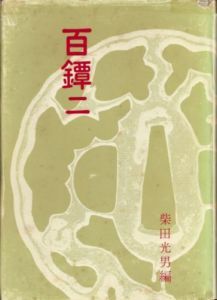 This is the revised, expanded edition of Dr. Torigoye's 1965 publication of the same title (shown above). 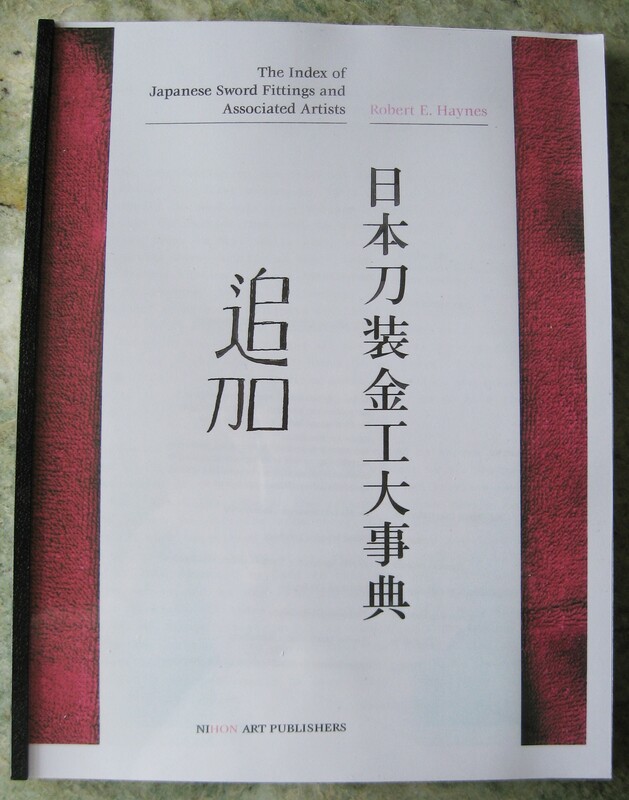 With its forward and captions in both Japanese and English, it is the authors intent to demonstrate the "intrinsic value(s) of (the) Japanese sword guard". 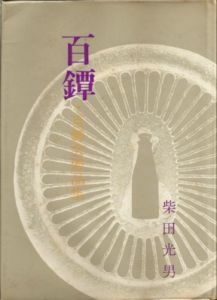 First proposing the fundamental importance of the iron plate, this text focuses on the masterworks of tsubako while a limited number of kinko examples are included. Tsuba are arranged by school and shown using detailed photography and printed on gloss-stock for optimal results. Limited edition of 1000 copies. 398 pages 8 1/2" x 12" Hardcover with slipcase. Japanese and English language. All are Out Of Print and very rare. 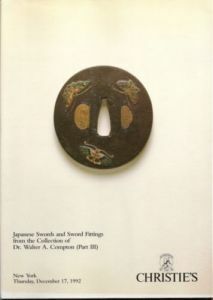 The most comprehensive book on Kinko artists for samurai sword fittings (tosogu: tsuba, menuki, kozuka, kogai, fuchi, kashira, etc.). Probably the most used Japanese list of fittings maker's names and data. 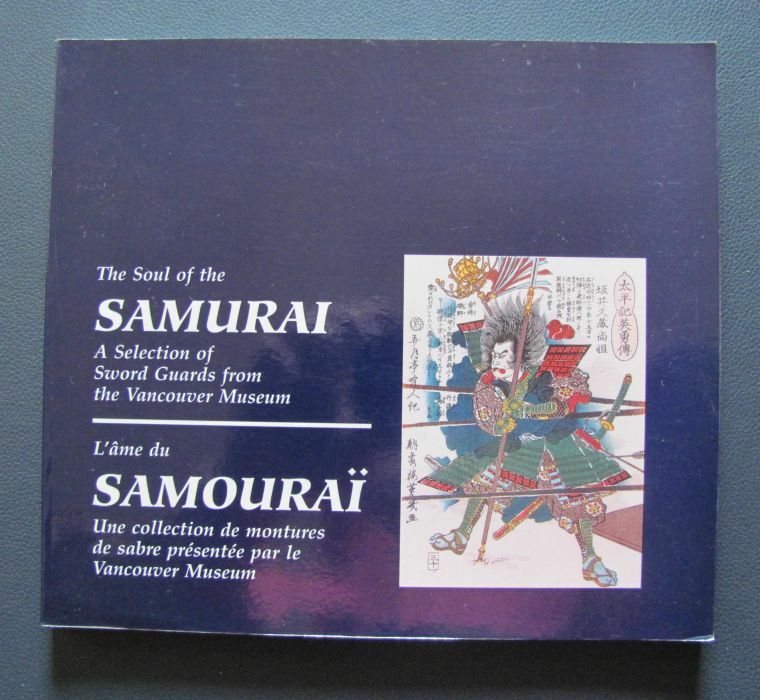 A major reference for the samurai and fitting collector. 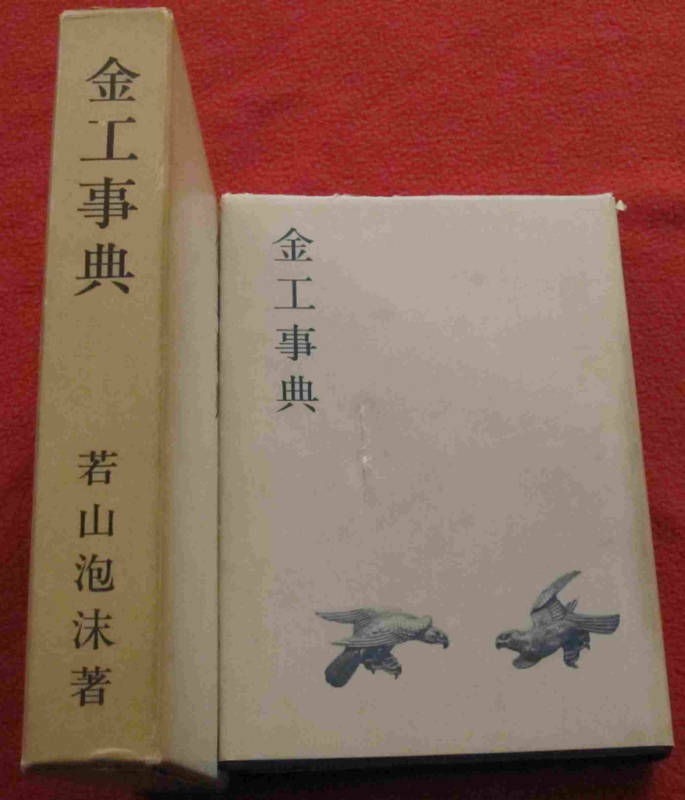 1st edition, Japanese Language, B/W illustrations, some wear to slipcase. 661 pages, 6" X 8 1/2", softcover w/ jacket/brodart dustcover and slipcase. This dictionary is a must have book for tsuba and kodogu collectors. Also frequently cited in the Haynes Index (see above). Contains more than 10,000 sword fitting artists with their style, characteristics, etc. Compared to Kinko Jiten published in 1960, this book added more than 2000 artists and much more information. More than 800 pages, hardcover, 17cm X 22.5cm. This eight volume encyclopedia style of books was written by Wakayama to illustrate both tsuba and kodogu of every period, by every group. Items are represented in quality black/white photos, with close-ups of some key signatures as well as diagrams. 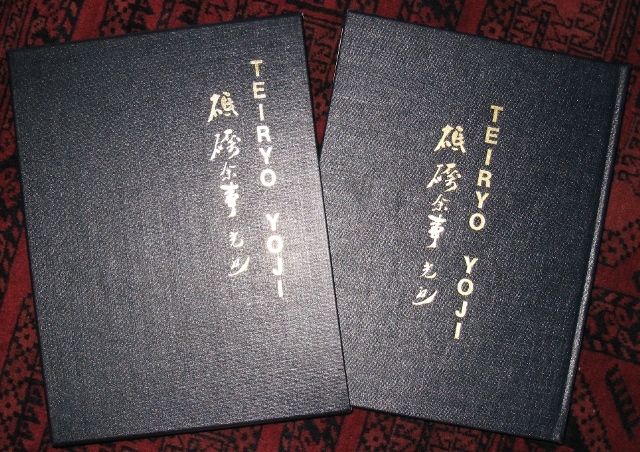 Included in the set is a book that focuses on terminology, techniques and tools of the tsubako. 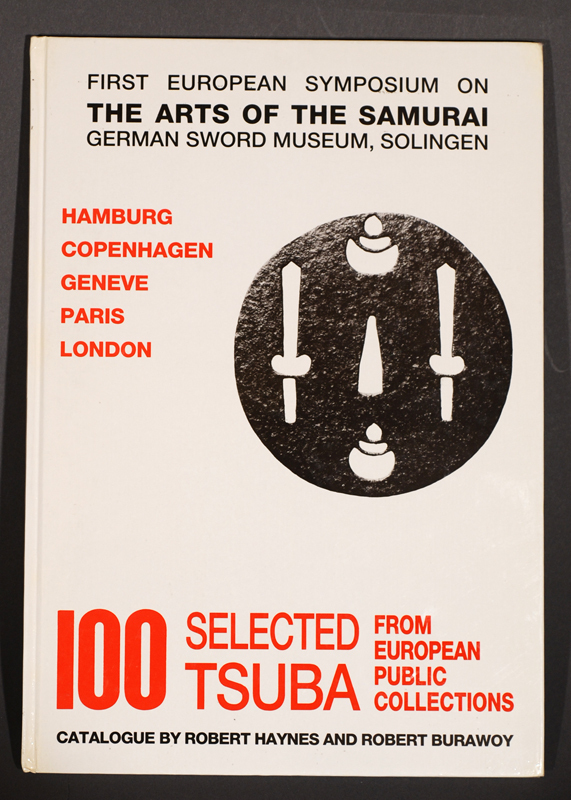 Many tsuba not represented in any other publications are shown. This is Wakayama's best known work on tosogu. 12 1/2" X 8 1/2" hardcovers with slipcases. 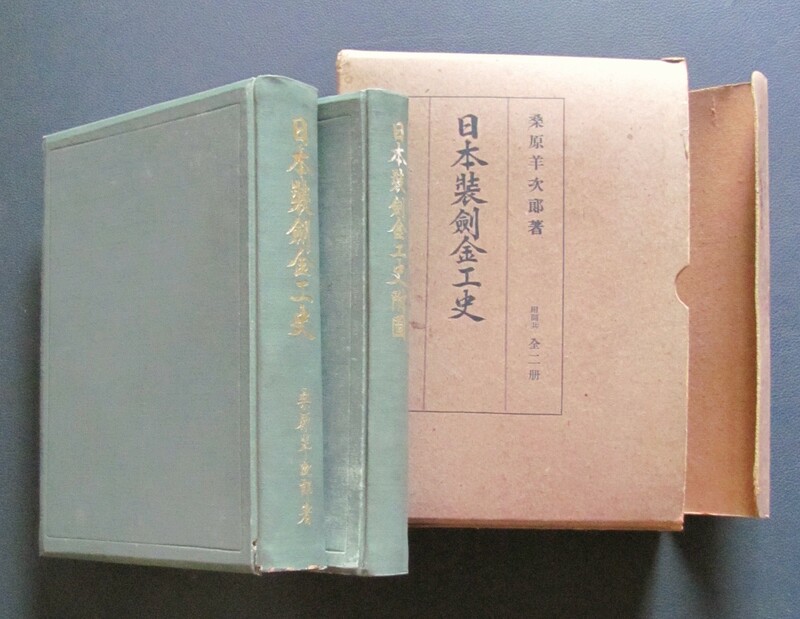 Complete 3 volumes of Toso Kodogu Meiji Taikei, the must-have books for Kodogu collectors. Vol. 1 (352pgs) is for Edo Kinko, Vol. 2 (372pgs) is for Kyoto Kinko/Goto Family/Ichiyo, Naokatsu Line, and Vol. 3 (344pgs) is for Shyokoku Kinko. Detailed oversized photography of fittings inscriptions. 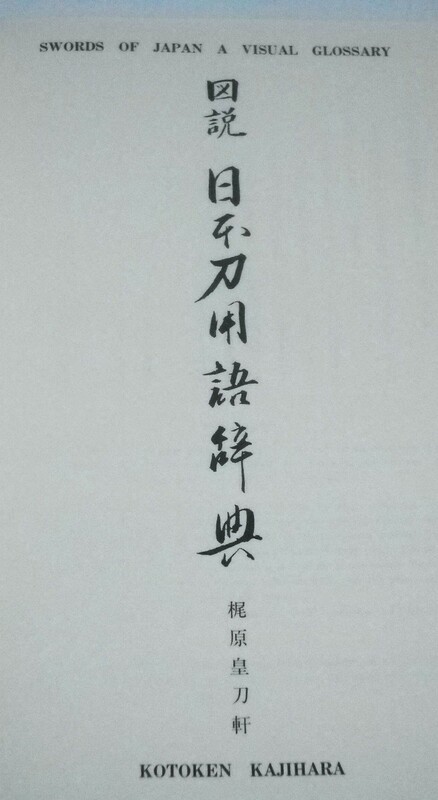 This is the most extensive collection of tosogu artist signatures, and the primary reference cited by The Index of Japanese Sword Fitting and Associated Artists (Haynes, 2001). In 'like new' condition, three volume set, 1087 pages total. 19.5cm X 27.5cm. Luxurious hardcovers with slipcases. Japanese language. The first 296 pages of this book are plates, mostly black & white but with a few in color, of truely fine kodogu. Many close-up photos, and photos of signatures included. The remainder of the book is given to text. 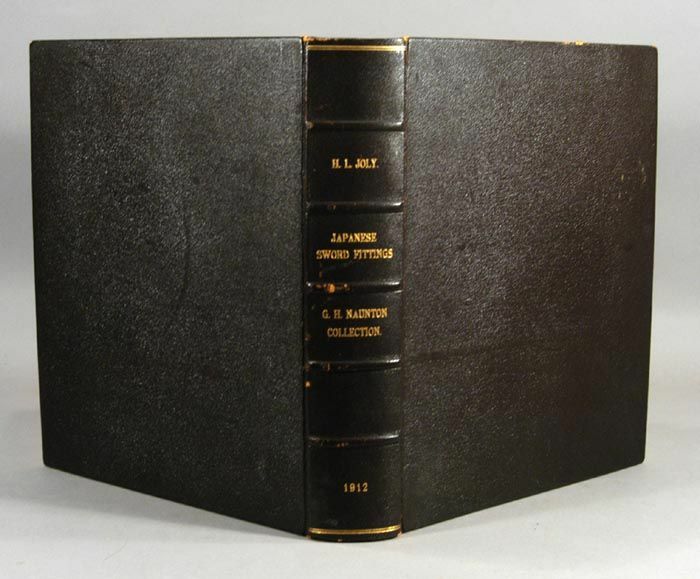 Clothbound with slipcase, 7 1/4" x 10 1/4", in 'like new' condition, 497 pages total. Japanese language. 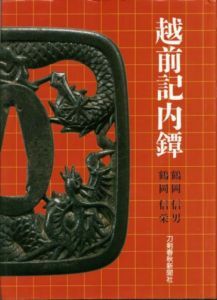 Hundred's of iron tsuba in another great book. All tsuba shown in crisp black & white photos. 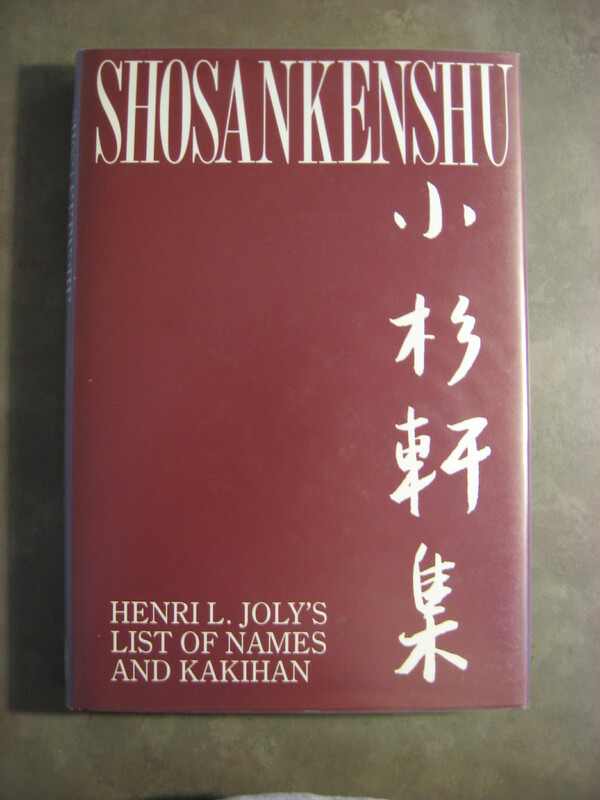 Wakayama included a list of known authors and their books in the back of volume two. 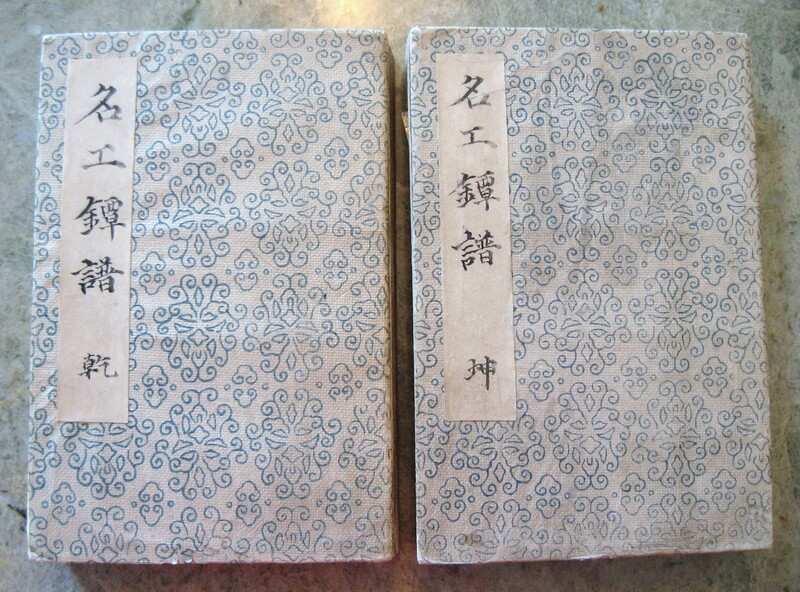 Two volumes, clothbound with plastic jackets. 7 1/2" x 10 1/2", 627 pages in Japanese. In almost FINE condition. This out of print book is worth having because it breaks down tsuba into groups and smiths and gives several examples of each. It has a nice variety of pieces that are not overly published in other Tosogu books. This book is a must for any library. Contents: 1)The Goto School; 2)Tsuba Artisans; 3)Edo Kinko; 4)Kyoto Kinko; 5)Regional Kinko. In Japanese, the black and white photos and range of tsuba are very informative. 22cm X 15cm, 271 pages on high quality paper, original dust jacket and plastic cover. Excellent condition. Japanese language. This is copy no. 86 of a limited edition of 175 copies only. Two parts bound in one. NOT ex-library. Finished printing on February 22, 1915. Printed by Riddle, Smith & Duffus, collotypes by the Photophane Company, and color plates by the Mempes Engraving Company. An immensely clean copy. Part I deals with painting, prints, netsuke and lacquer ware. A substantive treatment of Japanese sword and weapon craft is found in Part II. T.E.G. Marbled paper pastedowns and FEP's and with strong hinges. Text block firmly bound in. With 213 numbered pages of text plus CLXX full-page plates, a few of which are in color, the remainder in collotype, and all on heavy coated stock. Most of the plates with pristine tissue guards. A hint of age toning to all pages, quite minor. A Near Fine copy. It seems unlikely that a finer copy exists. Scarce in any condition. 10 1/4" x 12 1/2" Bound in contemporary oxblood-colored half morocco, with crisp gilt stamped lettering and rules to the spine, and with olive drab buckram boards. 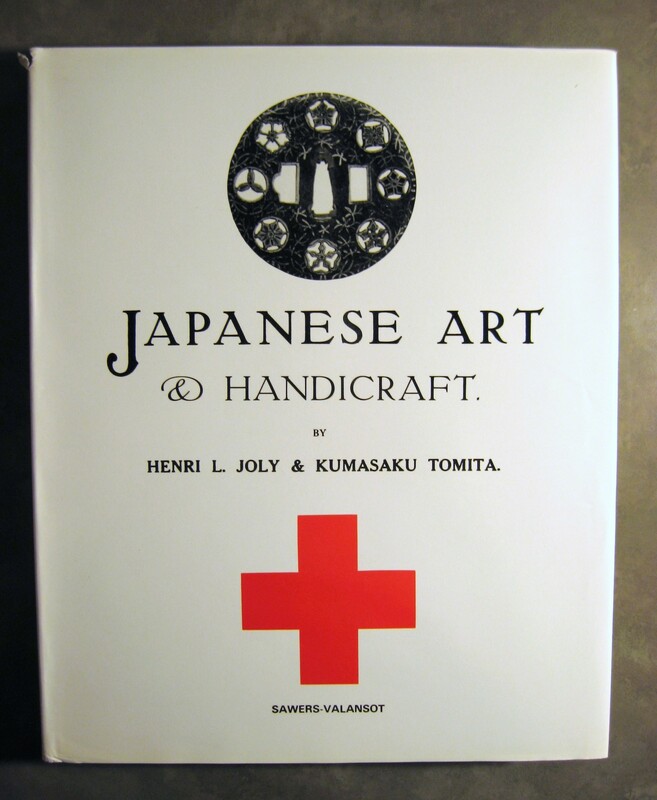 Affectionately known by everyone connected with Japanese art as the "RED CROSS" Catalogue, this was an astonishing book to appear originally in 1915. The exhibition that gave rise to it was both imaginative and purposeful, and deserved a catalogue that was more than a simple list of exhibits. It follows that the illustrations and entries to the various sections of the catalogue vary in interest and importance today. The prints include some specimens that are acknowledged masterpieces; several of the netsuke and inro have changed hands in the auction rooms at prices their original owners' would have derided as unbelievable: but above all, the "RED CROSS" is outstanding for its presentation of a selection of magnificent sword-furniture, especially tsuba and fushi-kashira, which makes the volume indispensable to any serious collector in that field. Joly, in his preface to Part II of the catalogue, which is wholly devoted to Metalwork, brought, almost for the first time in our literature, some kind of scientific order to the classification of tsuba and other sword-furniture, and perfected a model and a vocabulary for cataloguing that has been widely adopted by most of his successors. 215 pages, 10 1/4" x 12 1/2" hardcover w/dustjacket and slipcase. THE W. L. BEHRENS COLLECTION: Part III. Sword-Fittings Tsuba Metal by Henri L. Joly 1913. GLENDINING & CO., London, 1913. Soft cover. Book Condition: Very Good. 1st Edition. W. L. BEHRENS COLLECTION Part III SWORD FITTINGS, TSUBA, METAL. Catalogue by Henri L. Joly. This is the ORIGINAL CATALOGUE, printed in 3 VOLUMES. Published by GLENDINING & CO., LONDON, MCMXIII-MCMXIV (1913-1914). 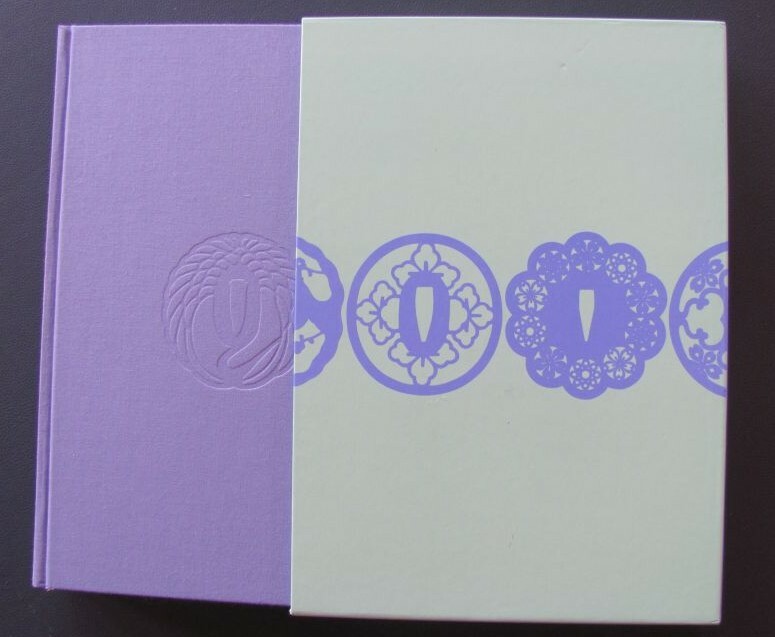 FIRST EDITION, LIMITED TO ONLY 100 COPIES, THIS BEING COPY #58. From the Copyright / Limitation page (found in Volume One of this Three Volume Set of Part III of the W.L. Behrens Collection): "Printed to ONE HUNDRED COPIES ONLY of which this is NUMBER 58 by Riddle, Smith and Duffus, Victoria Works, Forest Hill, S.E. / COLLOTYPE PLATES by the Photophane Co., Cranfield Works, Brockley, London, S.E. / PUBLISHED BY Glendining & Co., Ltd., 7 Argyll Street, London, W." Three Volumes, Original Printed Paper Wrappers / Softcovers, 10x12 inches. The three volumes contain 125 pages of Text (pages numbered consecutively) plus a few prelim pages in Volume I (Title-Page, Limitation Page, Preface) plus a Printer's Colophon page at the end of Volume III; each volume also has a front and rear blank endpaper. The three volumes also contain a total of 83 COLLOTYPE PLATES, each printed on its own page and each with its own PRINTED TISSUE GUARD. 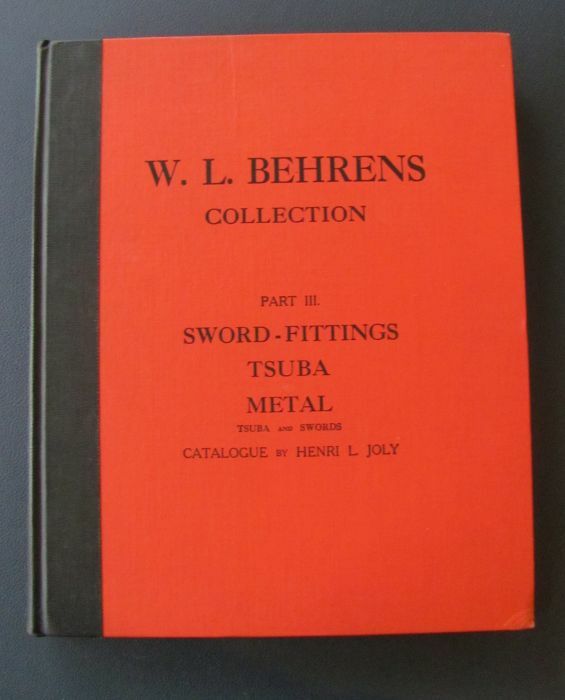 This original W. L. BEHRENS COLLECTION PART III : METAL, TSUBA, SWORD-FITTINGS, which I am offering, is the most difficult to find and the most sought after of the four part W.L. 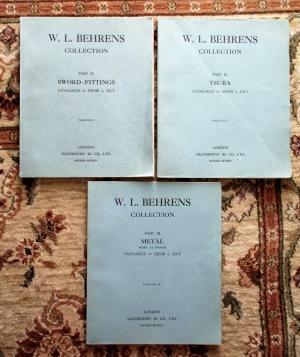 Behrens collection catalogues. THE W. L. BEHRENS COLLECTION: Part III. Sword-Fittings Tsuba Metal by Henri L. Joly 1966. A facsimile reprint of the original edition published in 1912-1913 at London in a limited edition of one hundred sets. Contents comprise 252 metal ornaments, 124 sets menuki, 489 kozuka, 97 fuchi/kashira, 1864 tsuba, 110 swords, 40 items of bokuto and various military objects. With an index to signatures. Paragon Book Reprint Corp., New York, 1966. 12 1/4" x 10". 125 pages of text plus 83 plates. 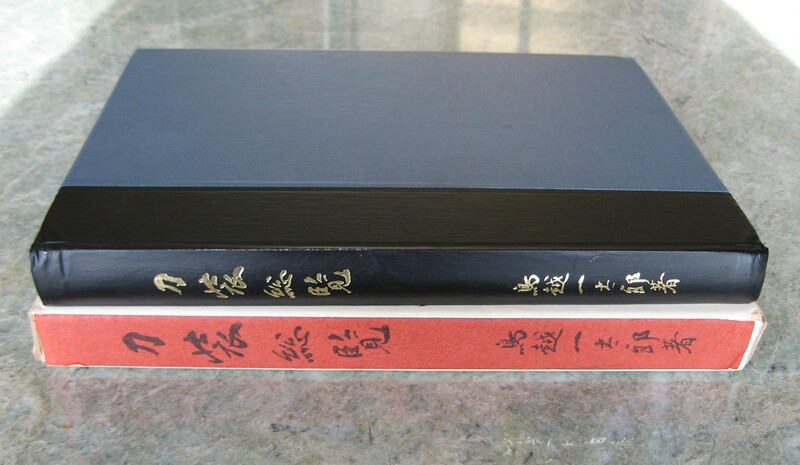 Red cloth with black title and black cloth spine with gold title. 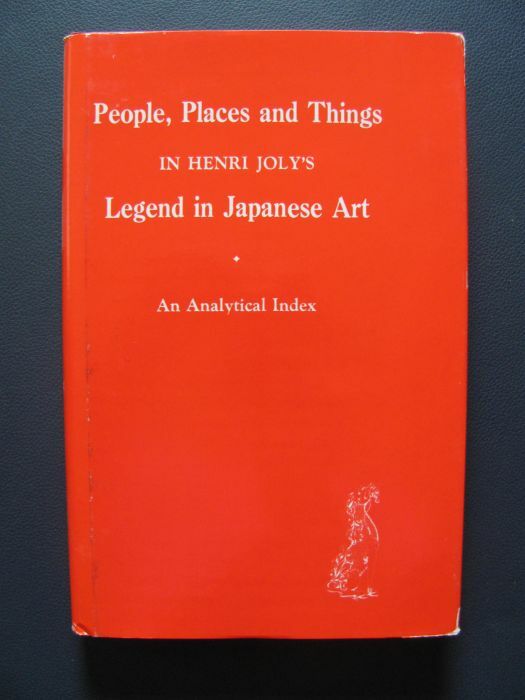 THE H. SEYMOUR TROWER COLLECTION of JAPANESE ART edited by Henri L. Joly 1975. Pages with illustrations are printed one side and numbered one side only. It is # 4 of a limited edition of 100. This is a facsimile of the 1913 original. A large collection with a great range of items: netsuke, okimono, lacquer, and of course, sword fittings. The original was an auction catalogue, and this book contains an addendum: prices realized at the sale. All items are described; many are illustrated in black & white. J. C. HAWKSHAW COLLECTION by Henri L. Joly 1910. Limited to 300 numbered copies of which this is no.54. 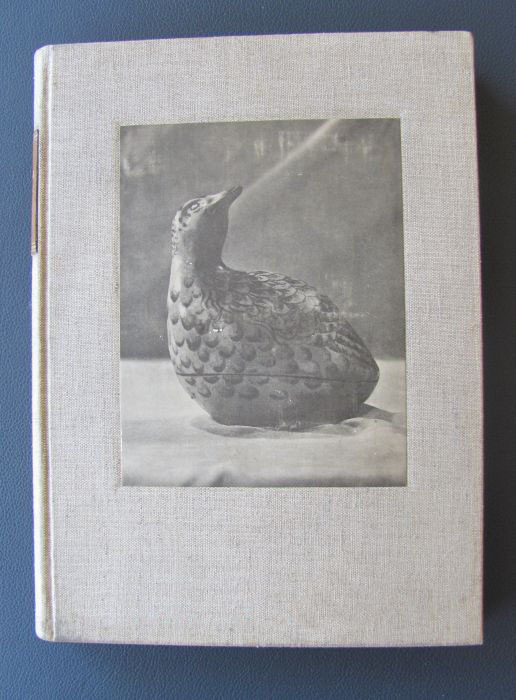 Illustrated with 50 collotype plates from Joly's photographs. Each plate shows multiple sword-mounts that are numbered on a tissue overlay; the numbers can be used to identify the pictured sword-mounts with descriptions in the catalogue. Many of the mounts have the name of the maker written below them in pencil. Some tissue overlays are creased or split, and a few are chipped. Quarto. xxvi, 300 pp., +  ff. 'Errata on Plates' laid-in at the front and  pp. Addenda laid-in at the end. 32 x 26 cm (12 1/2 by 10 inches). 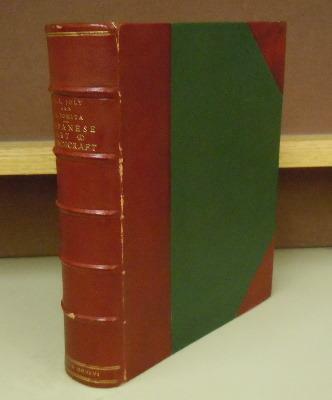 Light brown cloth binding with the title printed in red on upper board and a red- and-black printed paper label on spine. This a handsomely produced and complete volume that is being offered as is because the binding has failed: Several of the plates and text leaves are sprung from the bookblock. 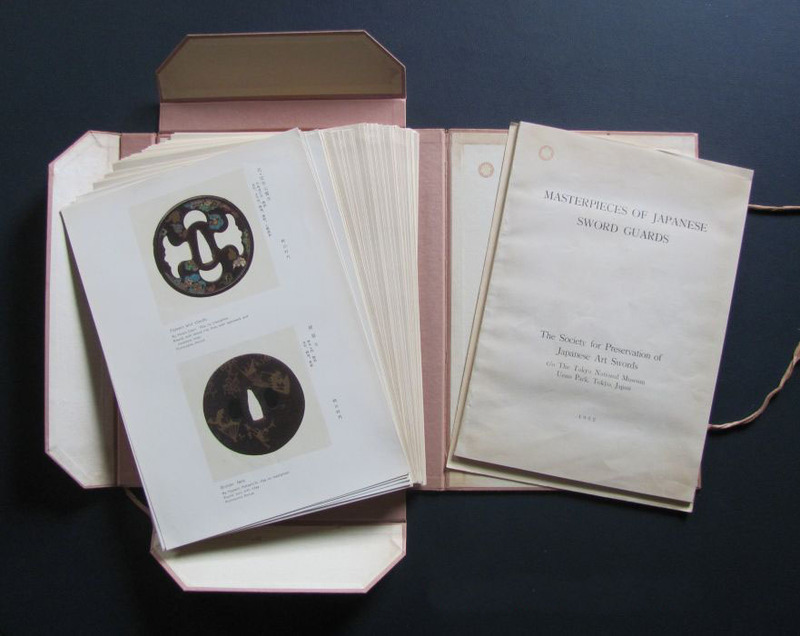 JAPANESE SWORD FITTINGS: A DESCRIPTIVE CATALOGUE OF THE COLLECTION OF G.H. NAUGHTON, ESQ. by Henri L. Joly 1912. London (Privately printed for G. H. Naughton at) The Tokio Printing Co., Reading, 1912. 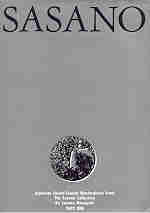 First edition, limited to 300 numbered copies, of which this is no. 208. Illustrated with 88 collotype plates from Joly's photographs. Each plate shows multiple sword-mounts that are numbered on a tissue overlay; the numbers can be used to identify the pictured objects with descriptions in the catalogue. Many of the makers' names of the pictured objects are written in pencil on the tissue overlay. Quarto. xxix, , 317 pp. 32 x 26 cm (12 1/2 by 10 inches). Dark brown full leather binding with gilt-stamped title on spine. Light superficial rubbing on spine bands and edges and corners of boards. Occasional brief pencil notes in text and lengthy pencil notes on the reverse of the frontispiece, the verso of the title-page, the half- title page, and three blank pages at the end. A handsomely produced volume, complete and in very good condition. 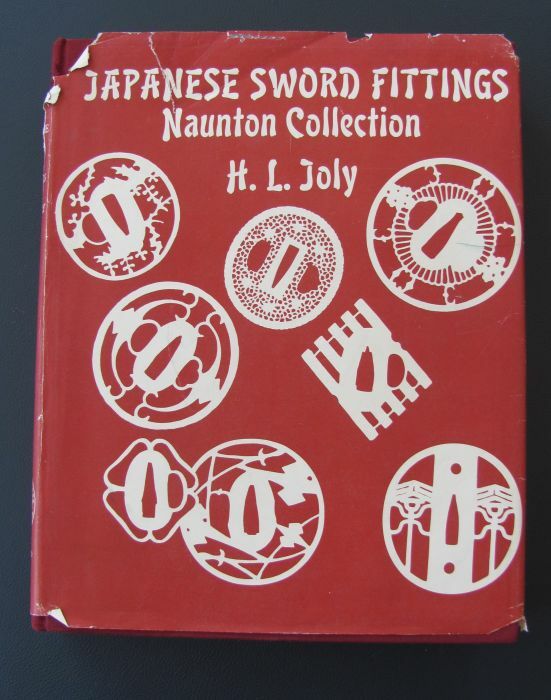 JAPANESE SWORD FITTINGS NAUNTON COLLECTION by Henri L. Joly 1983. This book contains the famous G.H. Naunton collection of sword fittings and is also listed as a reference in the Haynes Index. The immense collection of 1450 pieces are presented by H.L. Joly. 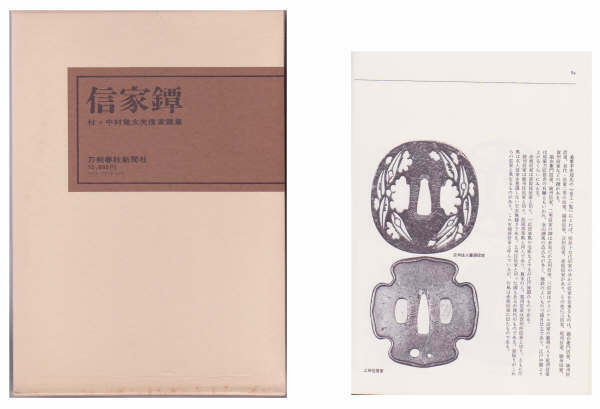 Tsuba and all forms of kodogu are shown in b&w plates with detailed documentation. Historical notes of schools and methods are also given. 317 pages, hardcover, 10 1/4" X 12 1/2" X 2 1/2" inch. The reprint of Joly's 1919 handwritten/drawn reference to fittings makers' names and personal seals. Over 2950 listings are recorded. Listings are alphabetized by romanized spelling, each includes: kanji, and in most cases kakihan and notations regarding location or school. The previous text to which Joly credits as the basis for supplementation was by Shinkichi Hara and contained only 600 entries minus kakihan. This is a definitive and invaluable reference tool by a noted authority. 444 pages, 9 1/4" x 11 1/2" hardcover with dust jacket. First Edition of this classic work. With principle text in English and secondary text in Japanese. With XLIII and 453 numbered pages. With 16 full-page color reproductions and upwards of 700 illustrations. 9 1/4" X 11 1/2" hardcover. Contemporary decorative cloth binding in a faded terra cotta color with crisp gilt-stamped designs and lettering to the front board and to the spine. 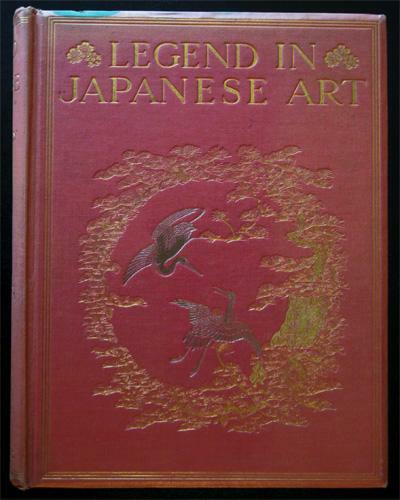 Originally published in 1908, this well researched volume describes "the historical episodes, legendary characters, folk lore, myths, and religious symbolism illustrated in the arts of old Japan." Both an encyclopedia and a detailed iconography, this book belongs on the shelf of every serious collector and student of thins Japanese. This is the classic reference used to identify pictorial elements and themes in Japanese art. 623 pages, 8 3/4" X 11 1/2" hardcover w/ dustjacket and slipcase. An Analytical Index by John and Dorothy Tompkins. 1978. English. Limited first edition. 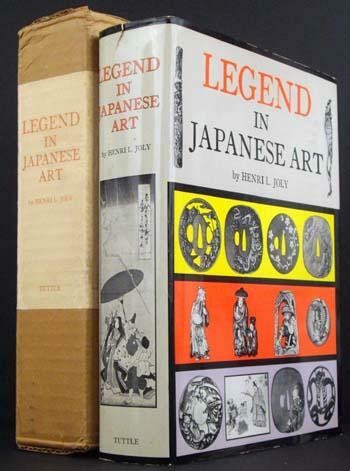 Joly's Legend in Japanese Art is a huge book with everything there is to know about Japanese folklore, all of the tales that so many pieces of kodogu are based on. But until this index came along, there was no easy way to find what folklore or tale you were seeking. With Joly's book and this volume you'll be able to understand the stories. 217 pages, 6" X 9 1/4" hardcover w/ dustjacket. 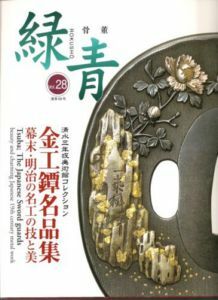 Japanese-language text on tsuba with photographs of 200 sukashi examples produced during the Muromachi through Edo periods; each accompanied with description and commentary in Japanese. Included separately is an English-language index of artists making this text accessible to non-Japanese readers. First edition with 257 pages, 6" x 8 1/2" hardcover with dust jacket. What Fujishiro's Nihon Toko Jiten is for swords, the Kinko Meikan is for fittings. With 630 pages of photographic plates arranged four to a page and magnified 1.5 times for detail, each artists is noted by province, period active, and rating; many with additional commentary. Clearly an important tool of study, and with its English translation an accessible tool of obvious value to serious collectors. 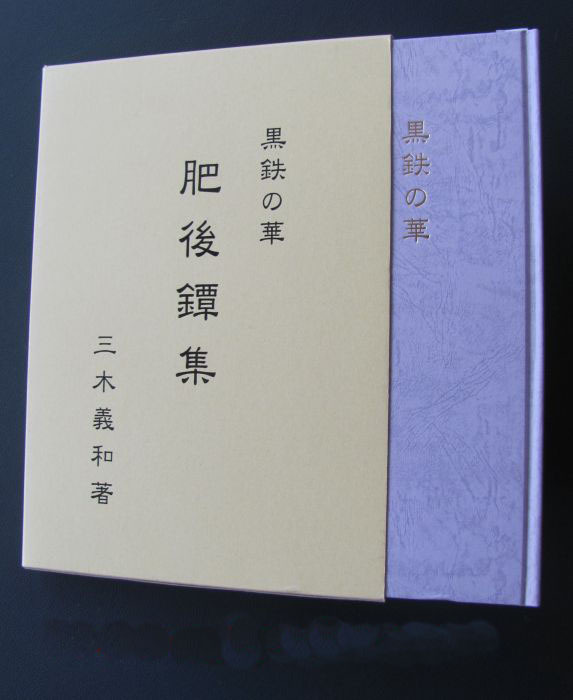 Clothbound with slipcase, 5 1/4" x 7 1/2", 676 pages in Japanese. With full English translation by John Yumoto and Alan Harvie 1982. Spiral bound with clear plastic cover, 8 1/2" x 11", 197 pages. This book is printed as one of a 1200 limited edition in 1974. Known as the masterpiece of Kokubo Sensei. Total 576 tsuba are illustrated well. 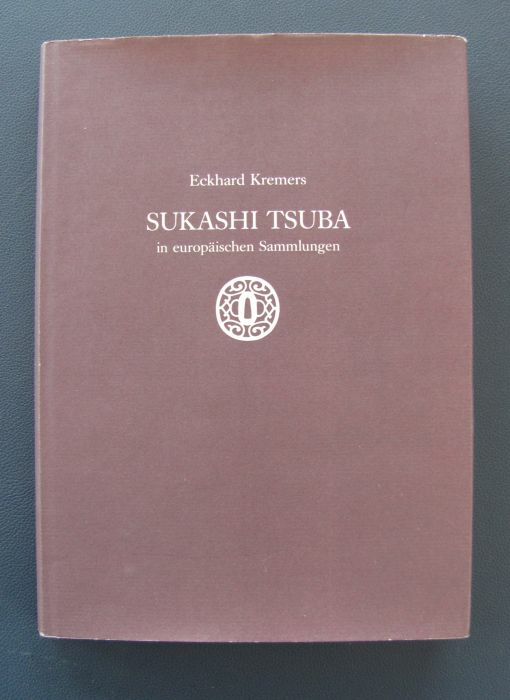 This is the only book focused on Edo tsubas (mainly Goto and Edo Kinko tsubas). 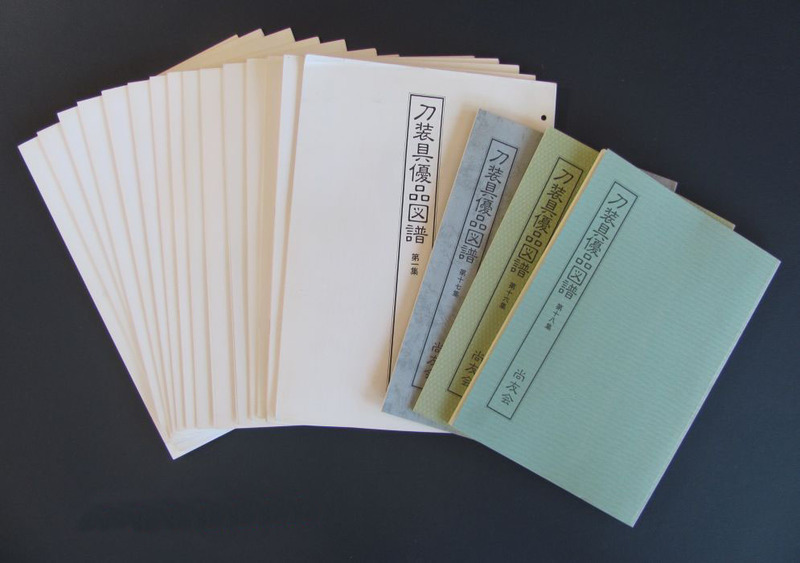 It can be used as a good meikan and very good to distinguish genuine tsubas from gimei. Book is in 'very good' condition with original case. Total 555 pages and thickness is more than 2". Size is 8.5" x 12". 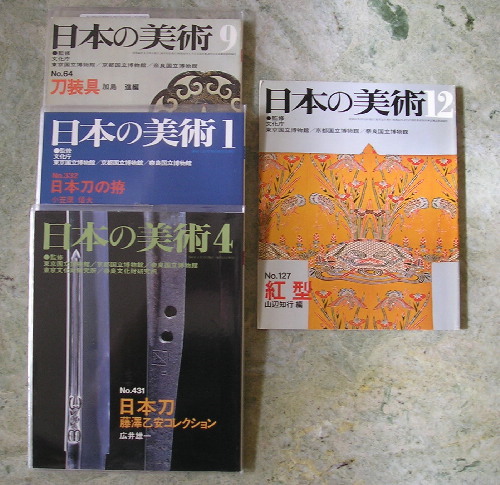 Each magazine has informative articles about swords and tsuba. Very educational for new and old collectors of kodogu and tosogu. A must have for any library. 1st edition - 64 pages, Summer edition - 128 pages, Fall edition - 192 pages. Approx. size for each 8 1/4" x 11" inches. 152 pages in Japanese. 140 tsuba and tsuba in mounts are shown in black & white photos (tsubas are life size). In the back of the book are extreme close-ups of signatures. Softbound, 7 1/2" x 10" inches, 152 pages, in 'like new' condition. Beautiful book in very fine condition with color and black & white photos and extensive descriptions of hundreds of fine fittings. The pieces are arranged by subject matter, and at the back of the book you'll find an index in English to make this easy to navigate. Softbound with dust jacket. 418 pages in Japanese with a detailed description of each piece in English. 7 1/2" X 10 1/4", in VERY FINE condition. 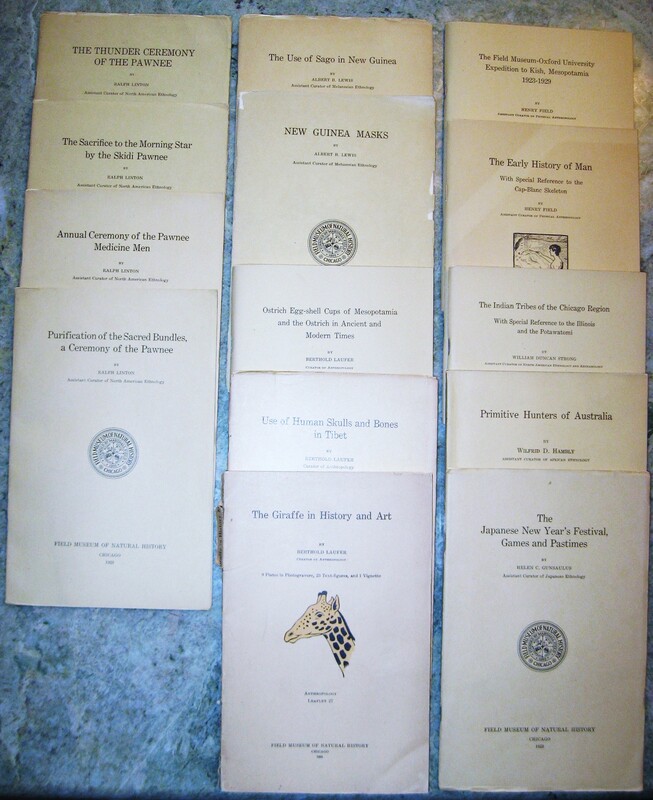 Complete set of nine issues, edited and largely by Robert Benson. Dating from 1979 to 1981. This was a great publication with articles on swords, fittings, armor, matchlocks and more. Well researched, beautifully illustrated and well worth owning. Though in Japanese, there is a list of plates in English. Softbound, 8 3/4" x 11 3/4", 139 pages in Japanese. by Akimoto. (1999) Fine SOLD. Hundreds of crisp black & white photos, with many signature close-ups, of tsuba by artists of the Bushu school. Hardbound, 8 1/2" x 12", 103 pages in Japanese. 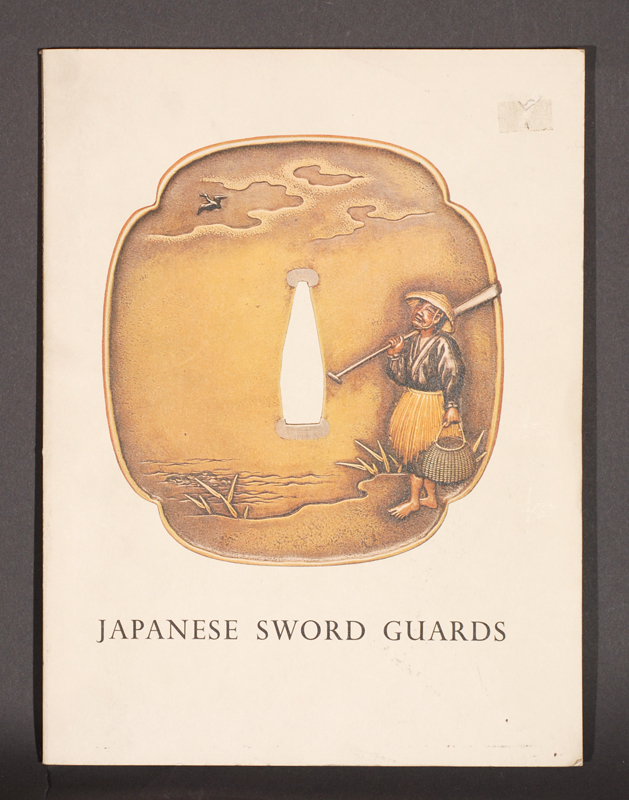 The exhibit catalog of an important, early exhibition of Japanese sword guards in England. History and chronology are addressed in both outline form and throughout the catalog. Following the exhibition listing is a unique bibliography of early articles and texts, then shown are thirty-two prime examples in b&w plates; index, and glossary. 200 pages, 4¾ x 7¼" soft cover. 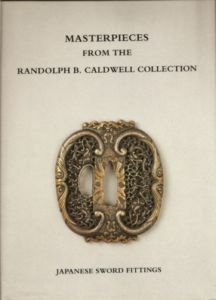 Presented as the culmination of 30+ years of study and collecting Japanese sword fittings, the name Caldwell is well known and his collection bares testament to his accomplishment. 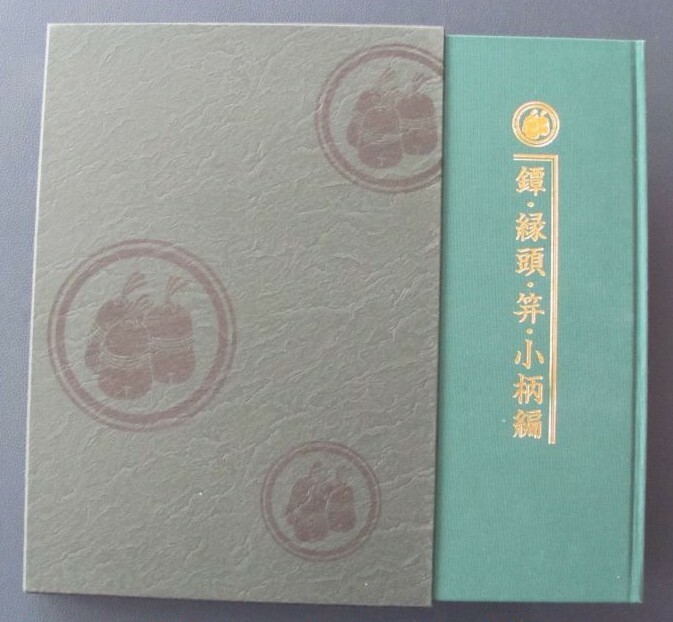 With 142 examples, each presented in full-color plates, it includes masterworks of sukashi and soft-metal tsuba, exceptional fuchi-kashira, and 19 pages of Goto works. Where applicable, detail photographs of inscriptions are also shown. Each example is fully documented; also included are a glossary and lengthy bibliography. 200 pp. 8" X 12" hardcover. 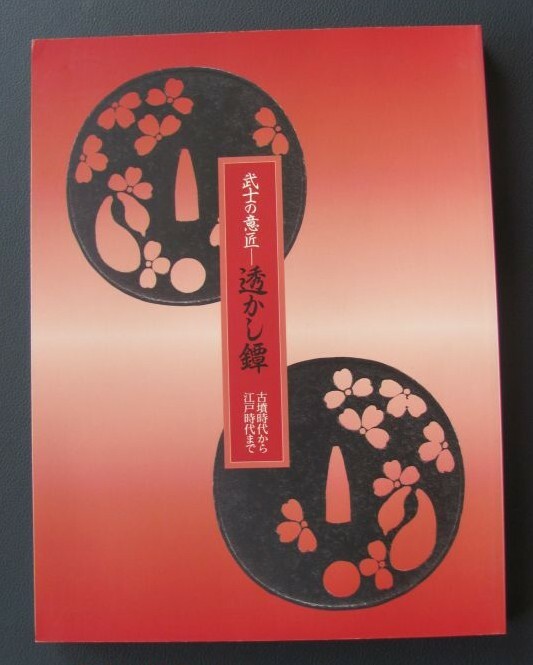 Only one tsuba book specialized in Choshu tsuba. 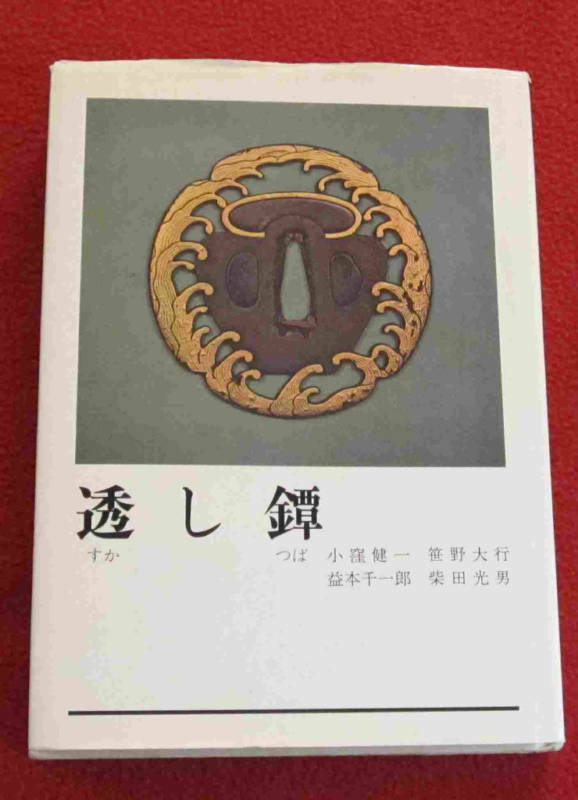 The author, Dr.Murakami was an expert in Choshu tsuba. 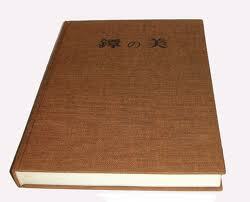 This book contains 55 Choshu tsuba, Choshu Tanko (tsuba maker) list, and family lines. Limited print from Toensha and was not sold in bookstores. Clothbound with plastic jacket and slipcase, 7 1/4" x 10 1/2", 96 pages in Japanese. JAPANESE SWORDS and SWORD FITTINGS from the COLLECTION of Dr. Walter A. Compton, Parts I, II, & III, by Christie’s. Softbound with dust jackets and prices realized, 8 ¼ x 11 ¾”, 440, 245, & 130 pages in English, 971 lots. Dr. Compton had the most impressive collection of Nihonto in private hands outside of Japan, and there can’t be more than a few in Japan to rival it. In 1992 Christie’s Auction House in New York sold the collection in 3 sales; these are the sale catalogs. 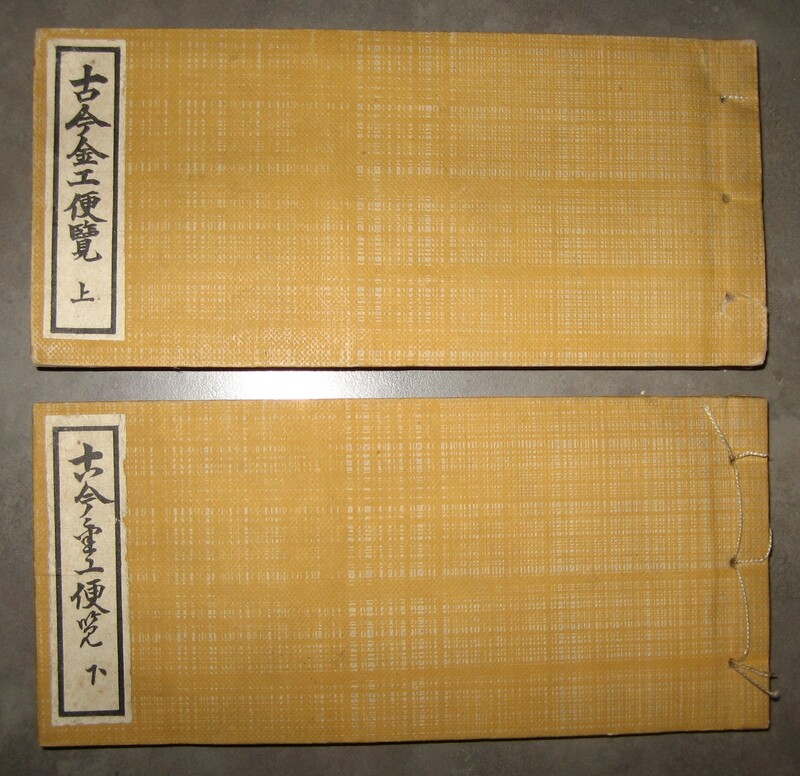 Many of the swords and mountings had Juyo and Tokubetsu Juyo papers from the NBTHK; the quality and importance of the items was impressive. Swords are shown in black & white; kodogu in catalog 1 are shown in color and mostly black & white in catalogs 2 & 3. Almost every item is thoroughly described and well illustrated. Each catalog has an index, glossary, and bibliography. All 3 books are in excellent condition. Two volumes, 1931 and 1932. 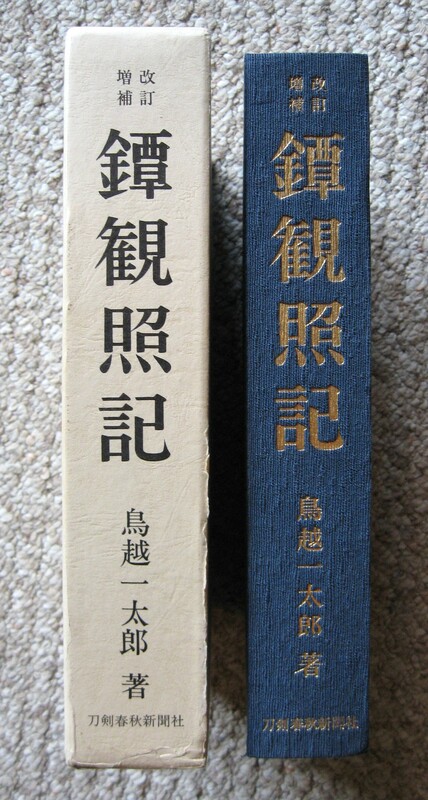 These two volumes present a fine collection of kodogu. 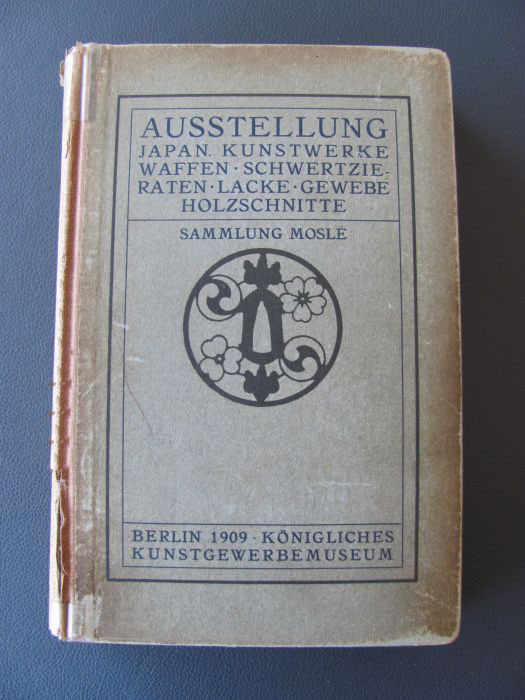 The 1931 volume (316 pages)is 26 pages of introduction, and short biographies of artists. 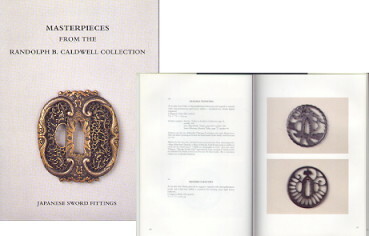 The 1932 volume (83 pages) is black & white photos of selected pieces. Both softbound, 7 1/4" x 10 1/2", written in German. A comprehensive examination of Kinai tsuba of Echizen province illustrated with numerous fine examples. Closeups of signatures is a great study aid. Book size is 7.5 x 10.25 inches. 198 pages, 6 color plates, over 100 b/w illustrations, clothcover with dust jacket. Japanese language. Edo period sword metal craft (Tsuba, Menuki, Fuchi Kashira, and Kogai). 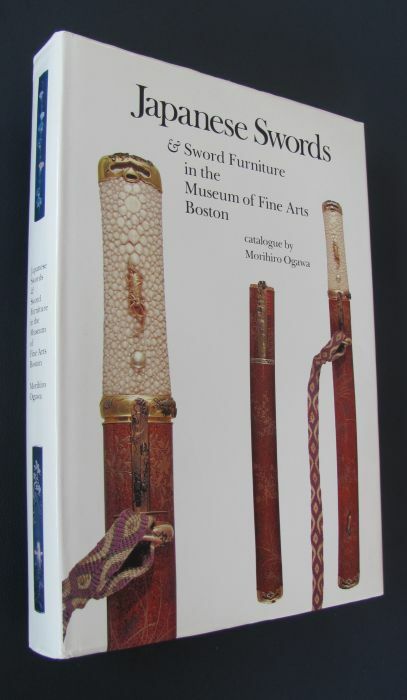 This book is a collection of artistically stunning sword fittings. Although most types of fittings are represented, the vast majority of the content are Tsuba. The grand thematic elements of these fittings, coupled with their visually resplendent execution make them truly stand out as amazing examples of their crafts. Incredibly, the artisans were able to create visual realms within the constricted spaces in which they worked. 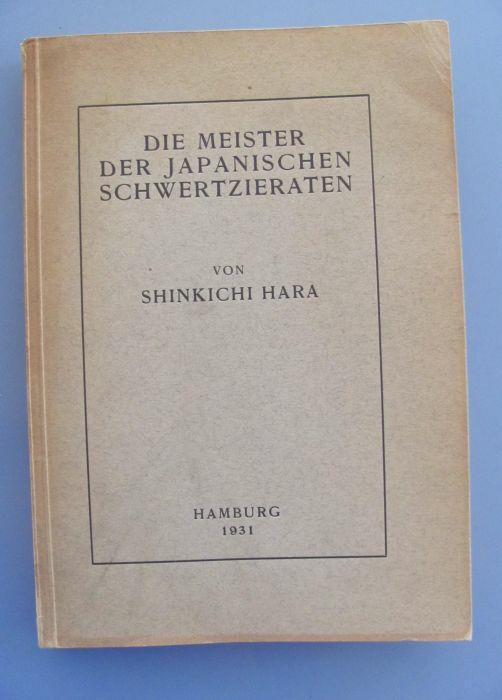 Text is Japanese, size is 15cm x 21cm, 224 pages, B&W and color plates, softbound with dust jacket. Soken Kinko Zufu: Tsuba To Tosogu Furukawa Zo 1913 by Wada Tsunashiro and Furukawa Toranosuke, published by Shimbi Shoin. 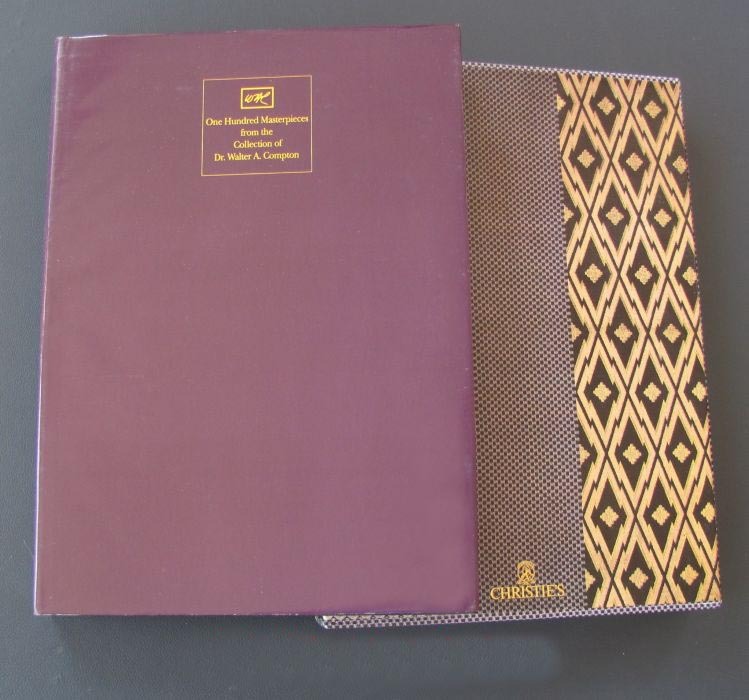 Brocade bound with traditional ribbon binding, 13 1/2 x 19 1/2". There are 29 pages of introduction and index, then 76 collotype plates separated by printed tissue guards; 698 pieces are pictured. Also included is a softbound, 8 1/2 x 11", 165 page translation to English, dated 2015 and in excellent condition. Baron Furukawa was a very wealthy collector of kodogu; he built an incredible collection before many people realized the value of the art. 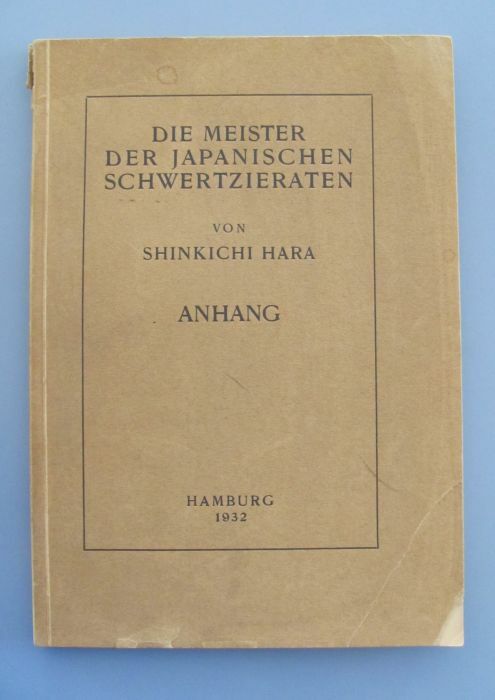 This book was published to be used as gifts for dignitaries and diplomats: printed in Japanese, English, and possibly other languages, 100 copies for each language. This copy is in Japanese. Robert Haynes has a copy in English. The importance of this book can't be overstated; it is special. This very early catalog produced by the Metropolitan Museum of Art presents the sword fittings collection of Masauji Goda. The preface describes the collection as an "effort to illustrate worthily the great art of Japan". 68 pages of text followed by a 93 page catalog of well described fittings with black & white plates. Printing was limited to 500 editions. The book is bound in tan wraps with gilt impressed title on the cover. Wraps have folds similar to a DJ. This very rare book is in very good condition for a soft cover from that period. A ready reference for advanced collectors. 161 pages, 5 1/2" x 8 3/4" soft cover. Undated. Clothbound with dust jacket, 135 pages in English. The Rosin collection is unusual in that is among a very few great collections of great kodogu collected by a westerner after WWII. It is also unusual for it's focus: only the very best. Beautiful book with a few hundred exceptional pieces by the greatest artists: Goto, Yasuchika, Jingo, Somin, Matashichi, and others. Both iron and kinko; very early and late. Condition is like new. Book size is 8.5 x 12 inches. hardcover with dust jacket. Text in Japanese and each of 483 illustrated items are described in English also. The book is inscribed at the back with ........ Predominately black & white photos (a few in color) of wonderful examples of the work of the Higo masters in both iron and kinko: tsuba, fuchikashira, koshirae, matchlocks, and more. This is an exceptional, comprehensive, and difficult to find reference. Book size is 8.5 x 12 inches. 650 pages, hardbound with plastic jacket and slipcase. Adapted from the HIGO KINKOROKU of S. Nagaya. 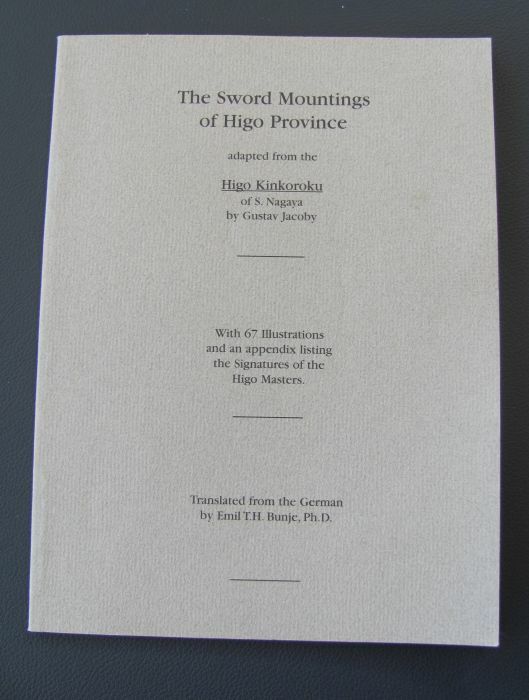 This is a needed introduction to the very important masters of the Higo Province. 67 illustrations, history, lineage, technique, and more. Softbound, 7 1/4" x 9 1/2", 62 pages in English. 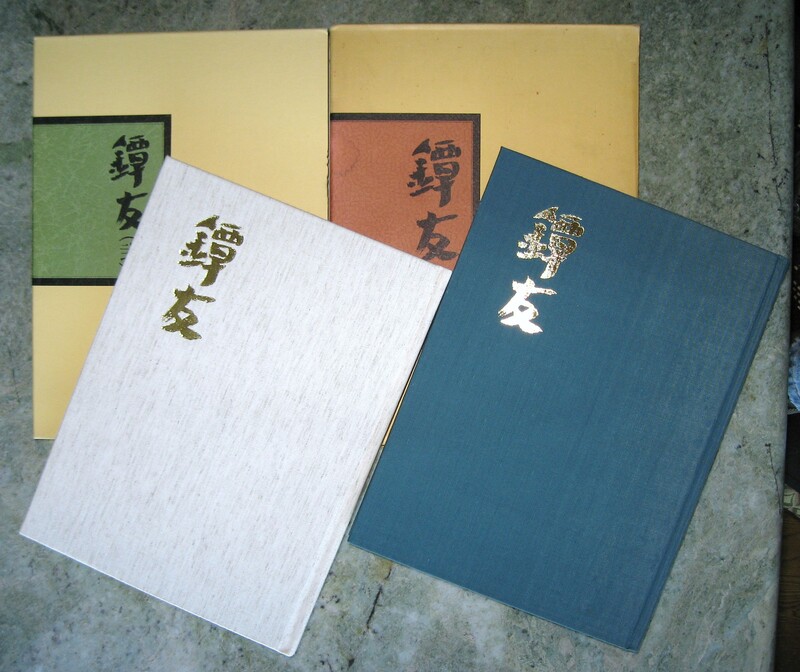 All items in each of the three books are shown in Staccato print color photographs. All items are shown both sides and are listed and briefly described in both Japanese and English. 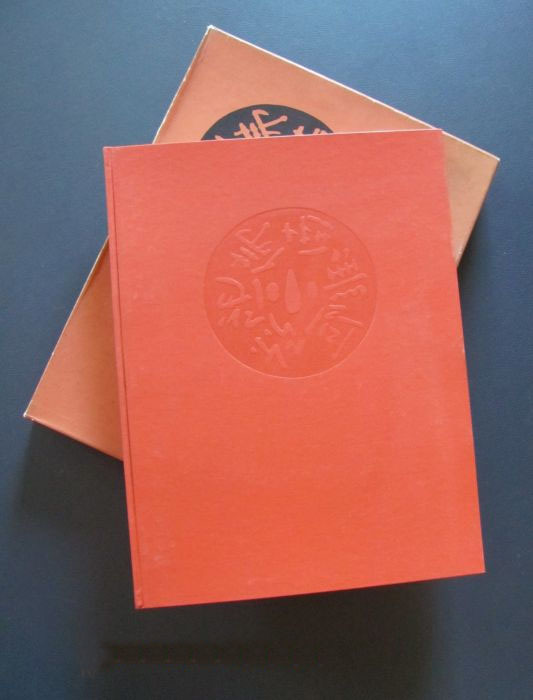 Each of the books comes with a separately bound full translation by Markus Sesko. VERY FINE $250.00 / Both Vols. The term "hyaku (100)" in this title means "various types," and not the quantity. The volumes show far more than 100 tsuba. In 1921 an exhibition titled "The gathering of one thousand tsuba" was held by a group of kodogu fanciers where several thousand tsuba were brought in by collectors nationwide. Kawaguchi Noboru photographed outstanding pieces and published them in "Tsuba Taikan." 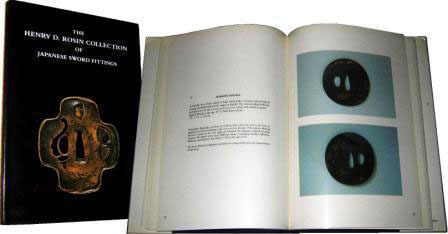 Fifty years later, Shibata organized a similar affair titled "The gathering of 100 tsuba," and many hundreds of tsuba in the hands of private collectors were exhibited. The books "Hyakutan" volumes 1 and 2 showcase fine pieces from the exhibition. 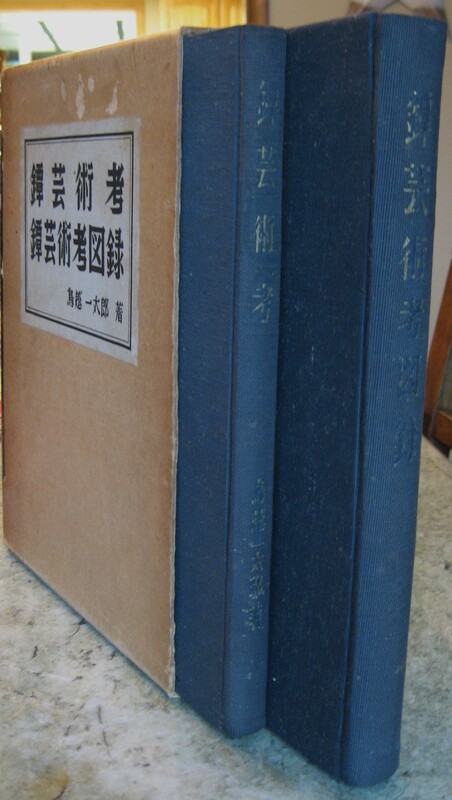 Japanese books: each is hardcover with dustjacket, 7.5" X 10.5". Vol. 1: 150 pages 1973, Vol. 2: 187 pages 1974. IWAKUNI BIJUTSUKAN + KASHIWABARA COLLECTION SOLD. Beautiful book: heavy stock glossy paper, excellent photography, strong binding, thorough text in both English and Japanese. First class kodogu. 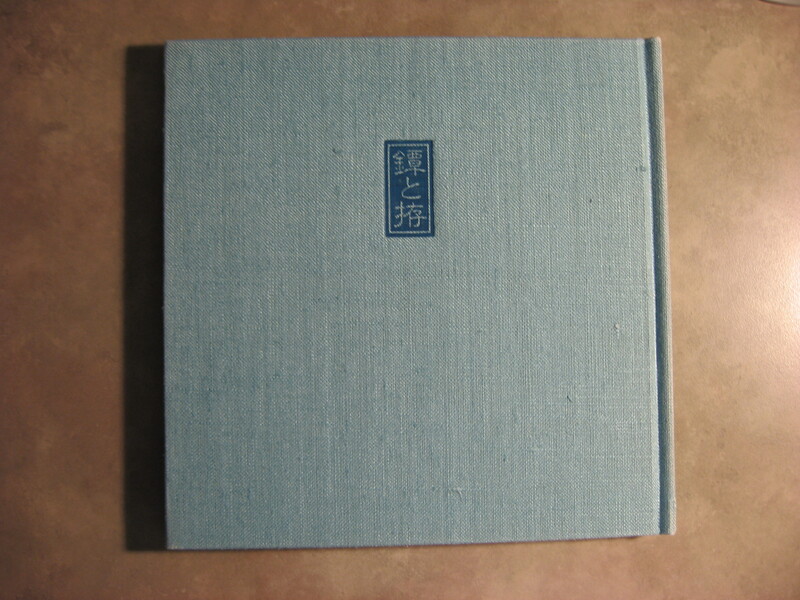 Clothbound with slipcase, 8 1/2 x 12 inches, 160 pages, in NEW condition. 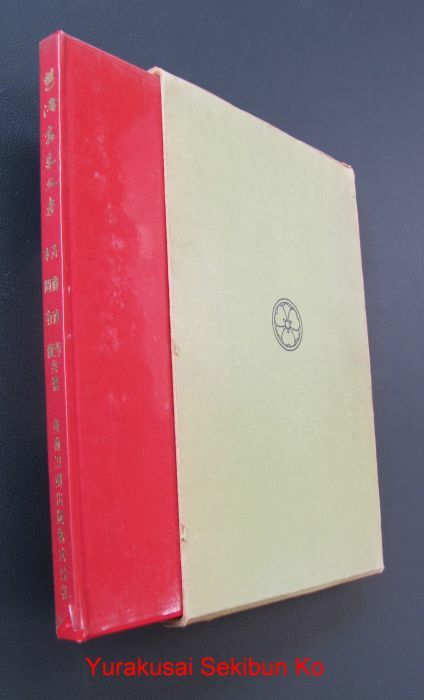 THE JAPANESE SWORD and ITS DECORATION, by Helen C. Gunsaulus (1924) $25.00. This is the very early catalog of the Field Museum of Natural History's collections of sword fittings. The collection's nucleus was formed by Edward Greey in the late 19th Century and represents the culmination of two lifetime's study. While staying in Japan Greey received top level assistance in assembling his collection by appointment of the Emperor. Extensive documentation of both artists and schools precedes 61 b&w plates. Each plate has three or more examples. A truly important and early reference of an outstanding collection. 256 pages, 6 1/2" x 9 1/2", Publication 216, Anthropological Series Volume XVI. 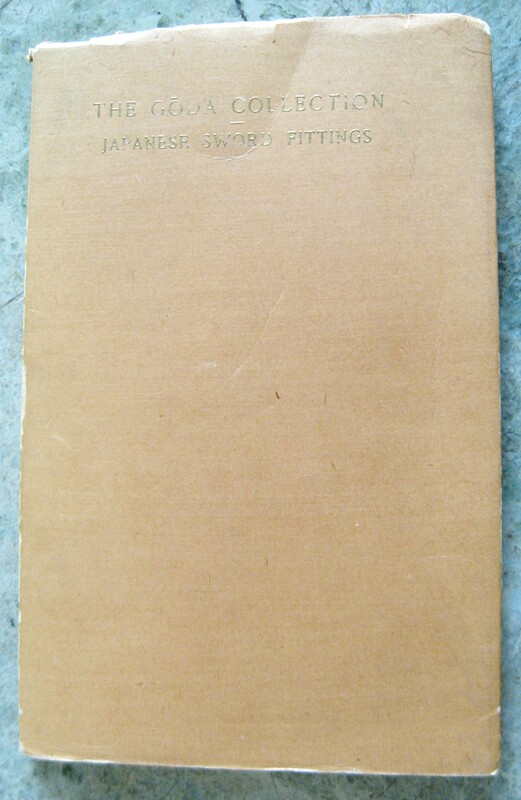 JAPANESE SWORD GUARDS by John D. Hamilton (1975), 2 copies available GOOD $40.00 each. 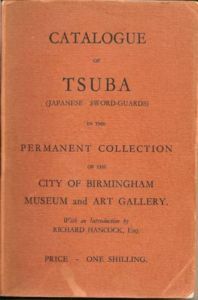 A catalog detailing the tsuba collection of the Peabody Museum (MA). 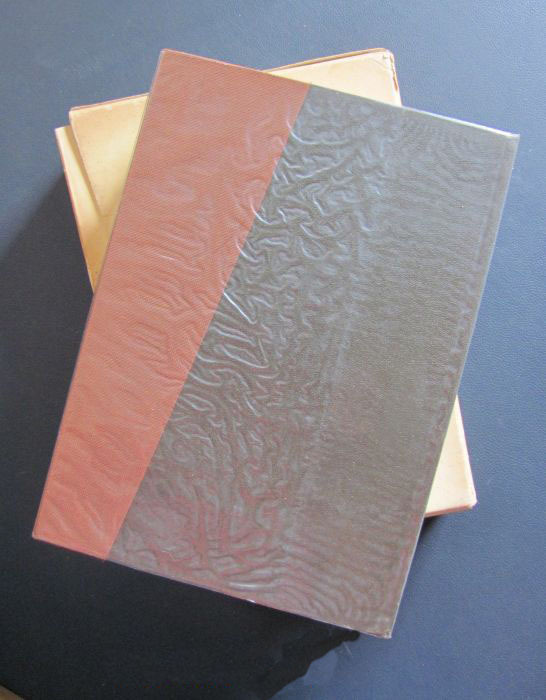 Presents an excellent range of both soft metal and iron examples in 43 full-page plates. Includes six plates in color. Most plates contain four or more pieces. Supporting text details each piece with commentary on design, school attribution, and period made. .
106 pages, 8 1/2" X 11 1/4", softcover w/ brodart dustcover. 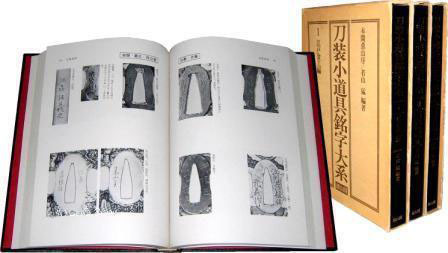 In the prefatory note of this book, Arthur Church says,"The collotype plates in this volume represent 272 specimens of Tsuba, that is, Japanese Guards, selected from the gathering of nearly five times that number which I have made since the year 1873. Floral forms and conventional ornament have particularly attracted me, so also, in a less degree, have peculiarities of technique, and even eccentricities in design." Sir Arthur Church's privately published work was developed with the assistance of Henri Joly. The 272 examples shown are categorized into forty sections and represent top level works of their respective schools. This book contains a lot of fabulous design collected by Koto Yamaoka. Out of print, very rare, stamped gilt lettering on spine, gilt outline of tsuba on front cover, slightly bumped corners, discoloration to spine due to shelf life. This edition has the added benefit of both the original English content together with Japanese translation. 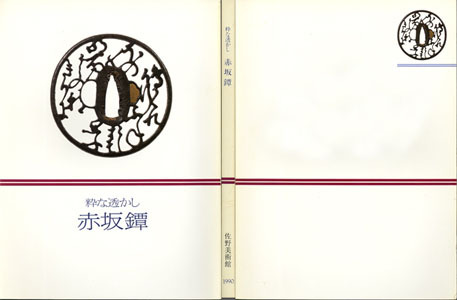 Title also shown as Nihon Tsuba no Bi on spine and slipcase. Hardcover Size approx 26.5cmx33cm Deluxe edition w/ slipcase Approx. 170pages. If you are interested in Japanese Guards,this book would be a great collection for you. 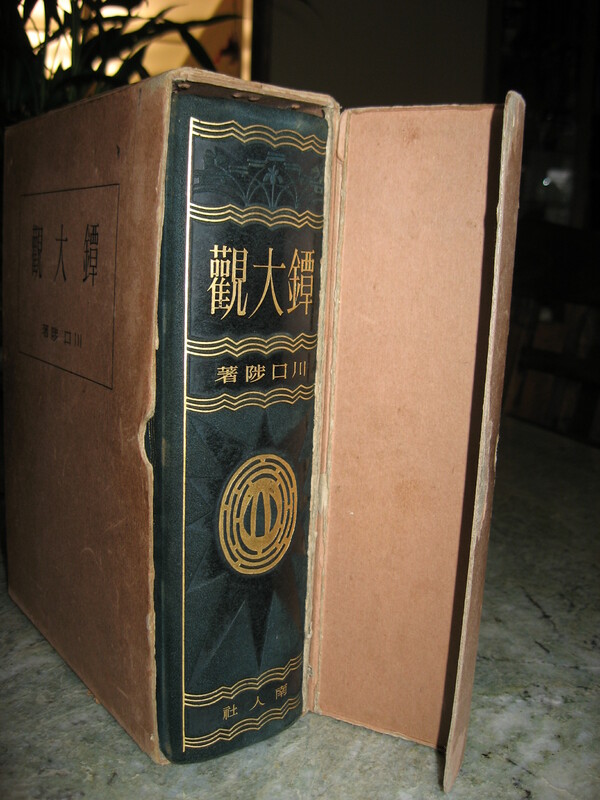 The landmark volume presenting the Boston Museum's important collection, the nucleus of which was bequeathed by Dr. William Bigelow who assembled his collection with the assistance of noted scholars while residing in Japan at the turn of the Century. This large volume includes extraordinary photography and oshigata of the masterworks; the format and production quality made possible by substantial grants at the time of its single printing in Japan. The level of detail in both the images and accompanying English-language descriptions rivals the best of any high-end reference. A separate 38 page illustrated glossary is also included. 423 pages, 10¼ x 14½" hardcover w/ dustjacket. 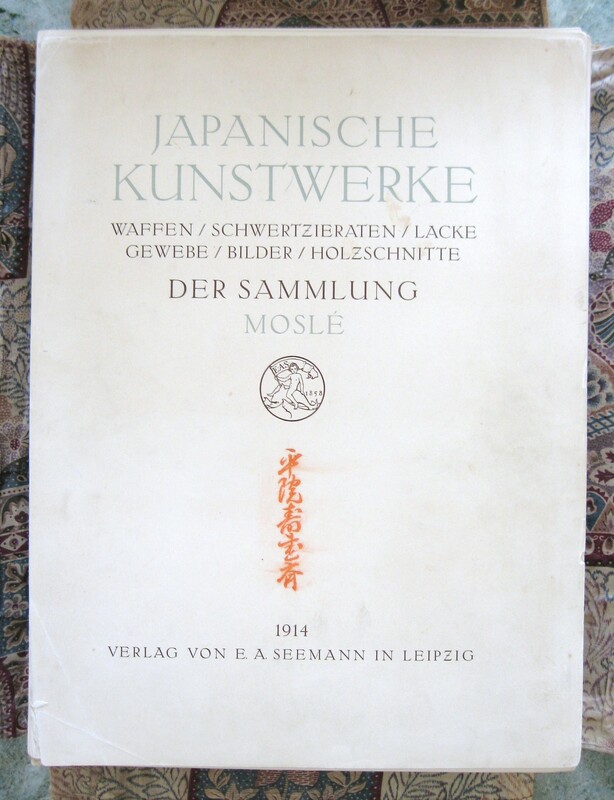 Go to Alexander Mosle Collection (HERE) to see all books available. 2011 facimile of a 1916 original. Of the great European collections of kodogu built in the late 19th century, Mosle and Oeder stand out. Must be they had good judgement and expert help; the pieces in each collection were wonderful. This is the catalog of the Oeder collection, the first time for me to have the book which is, apparently, quite difficult to come by. 1,798 pieces: tsuba, menuki, kotsuka, and fuchi kashira are described and many are illustrated. Clothbound, 9 x 12", 218 pages in German. This book is in excellent condition. This is a very fine book on the master Kaneiye, showing tsuba and a few kosuka/menuki in black & white, with many extreme close up shots. Fully illustrated with many close ups, a detailed examination of Kaneiye tsuba. 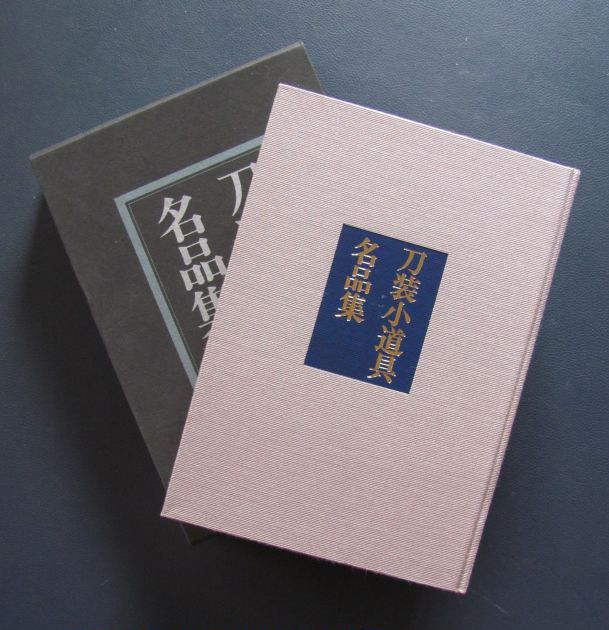 Text in Japanese, limited edition of 1000 copies, blue texture cloth hardcover with slipcase, Like New condition, 10.25" x 14.5", 106 pp. Preface, enlarged images, illustrations of the subjects used from Sesshu and Shubun, landscapes, designs of temples, mountains, water plants, and birds, etc. Post script. Limited 500 copies. 37.5cm x 27cm x 1.3cm, 47 pp., excellent condition.
. A must-have comprehensive study of Kaneiye tsuba. Excellent illustrations captioned in Japanese and English. 92 wonderful tsuba by the masters of the Kaneiye School (2 generations) are shown both sides with crisp black & white photos. Extensive signature examples. In 'Very Fine' condition with green texture cloth hardcover and slipcase. 8.5" X 12", 212 pages. Images include eight by Kaneiye and thirteen by Nobuiye, text in Japanese. All tsuba are shown about 1 1/2 times actual size in crisp color photographs. These are the best images of these two masters pieces of any book to date. 11 3/4" x 8 1/4" plates, 21 total, excellent condition. First Class menuki, kogai, kozuka and fuchi/kashira are shown in quality color photos and described well in Japanese, German and English. 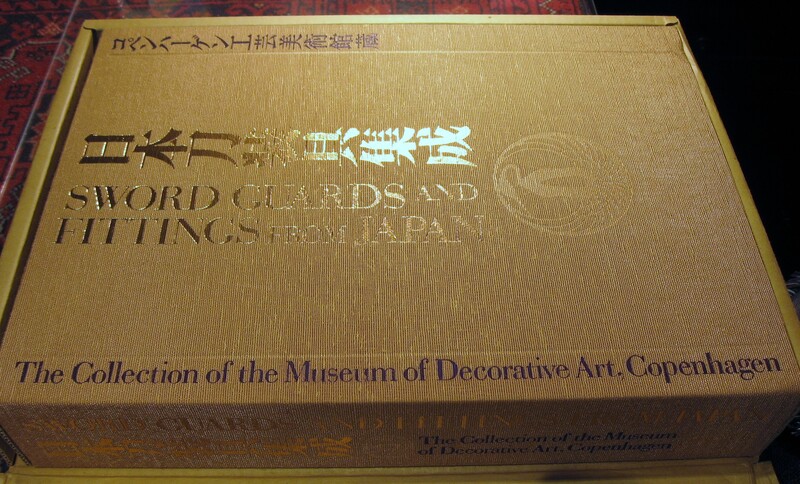 At the rear of the book are close up photos of the signatures and back sides of the menuki, a glossary, and indexes by artist, school, and motif. A wonderful and sought reference for First Class fittings. 12" x 12", 264 pages, clothbound with dust jacket and slipcase. 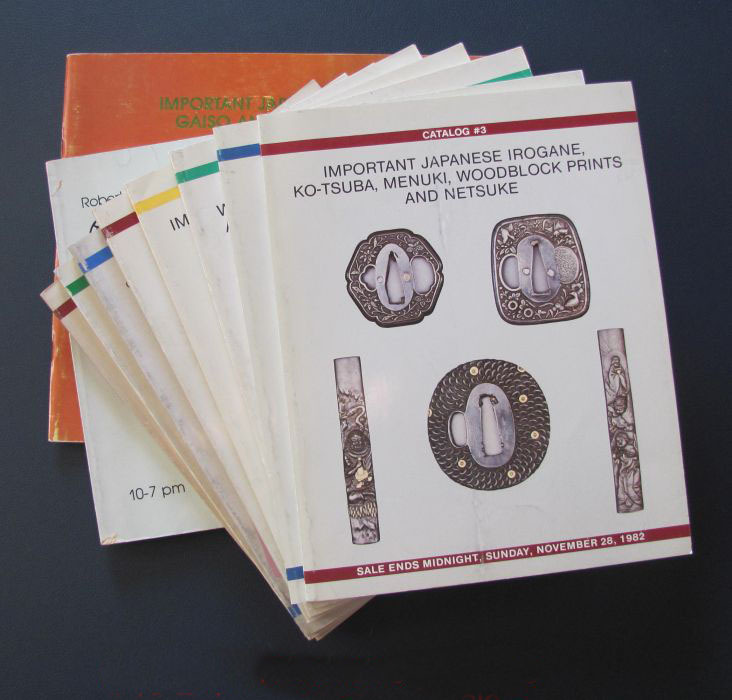 This is a complete set of catalogs from the Kokusai Tosogu Kai, an international group dedicated to the study and appreciation of tosogu, or Japanese sword fittings. Held in many different locations, the exhibition features items from Canadian, US, and Japanese collections. All items are professionally photographed for each catalog, and reproduced to the highest standards. The catalogs also feature many articles, such an article by Robert Haynes, "My First Sixty Years as a Student of Kodogu," complemented by photos from his personal archives documenting his years of study. Another article included is an insightful colloquy between the president of the Sano Museum in Mishima and the director of the NBTHK on "Sukashi Tsuba, Their Use and Aesthetic Beauty." All catalogs are First Editions, limited to 400 copies each. 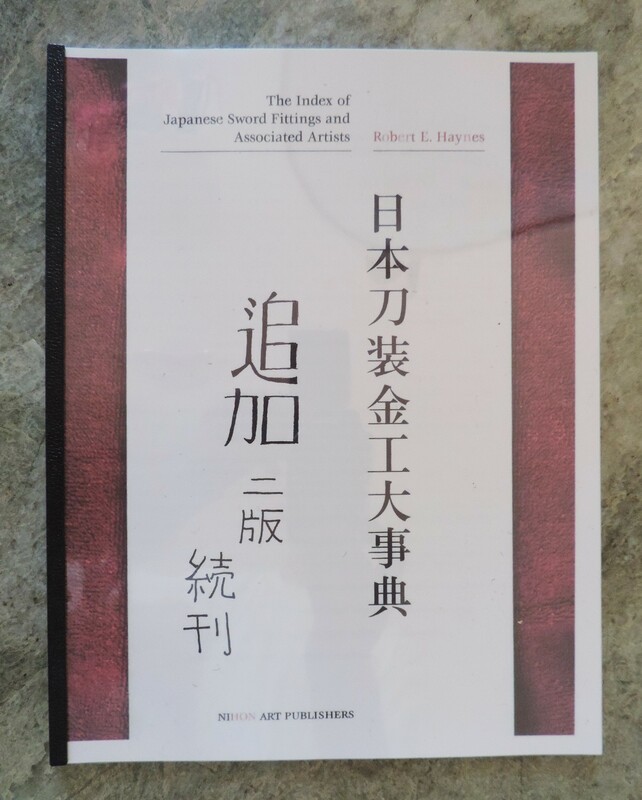 Covering all forms of Japanese art, along with artists, mythological and historical figures, a dictionary of terms, signatures and more, this is an indespensable reference work on the art of Japan. 11.7" x 15.4", Hacker reprint of 1923 edition, 2 vols., 511; 509 pp., 75 b/w plates, 1,100 figures, text in French, hardcover, New York, 1965. 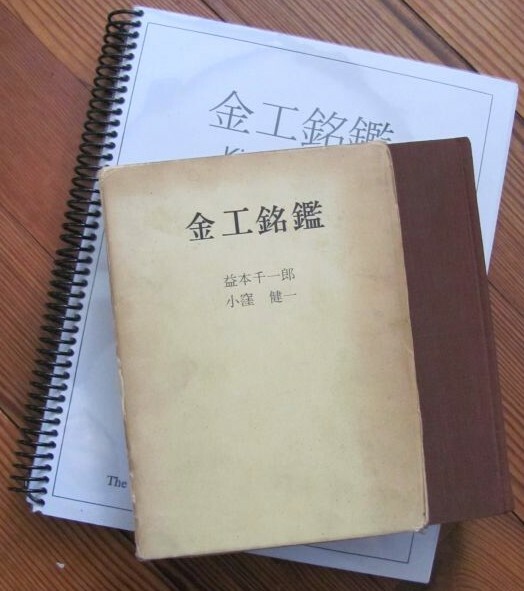 Included is English translation of Nihonto related topics in 3-ring binder. 206 examples of Higo tsuba, Hayashi, Kamiyoshi, Nishigaki, Shimnizu and Tsuboi schools. Illustrated in black & white photos and with descriptions: a very fine book. 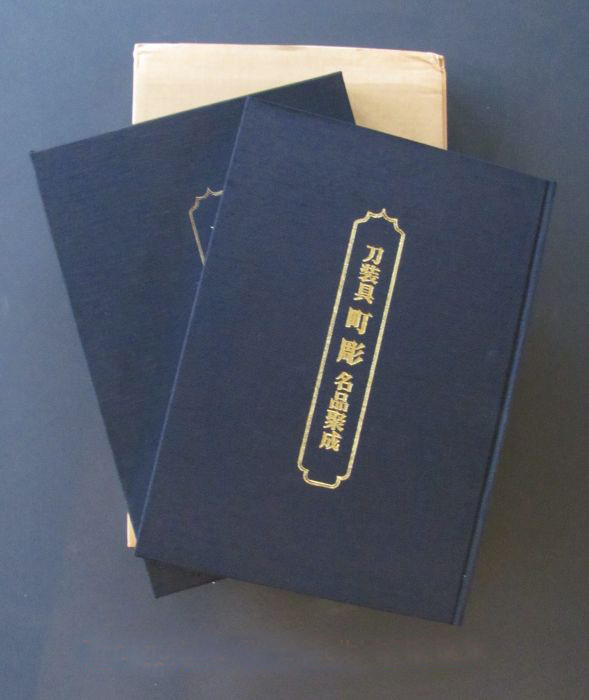 Hardbound with slipcase, 8 1/2 x 12 inches, 176 pages in Japanese. In 'like new' condition. (Hikokan Seisho Kurokawa Kobunka Kenkyujo Zohin Zuroku) 1993. 111 great Japanese swords are shown in large, crisp black & white photos. Many of the swords have been designated treasures by the Government of Japan. Many very important names. This is a beautiful book in NEW condition. 10 1/2" x 14 1/2", 281 pages in Japanese with an introduction and list of plates in English. Silkbound with dust jacket and slipcase. 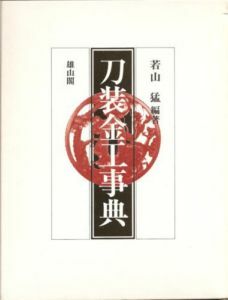 (Hikokan Seisho: Kurokawa Kobunka Kenkyujo Zohin Zuroku) 1997. 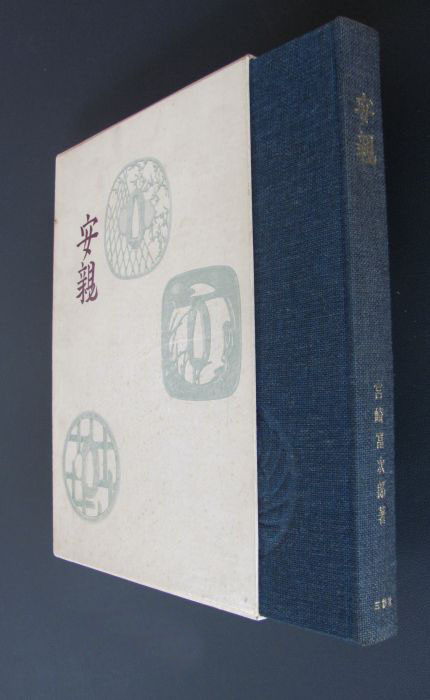 Silk bound with dust jacket, slipcase, and storage box, 10 ½ x 14 ½”, 251 pages in Japanese with an introduction and list of plates in English. Book exhibits excellent collection of 316 tsubas (33 in color and 293 in B/W) in luxurious quality and huge size (10.4" X 11.6"). Especially, 116 Higo tsuba is well focused. The selection is heavily weighted to work of Higo, and at the back there are 5 pages of a Higo design book from the 19th century. Book covers from the Muromachi to the late Edo period and the characteristics of each tsuba tradition and schools are well explained. English caption and explanations for each piece. 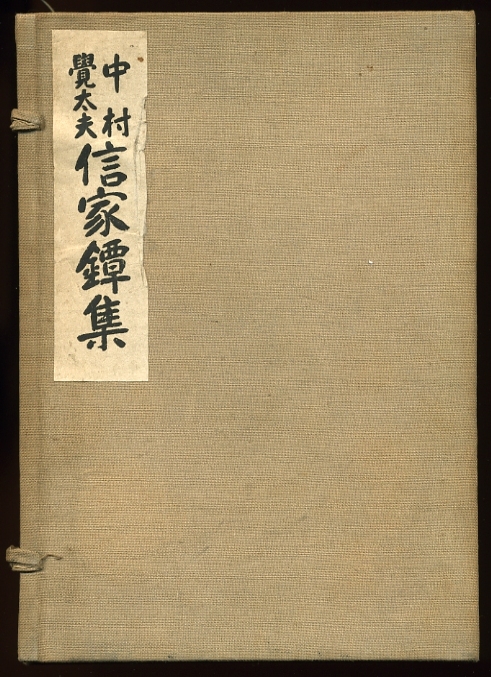 A unique text presenting a written survey in both English and Japanese of the waki-Goto schools, the fifteen branch families of the mainline Goto masters. There is an 18pg. history of the families in English with bio-graphical details of the artists. 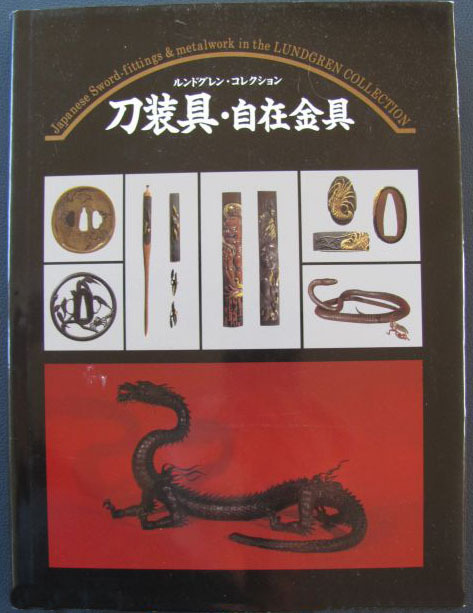 The illustrations show 194 kozuka & kogai, 36 tsuba, 32 fuchi-kashira and 17 sets of menuki. Each piece is shown full size with enlarged, detail photographs of inscriptions. This English translation also extends to the captions and descriptions accompanying each plate. 334 Pages, 7¼ x 10½" hardcover with slipcase. 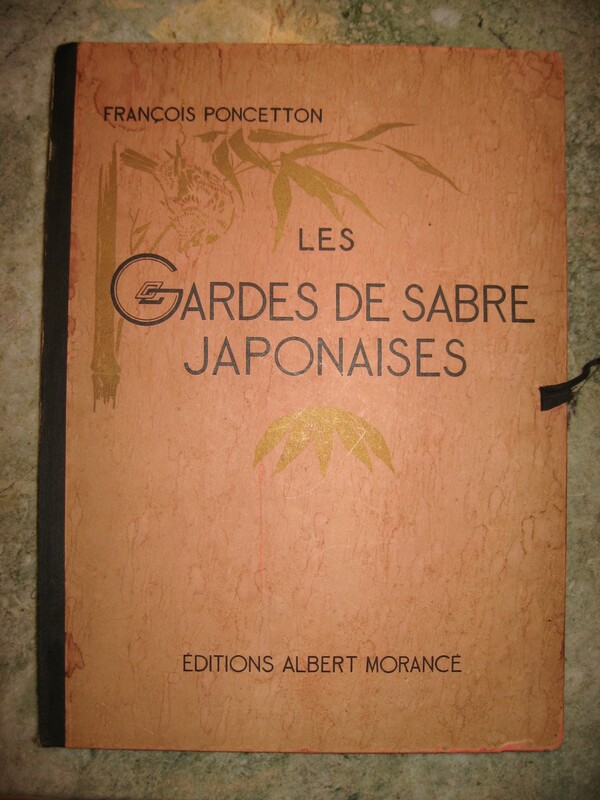 LES GARDES DE SABRE JAPONAISES by Francois Poncetton 1924. Large portfolio (12" x 16 1/2") in tied printed hardcovers. Containing a 28pp descriptive text in French language, and 50 lose plates of 182 photoengraved tsuba. 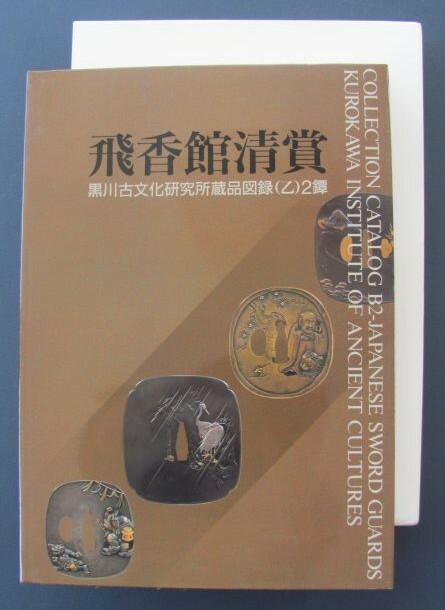 A very useful catalog of this important collection of classic tsuba. The spine and ribbon ties of the portfolio are missing or torn but the contents are very good and complete. 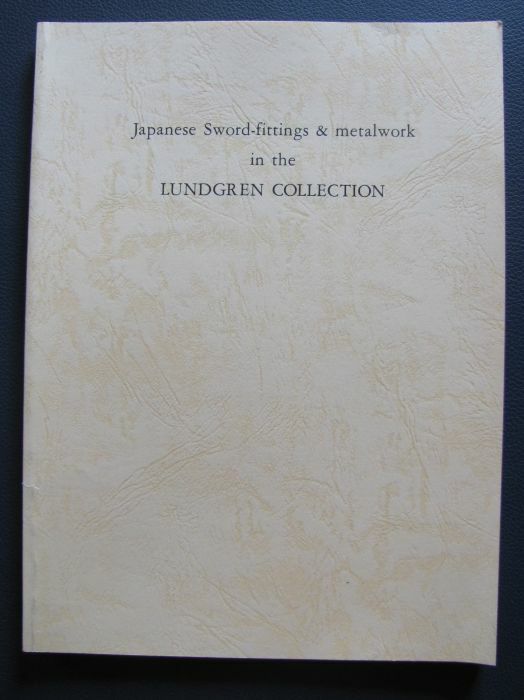 JAPANESE SWORD FITTINGS & METALWORK IN THE LUNDGREN COLLECTION 1992 VERY FINE $200.00. Hardbound with dust jacket, 159 pages in Japanese and an introduction in English. This is a very nicely done book with crisp color and black & white photos of an important collection of fittings and other metal work. Other metal work includes finely crafted articulated animals and insects. Also included is a softbound, 60 page translation to English, which lists all the plates and has a discussion among the authors. 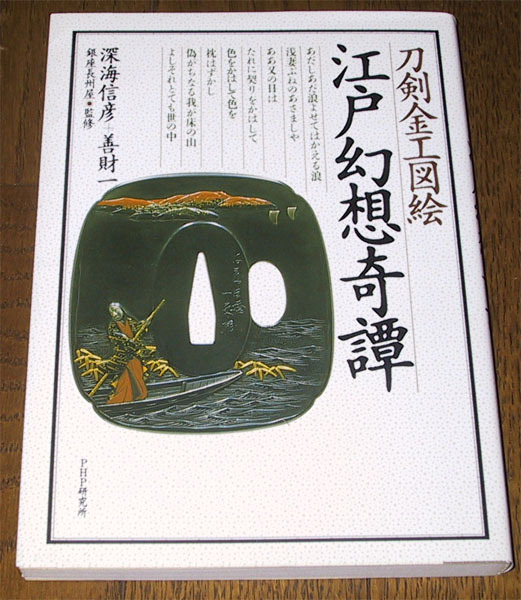 A guide book to famous tsuba. 100 examples. Showa 40 April 20 1945 (Eikyu). 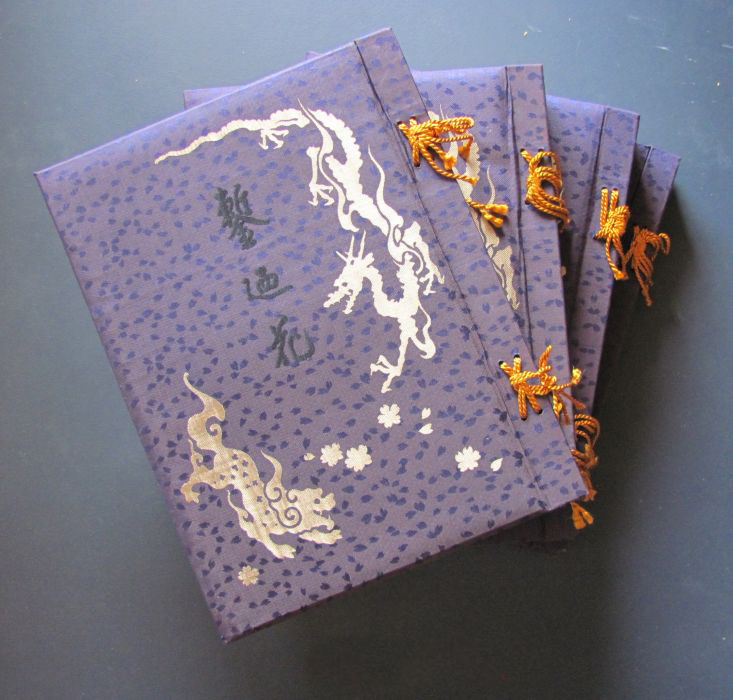 Clothbound with slipcase, 6" x 8 1/2", 100 pages in Japanese. 100 fine tsuba in crisp black & white photos with text. Excellent reference book. 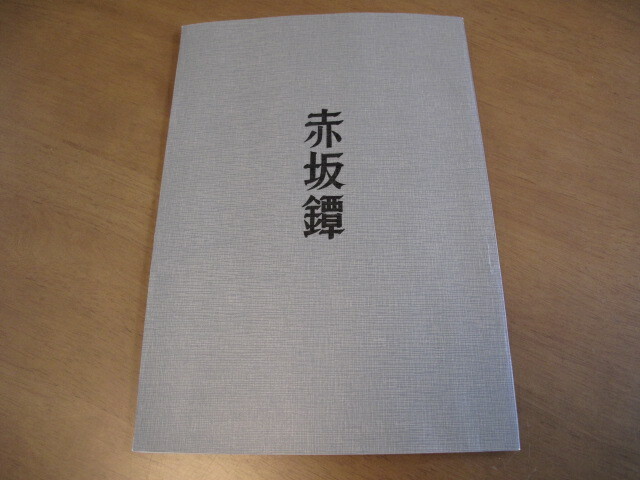 A very nice clothbound book with plastic jacket, 7 1/4" x 10 1/2", 74 pages in Japanese. Black & white photos of mostly tsuba, and kodogu of the Mito area by the Tsuba Club of Mito. 1966. NAMBAN TSUBA by Yoshimura Shigeta 1998. Two copies, in FINE condition, $300.00 each. Softbound, 5 3/4" x 8 1/4", 108 pages in Japanese. There are very few books in print on the subject of Namban/Asian Export Guards: this and Dr. Lissenden's book. The first sixteen guards are shown in color; the rest are in black & white. 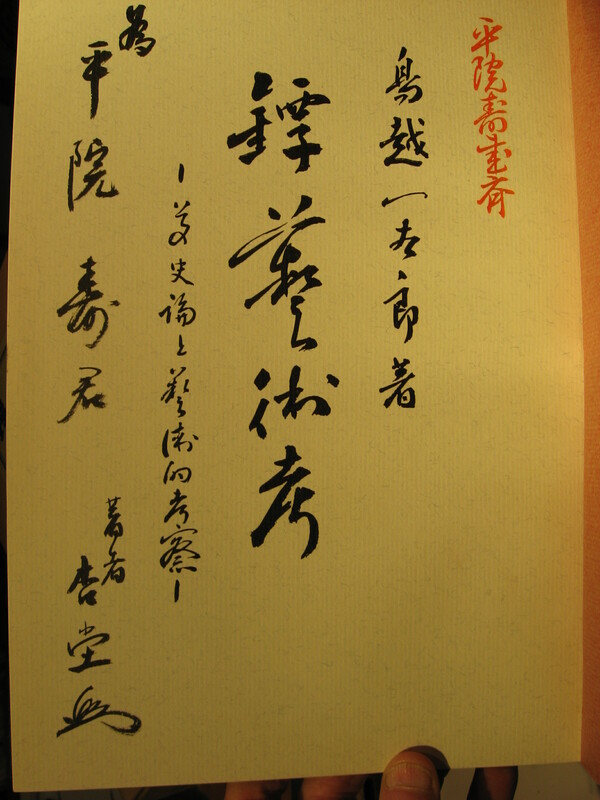 This is the study of the work of the three masters of kodogu from Nara: Toshinaga, Yasuchika, and Joi. In Japanese but each piece illustrated has its label in English also. There is a 10 page introduction in English. The 404 pieces are shown in crisp black & white and color photos. Clothbound with slipcase, 8 1/2" x 12", 650 pages. In debth study of Japanese Sword Fittings and Artists. Examples of signatures, techniques, and other empirical data gathered from many sources. Condition is GOOD, excellant reference book. Previously owned by Alan Harvie. 8 3/16" x 5 7/8", 526 pages, hardbound cover worn and loose from text. A very good reference for Kinko fittings. About 590 pages in the volume that is mostly Japanese text and about 200 pages in the volume that is images. The images volume is heavy stock paper printed one side only. There is an index in each volume. The books are 6.5" x 8.5" with a slip case that holds both. This is #254 of a limited edition of 1000. "Toban" is the old name of tsuba. 735 first-class tsuba that are arranged by school and illustrated life size in crisp black & white photos. Many of the tsuba are those that do not appear in the other books of the same subject. 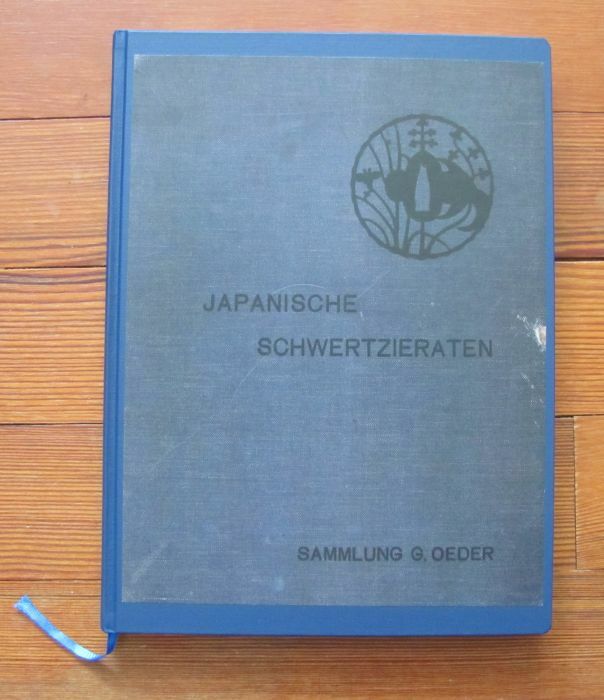 This book is quite rare and seeked by many tsuba collectors to date. 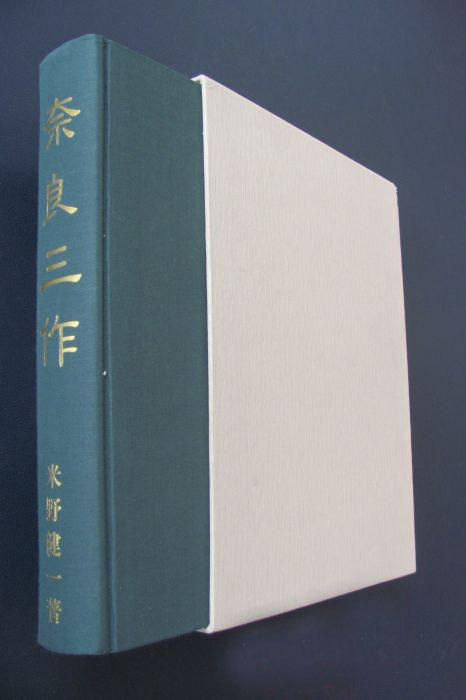 Hardbound in slipcase, 10 1/4" x 13 1/2" inches, 277 pages in Japanese with a list of plates in English. 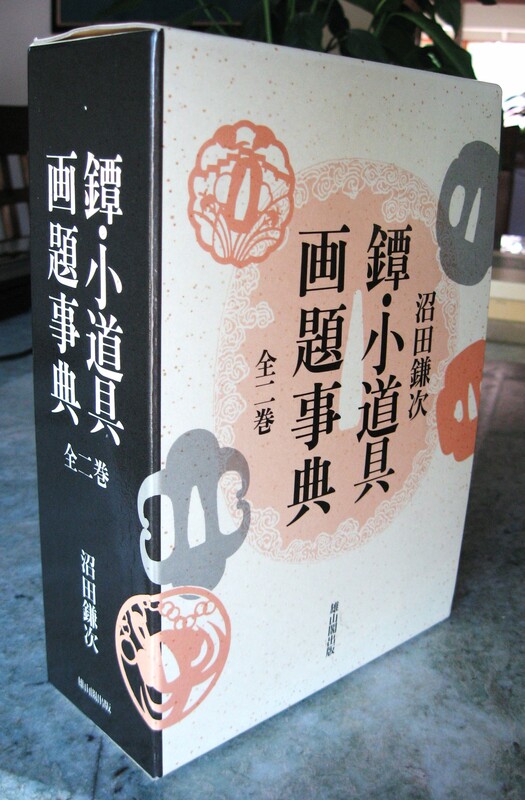 This is 1 volume from the 8 volume set; the set is the ultimate in Nihonto books. This volume covers tsuba, kozuka, kogai, and menuki, and includes only the best. 675 pieces are shown life size in black & white and color photos. 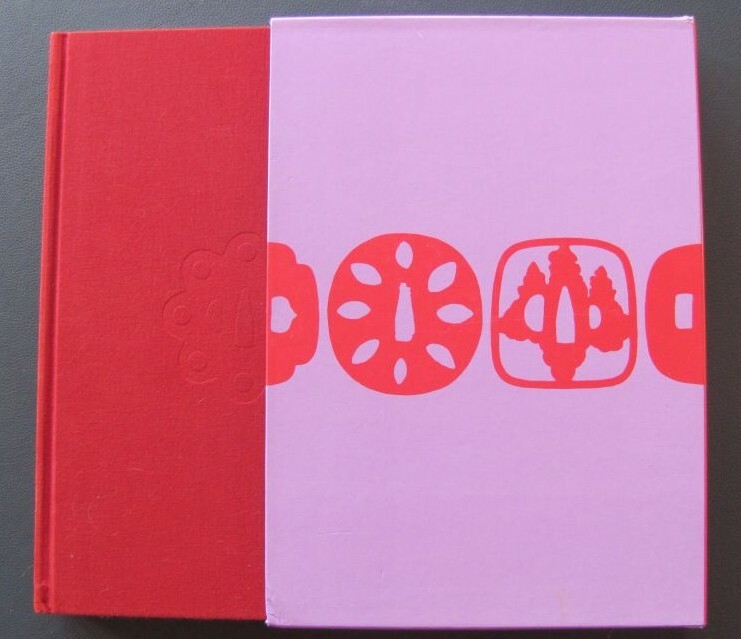 Published in 1972, clothbound with slipcase, 10 1/4" X 14 1/4", 610 pages in Japanese. 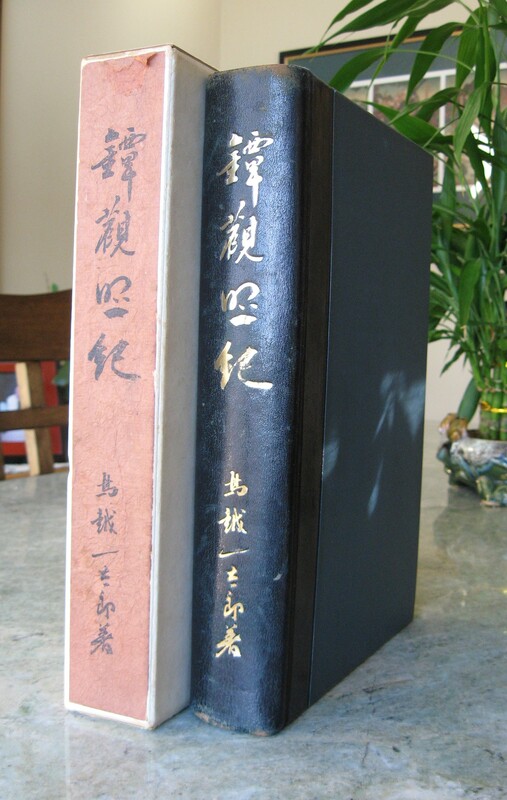 First authoritative compilation of Nobuiye tsuba through quality rubbings. A large selection of tsuba is represented, covering all makers and periods. Condition is very good for such a rare book, with clean pages throughout. Traditionally bound in original folding cloth case (minimal staining spots) with ivory closures. Text in Japanese, 23cm x 18cm, 144 pp. 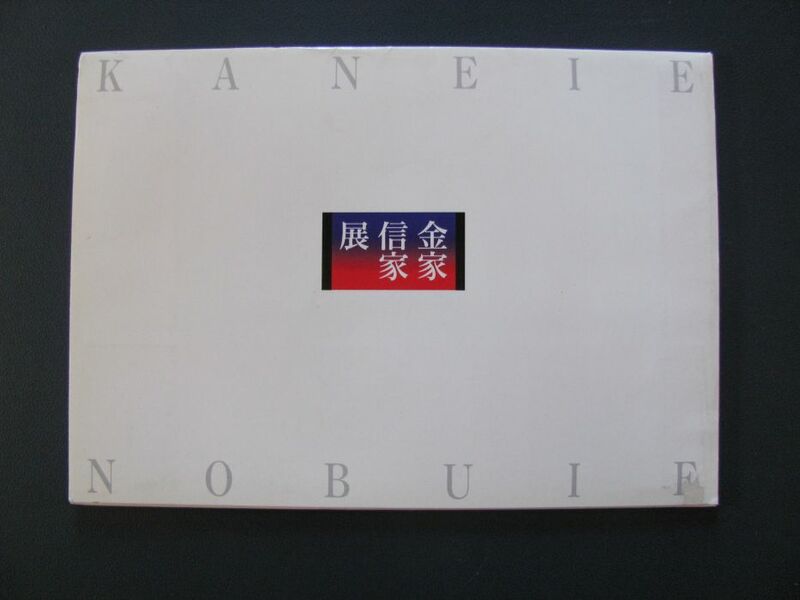 The most complete reference book on Nobuie tsuba. Fully illustrated with b/w plates and illustrations. Much detail of the work and signatures. Text in Japanese. 7.2" x 10.4" inches, 279 pp., near fine hardcover in slipcase. Included is a spiral bound, 8 1/2" x 11", 80 page full translation into English. Preface, enlarged images, pictures of Kikko-mon, sea weed, wave, karakusa, etc. Post script. Limited 500 copies. The 100 best pieces from the famous Compton sales at Christie’s Auction House are shown in exceptional photography (black & white on swords and color on kodogu). Many more photos than pieces, with lots of extreme close-ups; a truly beautiful book. Also includes essays on Dr. Compton's life and connoisseurship. Shows forty-two swords and fifty-eight other pieces including tsuba. Each piece in the catalog has a brief description in kanji and a comprehensive one in English, describing the piece in detail and giving a biography of the maker. Those of the blades are by Martin Lorber, and of the fittings by Robert E. Haynes, who is recognized as the leading authority on fittings outside of Japan. 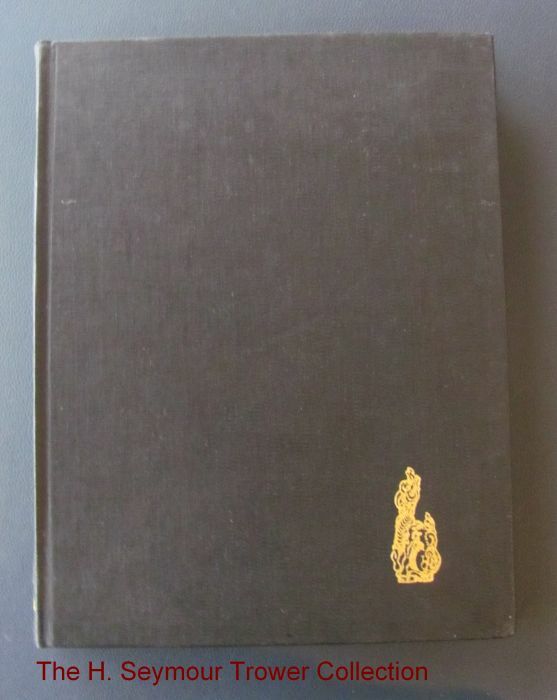 Clothbound with dust jacket and slip case, 10 ¼ x 14 ½”, 321 pages in English. 55 color and numerous b/w illustrations, text in English with Japanese captions, glossary, bibliography. 120 pieces of very impressive kodogu are shown in crisp photography and well described, with a forward by Robert E. Haynes. Hardbound with a dust jacket and plastic jacket, 8 1/2" x 11 1/2", about 70 pages in English. Tsuba from Owari and Mikawa Provinces, covering many well known smiths and schools: Norisuke, Yagyu, Yamakichibei, Hoan, Kanayama, Owari, Nobuiye, and more. Both iron and kinko are included. Clothbound with a slipcase, 8 1/2" x 12", 341 pages in Japanese. Included is a spiral bound, 8 1/2" x 11", 151 pages complete translation to English. beauty and charming Japanese 19th century metal work. Fine catalog presents Bakumatsu and Meiji-era tsuba from the collection of the Kiyomizu San'nanzaka Museum in Kyoto Japan. Many decorative styles (yoshiki) and techniques were devised..when wealthy merchants could outdo daimyo in financial power and so ordered ornate items including up-market materials..from metalworkers. Japanese language with English table of contents, forward, and tsuba-ko noted for each piece in romanji. Vivid, full-color photography on high quality stock. This is an excellant reference for students of tsuba. NEW, softcover w/ dust jacket, 96 pages, 8 3/4in X 11 1/2in. 310 pieces of kodogu from Shonai are shown life size in black & white and color pictures. 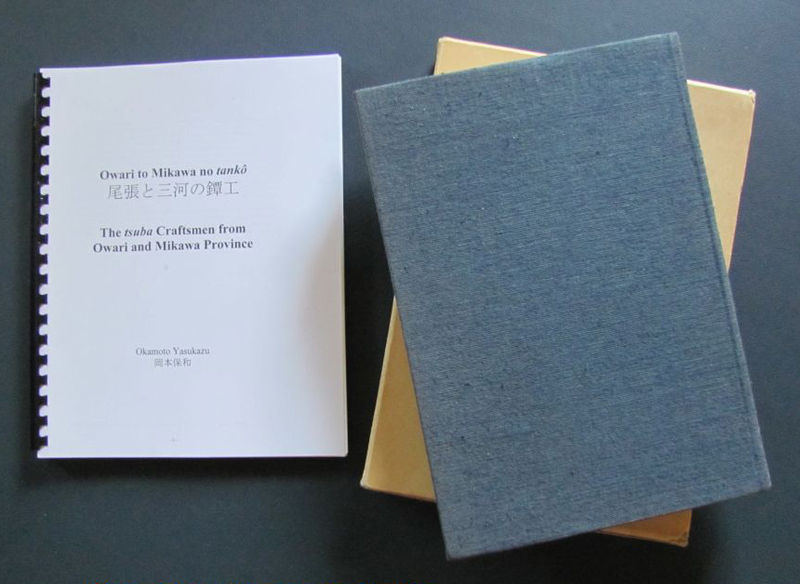 Clothbound with slipcase, 8 1/2" x 11 1/2", 300 pages in Japanese. STUDY GUIDE of TSUBA by unknown student. 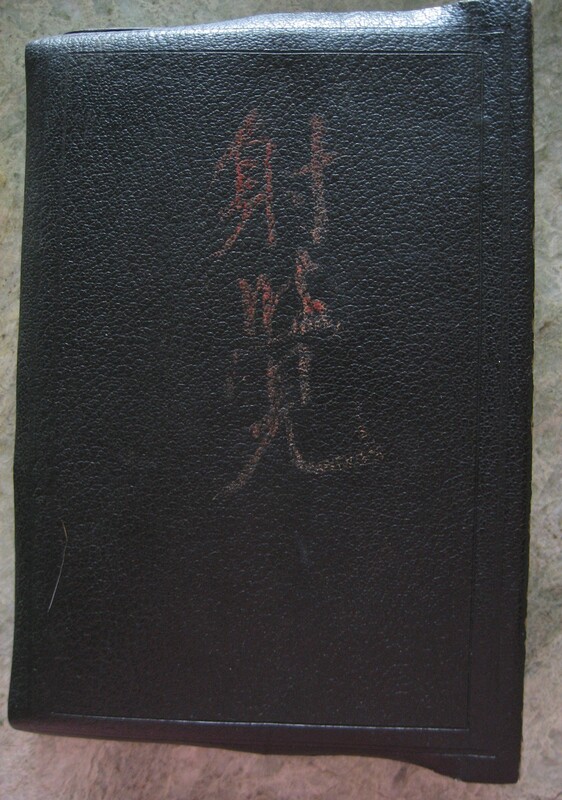 This book has been assembled by an unknown student of Japanese sword fittings, mostly tsuba. The first section was taken from the TSUBA TAIKAN. The images above are in no specific order. It seems that as sections were received, they were entered into this study book. All text in Japanese. Written in both English and German languages. Starting with a dedication to Masayuki Sasano, Kremers text follows a format similar to that used by his teacher. General guidelines for judging iron and overall quality are presented in the introduction while greater detail is offered throughout the text in reference to the specific pieces. Arranged chronologically and by school, and illustrated with crisp black & white photos. Each tsuba is shown life size and commented upon. Hardbound with dust jacket, 7 3/4" x 10 3/4", 189 pages. Tagane no Hana (Flower of the Chisel) was originally published in 1903. This is the third edition. 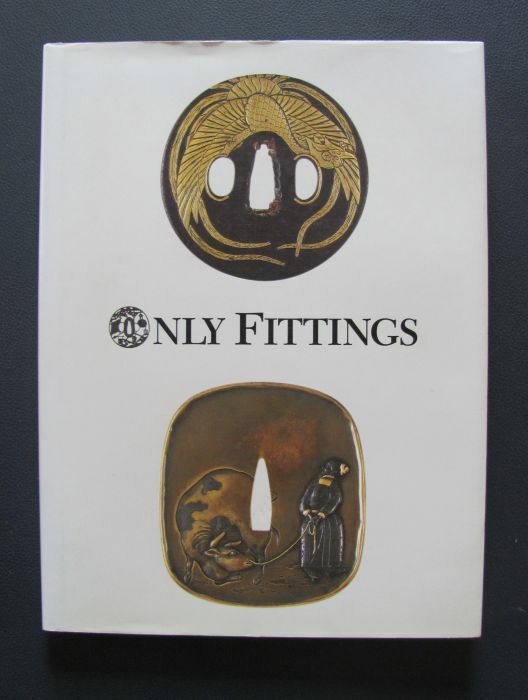 Thousands of pieces: tsuba, fuchi/kashira, kogai, kotsuka, menuki, and others are included. Each page of photos is overlain by a translucent page with the description.Clothbound tied binding in four volumes with cardboard slipcases. 12" x 15 3/4" about 200 pages each volume. Perhaps little known outside of Japan, the Tanyu Kai is a very private, exclusive group of kodogu collectors in Japan. Membership by invitation only, the group has published items from some of the best private collections in the world. The kodogu illustrated in these two books are as good as it gets, and rarely shown to outsiders. Top quality photos on heavy paper. Here's your look at the cream of Japan's private kodogu collections. Very hard to come by. Both excellant with slip covers. Copy and translation by Henri L. Joly, edited by Alan L. Harvie and annotated by Robert E. Haynes & Alan L. Harvie. 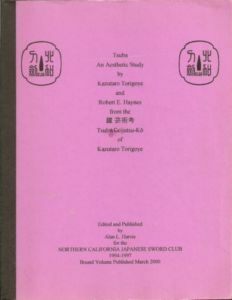 Reprint by Northern California Japanese Sword Club, 2002. Spiral bound in 2 volumes, 8 1/2" x 11", about 330 pages in English. This is a reproduction of an early Japanese book. Drawings of 313 fine tsuba, with commentary by three important students of the art. For the money, this is a great reference. Estimated to be authored in 1736, this is the oldest monograph on the appreciation of the tsuba. The hand-written original has long been lost, but over the years numerous hand-copies were made among tsuba and sword enthusiasts (Toban Zufu or Toban Zuroku). 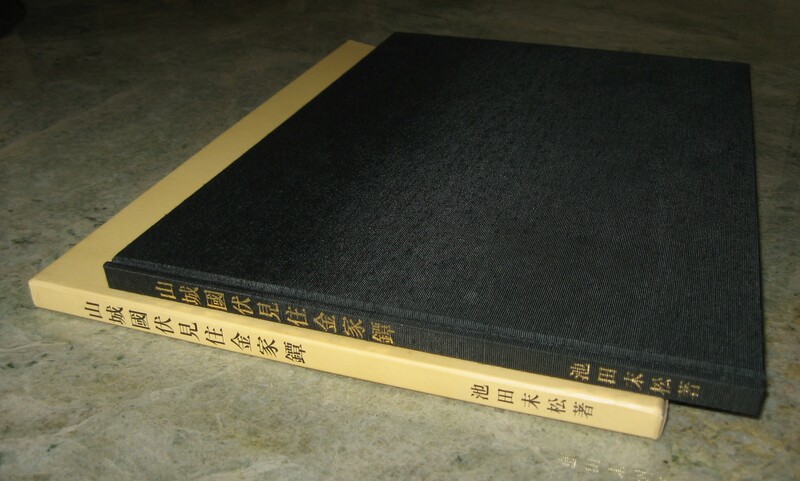 Since the extant copies were becoming scarce and out of reach of average tsuba enthusiasts, Shibata Mitsuo undertook the project of publishing the book in a modern format in 1967. This book is the result of that effort. Original text and illustrations (taken from several reliable copies in existance) are duplicated in large pages, and modern typesetting was added to enable today's audience to read the cursive classical writing. 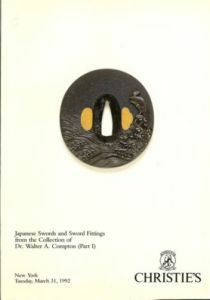 The direct translation of the title is "Orally transmitted secret of the appreciation of the tsuba," but "How to appreciate the tsuba" would be much more appropriate for the content. 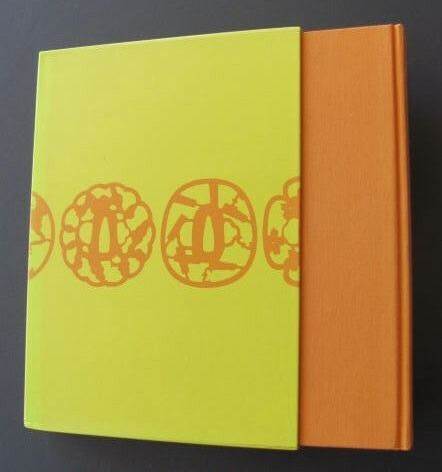 Excellant condition, tan clothcover and slipcase with 210 pages, 7 1/2in X 10 1/2in. Text in Japanese. GOOD broken set (missing Nobuiye) $560.00 or GOOD individual volumes @ $90.00 each. 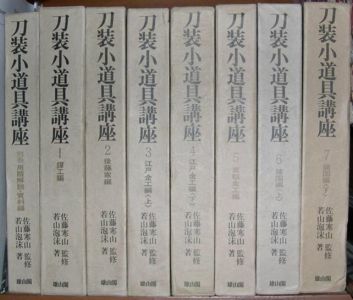 Eight volumes: 1935 to 1938. Sewn softbound, 7 ½ x 12”, about 100 pages per volume in Japanese. This may be the scarcest, most difficult to find book on kodogu. 8 volumes is the complete set and complete sets are almost never offered for sale. Hundreds of great fittings, both soft metal and iron, are illustrated. There is very little text; the books are mostly pictures. Descriptions of each volume to follow. Both volumes are a limited edition. 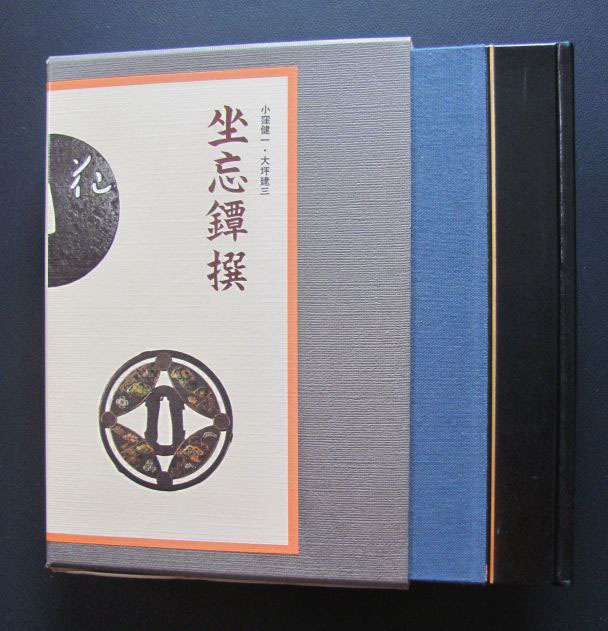 Clothbound with slipcase, 10 1/4" x 14 1/2"
Tosogu Gokecho Meihin Shusei, 2001, limited edition of 200. Book consists of 350 pages with many color photo's showing the exceptional detail of these works of art. Each item is described in English also and there is an English index at the back. This beautiful book presents the works of the seventeen generations of GOTO artists. 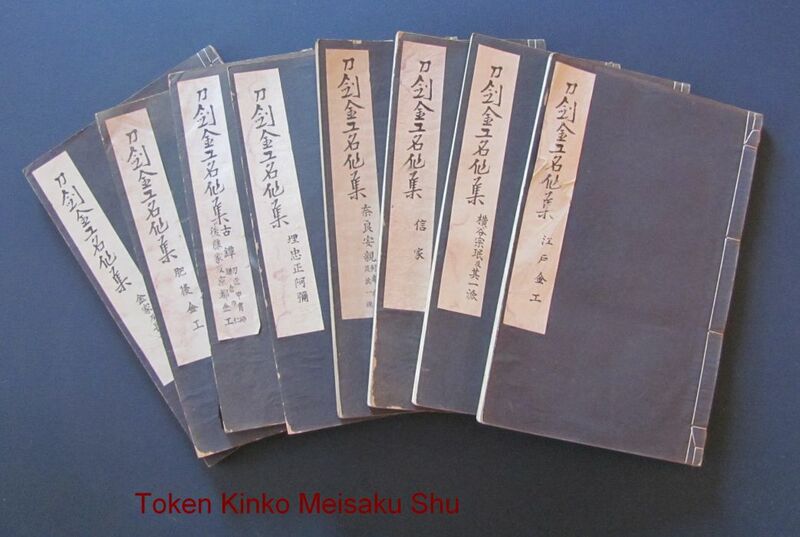 Beginning with four fold-out plates of exceptional koshirae spanning over 40 inches in width, this spectacular text continues with finest examples of each of the school's seventeen masters. As expected, oversized views of craftsmanship details and signatures are present throughout. This is an exceptional reference for serious students of GOTO work. 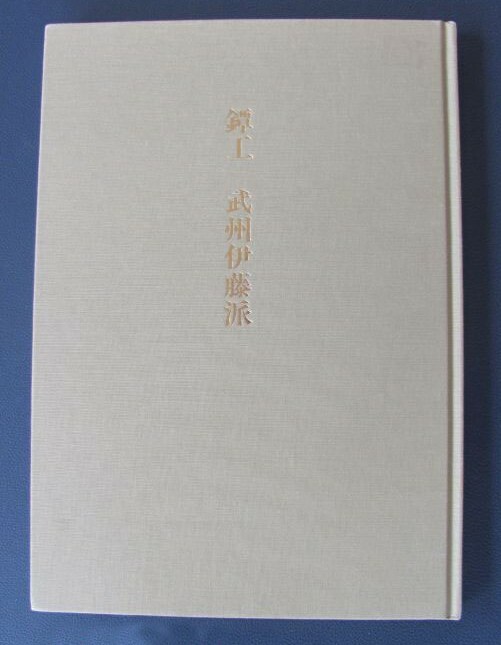 Tosogu Machibori Meihin Shusei, 2005, limited edition of 200. Machibori refers to the fine kinko artists who were not part of the Goto family. Book consists of 430 pages with many color photo's and with ten fold-out plates of exceptional koshirae. As expected, oversized views of craftsmanship details and signatures are present throughout. Index and descriptions in both English and Japanese. The large format provides unparalleled representation. In all, an exceptional reference for serious tosogu students. A very difficult book to find. This book presents the 17 generations of the Goto family, the most famous and some say the very best of the soft metal fittings makers. The work is undeniably beautiful, as is this book. Mostly black & white photos, life size and showing great detail. Includes many drawings, signatures and seals. A great reference in excellant condition. 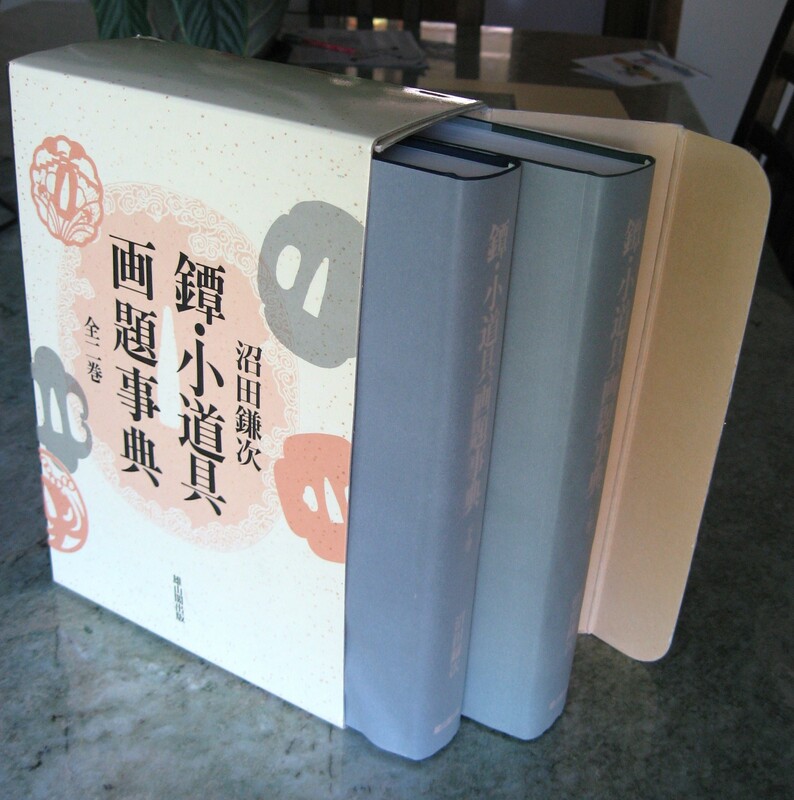 Clothbound with slipcase, 8 1/2" x 12", 258 pages in Japanese. Great tsuba, crisp photo's in color and black & white. A great reference in excellant condition. 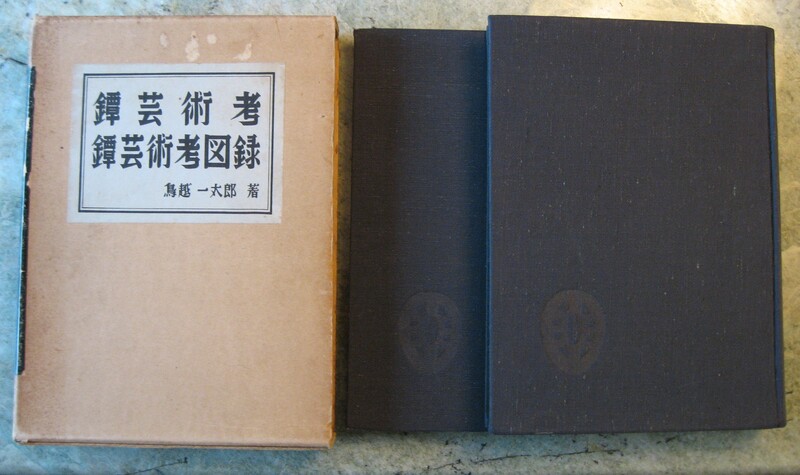 Clothbound with slipcase and storage box, 7 1/4" x 10 1/2", about 500 pages in Japanese. A definitive study of all schools and major artists. A detailed description is provided for each tsuba, both the ura and the omote. 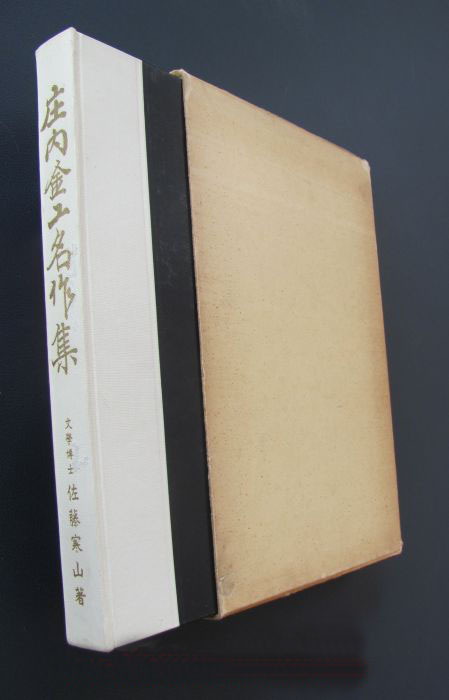 More than 500 plates, some in color, text in Japanese, dark brown texture cloth hardcover. The examples shown are catagorized into forty sections and represent top level works of their respective schools. .
275 pages, 8 3/4" X 12 1/4", hardcover w/ slipcase. This book is really worth having and provides a very wide coverage of iron plate and sukashi tsuba. This book is a must for any library. 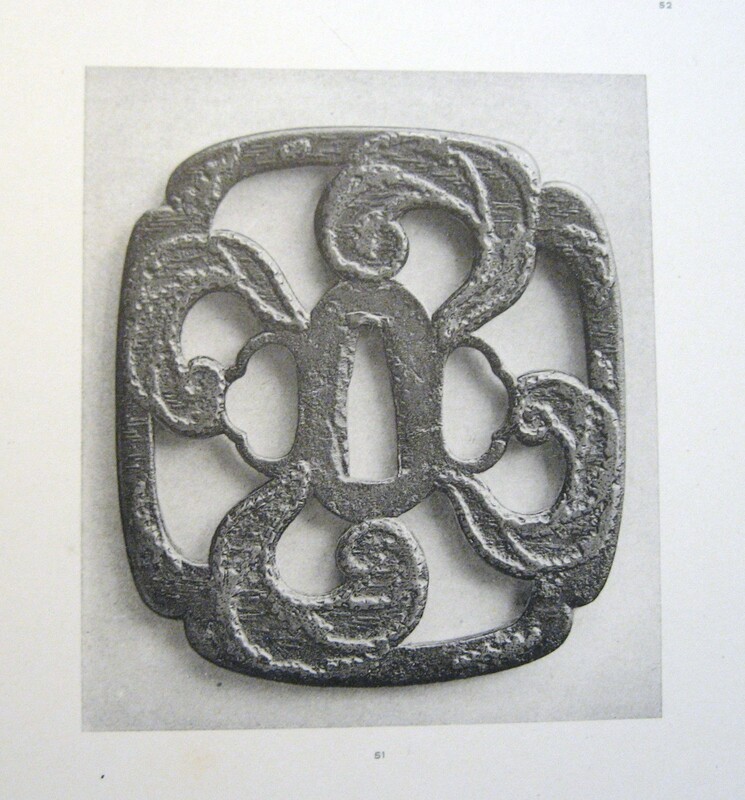 In Japanese with penciled translations of ryuha, the black and white photos and range of tsuba are very informative. 5 3/4in X 8 1/4in, 259 pages. Excellent condition. Japanese language. 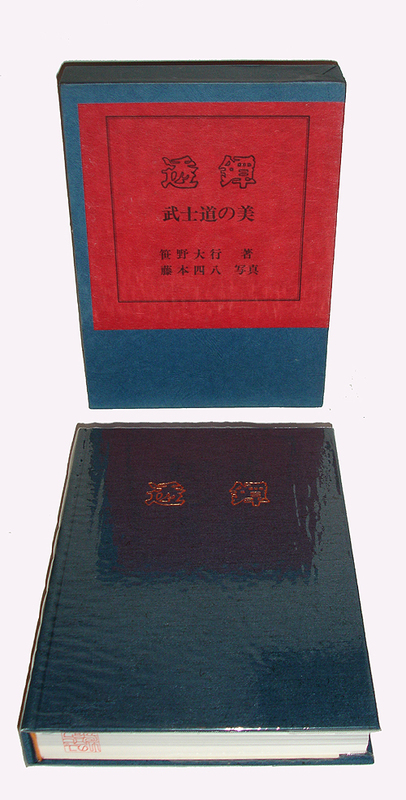 Clothcover with jackets and storage box, two volume set, 6 1/2" X 9 1/4", 565 pages vol.1, 492 pages vol.2 in Japanese. This is a combined re-issue of a three volume set by the same title. Each kodogu (menuki, fuchi, kashira, kozuka) and tsuba has an artistic theme (ie, what it trys to depict) and this "dictionary" attempts to list them all. Volume 1: Japanese and Chinese historical and legendary people, events, and places. Volume 2: things, animals, and plants. For each theme the dictionary gives: a) the name by which the theme is known; b) detailed description of the theme; and c) photo plate(s) of work(s) (mostly tsuba, some kodogu) on which the theme is depicted. Ribbon tied case holds 159 loose pages with 2 pictures of tsuba each, and a 65 page, softbound introduction. Some tsuba are shown both sides; other plates show 2 different tsuba. 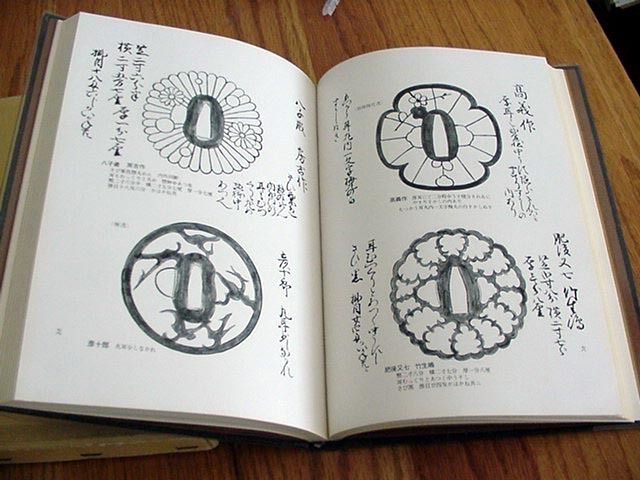 Each pictured tsuba is described in English and Japanese both;the introduction volume (list of plates, outline of tsuba history, short essays on schools of tsuba making, and a glossary) is 27 pages of Japanese and 38 pages in English. This book contains 318 selected important tsubas with English captions. The book is very easy to follow. Limited printings and it was not-for-sale book. 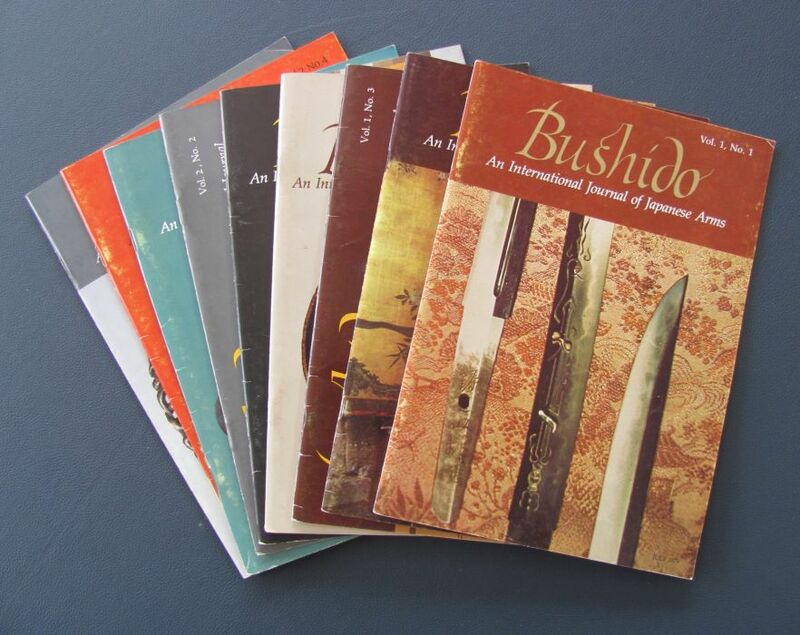 Book covers tsubas from Ko-Tosho to Edo Kinko. Edited by two Maestros, Honma and Sato sensei. Text 56 pages and Photos 317 pages, size is 8.5" X 11.6", thickness is 1.5". TSUBA TAIKAN by Noboru Kawaguchi, $NFS Tokyo, 1935. 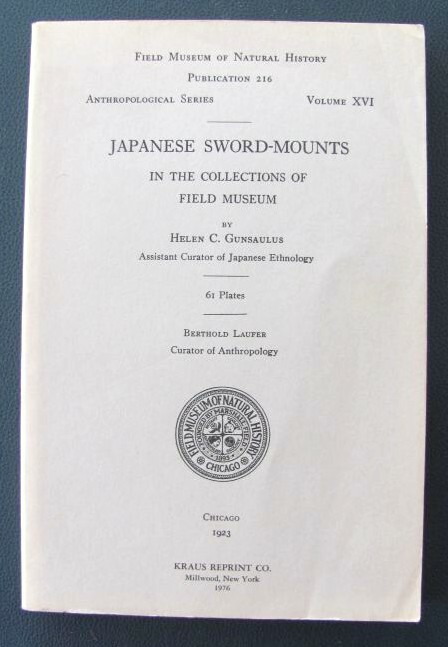 An original edition of this sought-after book on Japanese sword mounts. 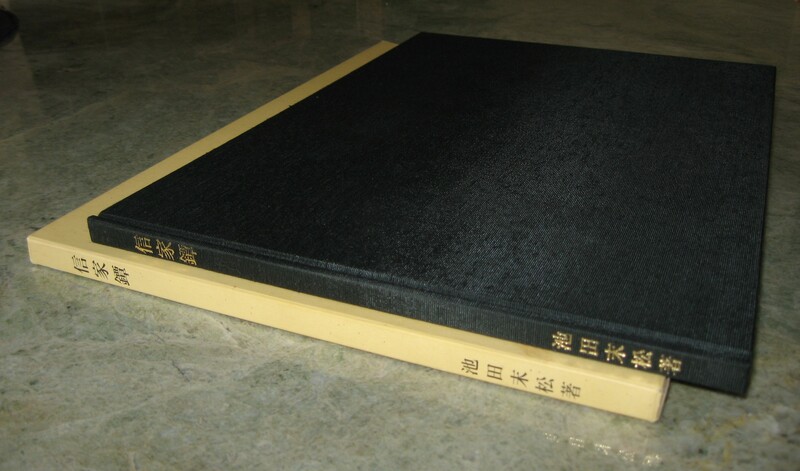 The most complete reference book of tsuba signatures. 414 pp. 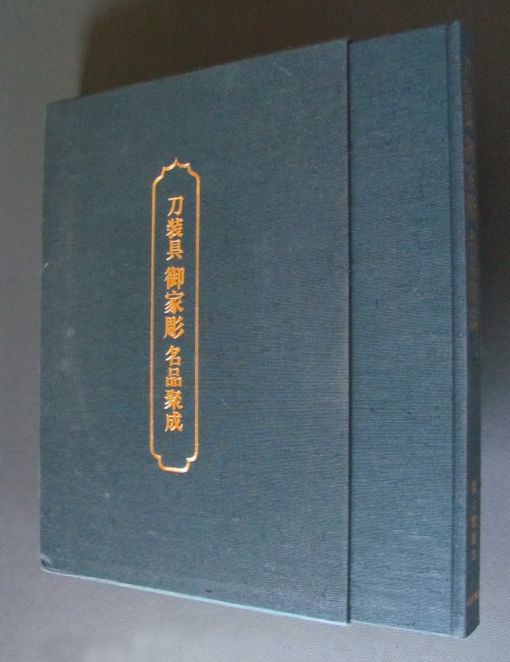 15 colour plates and 640 b/w plates, 23cm x16cm, decorative soft leather cover with slipcase, text in Japanese. A superior book, with excellent color illustrations, of the most famous examples of the works of Yasuchika. 74 pieces, tsuba, fuchi kashira, kosuka, and more, are presented in crisp black & white, life size, both sides pictures. 22 of the pieces (kinko) are shown also in tipped in color pictures. Text is in Japanese but at the back of the book each piece is discussed thoroughly, along with essays on tsubas and Yasuchika, all in English. 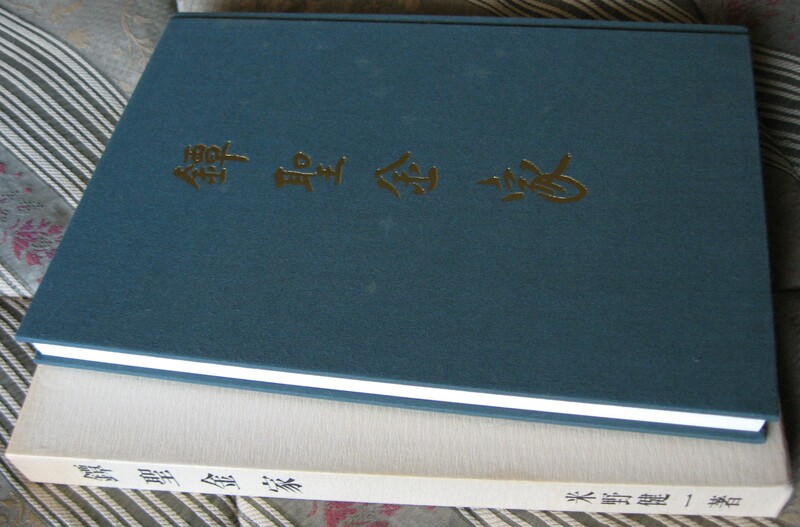 The middle of the book is pictures and text of works by other (related) artists and close-ups of Yasuchika's signatures. 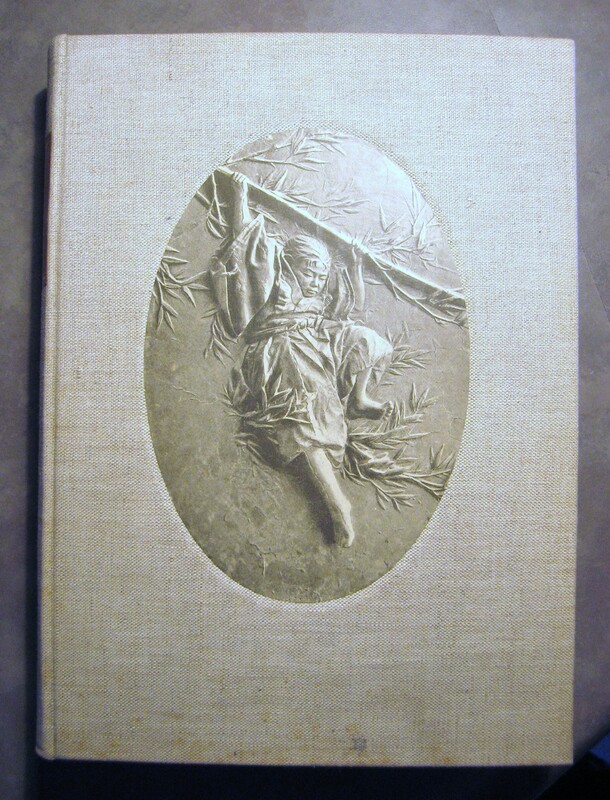 Clothbound with slipcase, 8 1/2" X 12", in like new condition. Sekibun was a well respected kodogu artists of the 1800's. This book is a study of his works. 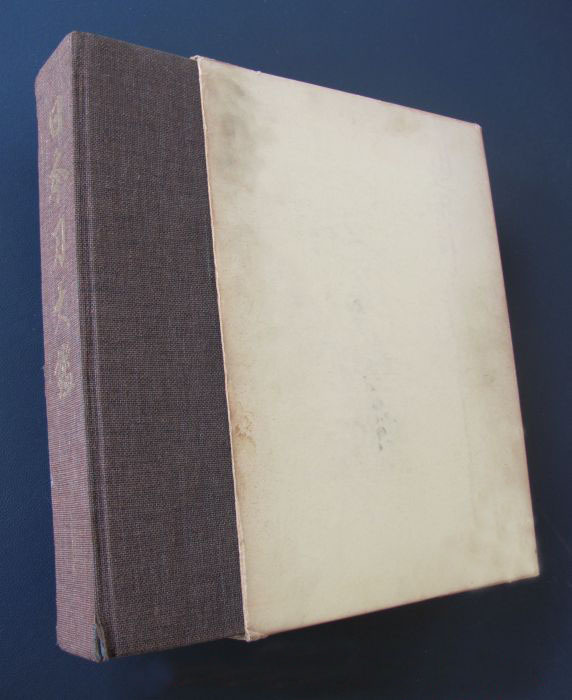 Hardbound with plastic jacket and slipcase, 7 1/2" X 10 1/4", in very good condition. After one has absorbed the available knowledge in the study of fittings of the Japanese sword one must reflect on its source. What was the origin of this information and how did it develop? If we do not have a full understanding of our primary sources we do not have the ability to judge what we have taken such great trouble to learn. What is more important, we cannot grow in our studies beyond these primary sources. Thus what are these sources and how and where did they develop? The printed material that is extant consists of a few woodblock printed books such as the TOBAN ZUFU (1753), by Matsumiya Kanzan, which was originally a few dozen rubbings and drawings of tsuba with some slight comments handwritten beside them. 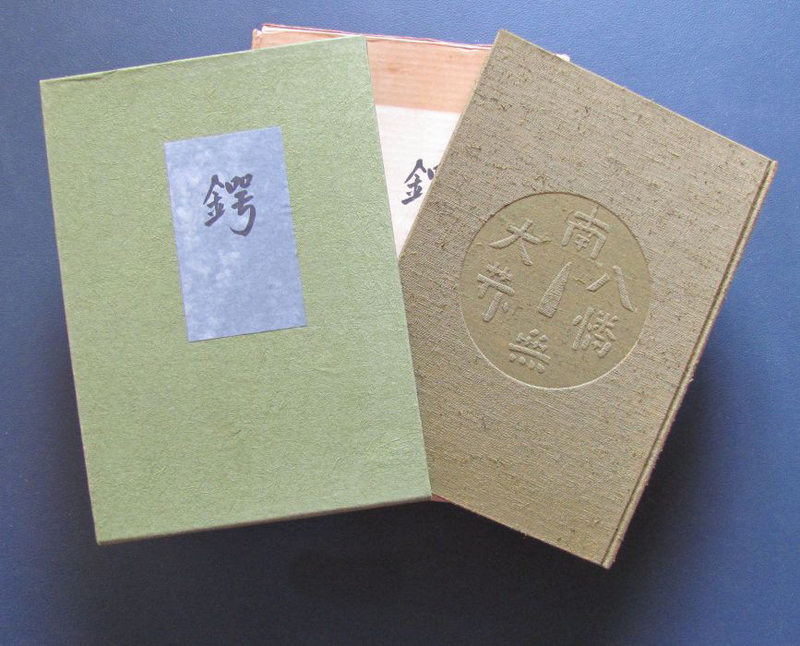 The TOBAN FU was another collection of drawings printed in woodblock form. The TOBAN SHINPIN ZUKAN, and The SOKEN KISHO (1781) by Inaba Tsuryo, which has the first small list of tsuba artists names and a few kao. There are such single artists or family design books as the NOBUIE TSUBA FU, HOAN TSUBA FU, and YAGYU TSUBA FU. These three are of far more historical interest than as text books. These few are all the sources we have from the Edo period. What we can learn from these and the few other early books that were for the most part private manuscripts? They do give us some history of our studies but not the true information that we need to study sword fittings. The first thing we notice is that the taste in tsuba was very different in the 18th century from that in the Meiji period, and that it was not dictated by collective taste, but by the individual author who compiled the work. This is only natural because tsuba had not been given their formal names and tags that they have today. Which brings up the point of when were the names we apply to tsuba today invented? It should be mentioned that these books and records of tsuba were not made to enlighten the public but to record examples of interest to the author of the book, for his private interest. They also are not records of the collections kept by great families to be used for their personal wear. 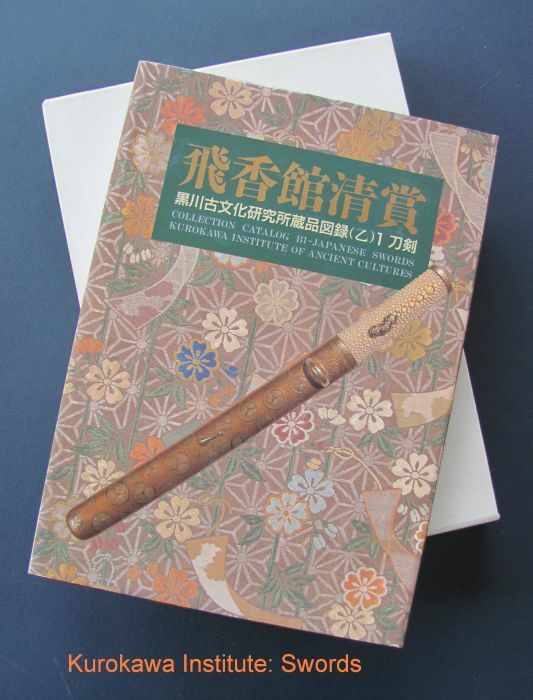 In one volume, a geneology outline of our country's (JAPAN) ancient and modern times carving artists. A Compendium of Soft Metal Artisans - Past and Present. 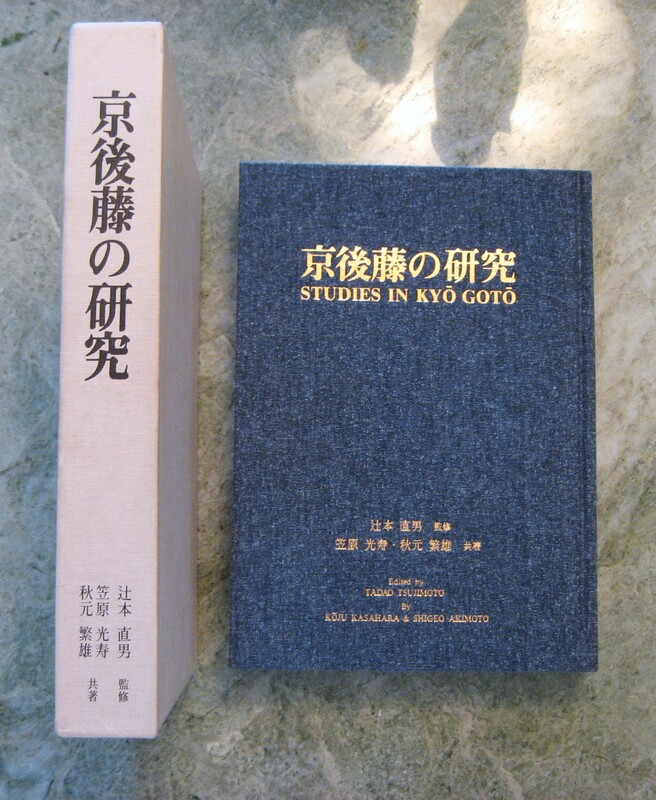 Two volumes with new Japanese string binding. No artist's name, no date. 114 illustrations of tsuba, each colored hand painted and tracing. 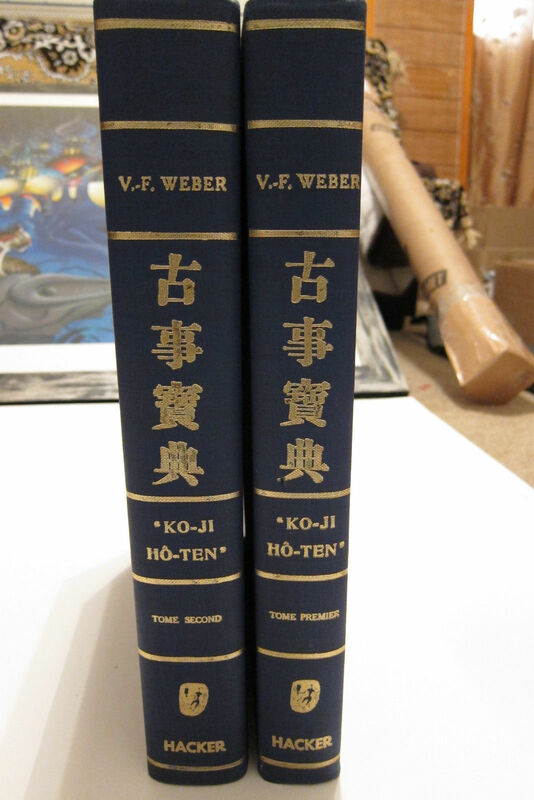 Volume 1 = Ken, Volume 2 = Kon, both volumes 13cm x 20cm. Very rare record of very important tsuba. 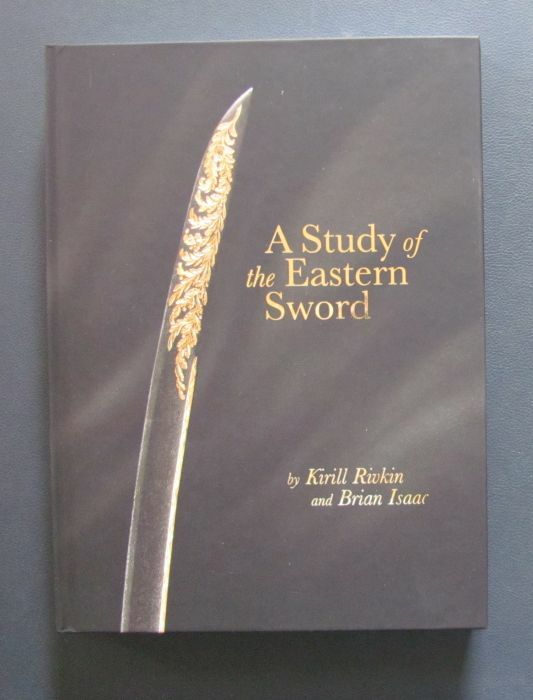 A STUDY OF THE EASTERN SWORD by Kirill Rivkin & Brian Isaac. $100.00. Published in 2017. Hardbound, 9 1/4 x 12 3/4", 359 pages in English. Quality binding, very thorough text with hundreds of crisp color photographs: great book. TEIRYO YOJI by Honami Koson & others.$350.00. Published in 1984. Hardbound, 9 1/4 x 12 1/4", 438 pages in English and Japanese. From a limited edition of 300 copies. 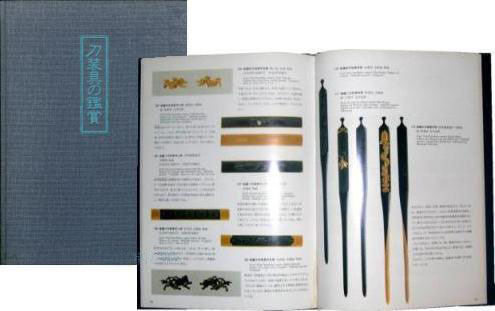 An encyclopedia of the Japanese sword and its mountings. 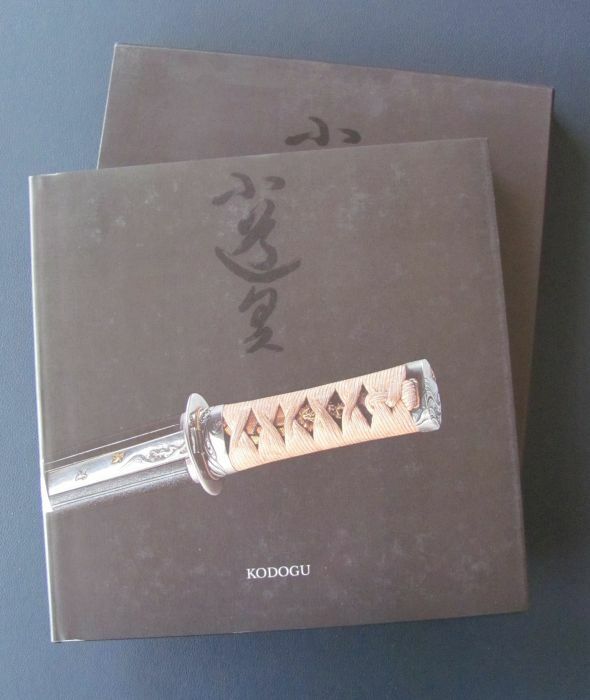 The book is entirely comprehensive and is essential reference for sword and tosogu collectors. Profusely illustrated and accompanied by an English translation. Both in excellant condition, main volume is 550 pages, companion volume is 153 pages plus 52 pages of index, in English and refers page by page to the main volume with expanded English explanations or definitions. Both are approx. 10" x 13" inches, Cloth hardcovers with slipcases. 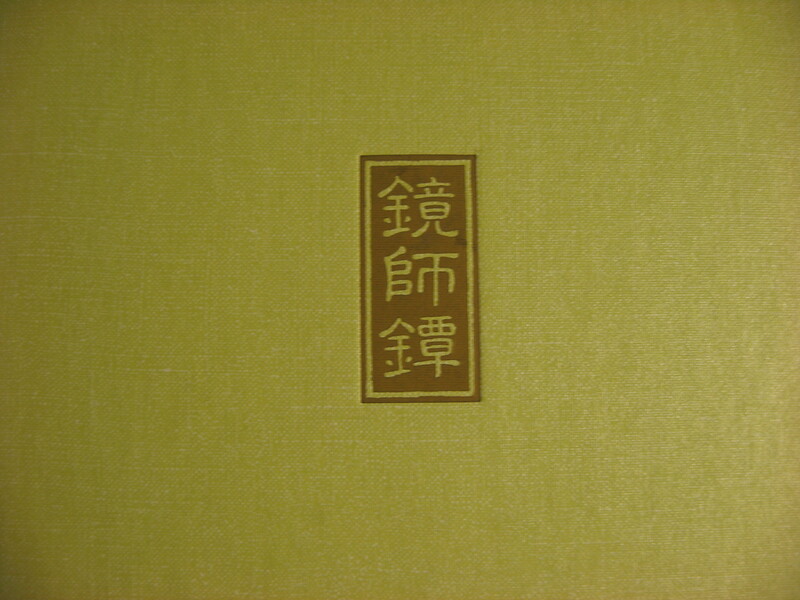 Volume 6, 'TO-KEN' Japanese swords by Sato Kanzan. In very good condition, 7 1/4in X 9in, 134 pages, published in Oct.1966. Volume 64, 'TOSOGU' Sword Fittings by Kajima Susumu. In very good condition, 7 1/8in X 8 7/8in, 108 pages, published in Sept.1971. Volume 70, 'LACQUER WARE' Kamakura Style Sculpture by Goke Tadaomi. In excellent condition, 7 1/4in X 8 7/8in, 110 pages, published in March 1972. Volume 127, 'BINGATA' (Kimono) Okinawan Traditional Dyed Cloth by Yamanobe Tomoyuki. In very good condition, 7 1/4in X 9in, 94 pages, published in Dec.1976. Volume 332, 'NIHONTO no BI' The Workmanship of Japanese Swords by Ogasawara Nobuo. NEW, 7 1/4in X 9in, 98 pages, published in Jan.1994. 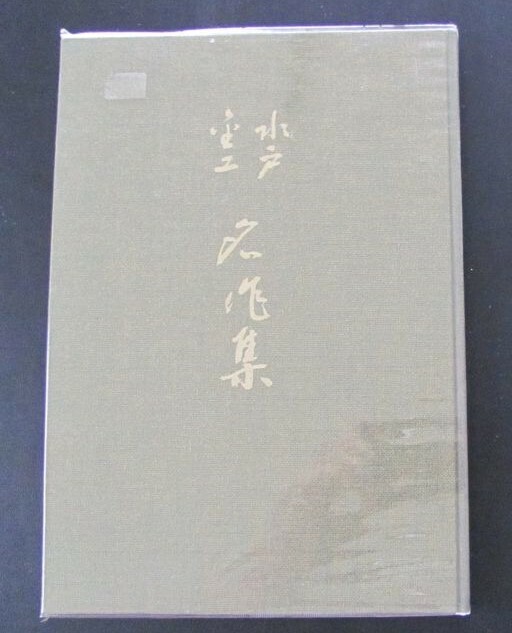 Volume 431, 'NIHONTO' Japanese Sword, The Fujisawa Otoyasu Collection by Hiroi Yuichi. NEW, 7 1/4in X 9in, 106 pages published in April 2002. 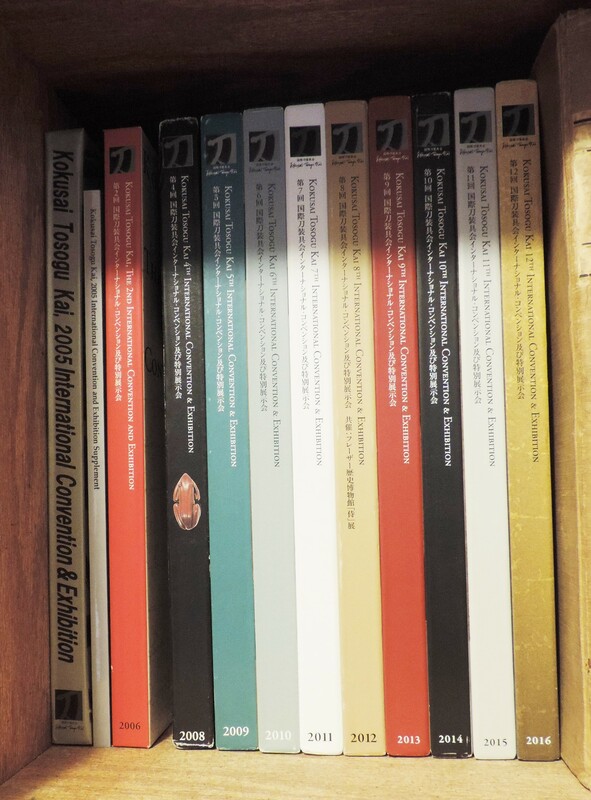 All volumes are published under the supervision of the National Museums of Tokyo, Kyoto, and Nara. 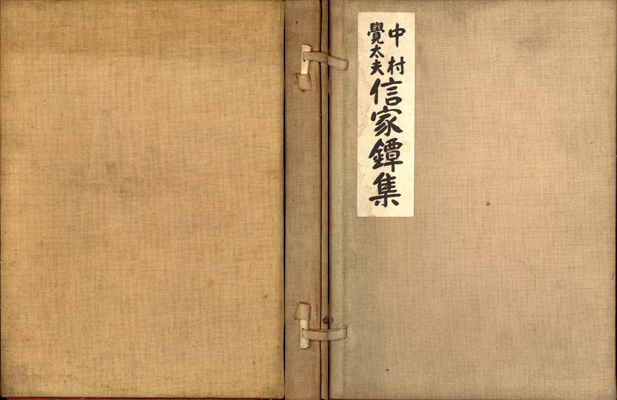 Each volume is part of a series titled "Nihon no Bijutsu (The Fine Arts of Japan)". Japanese language. 'Out of print' and very hard to find. 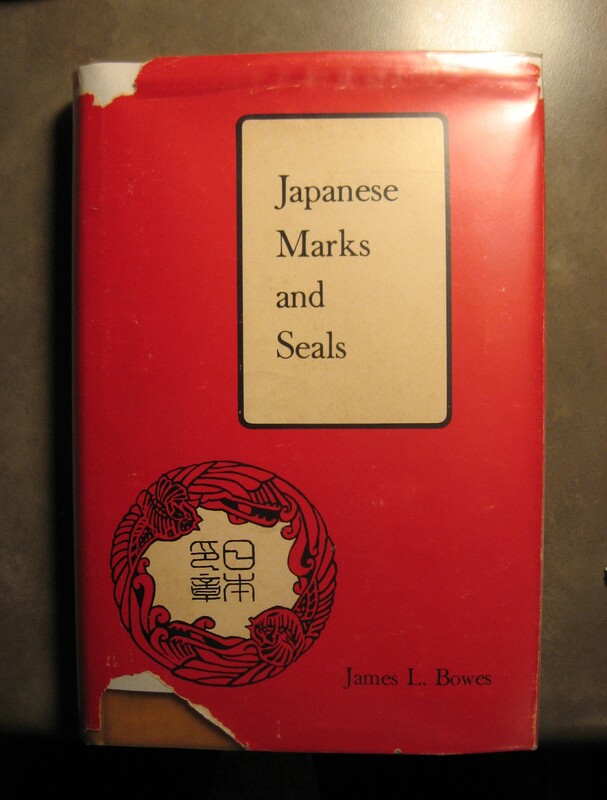 This is the only book written in English devoted to the subject of Japanese marks and seals exclusively. 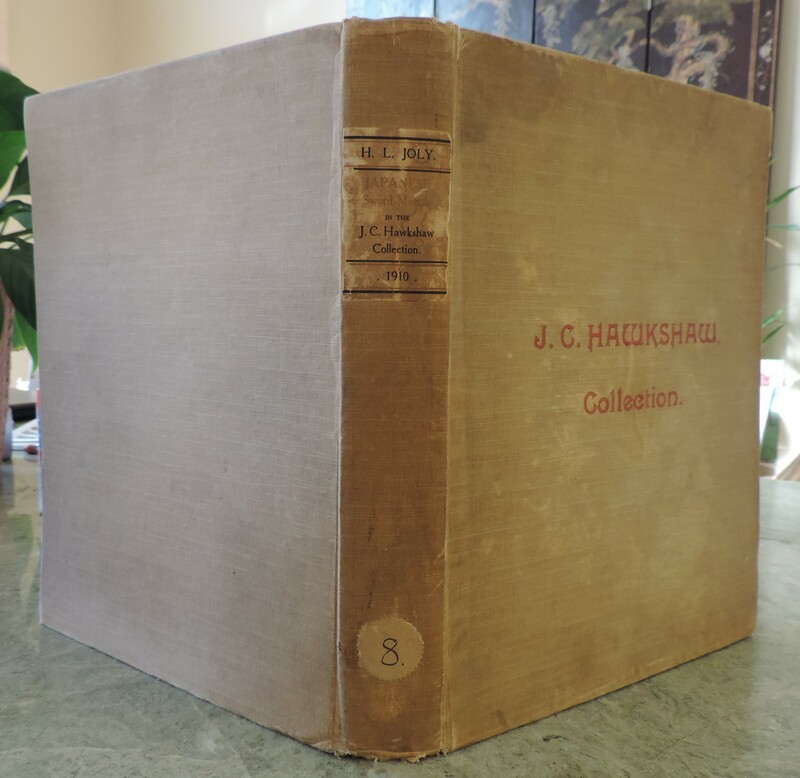 This volume contains some 553 marks which were taken from examples of marks found on pieces from the Dresden Collection, the Franks Collection, and the author's own collection. The student and collector will find this volume invaluable and an essential reference work to aid him in his study. If you have any questions or wish to purchase any book, please contact me at E-mail.